At PBT, our goal is to design and fabricate the finest, most meticulous product in our industry. As you will see below, our finished products speak for themselves. Please feel free to contact us to build your next tower. Now viewing All Available Categories. 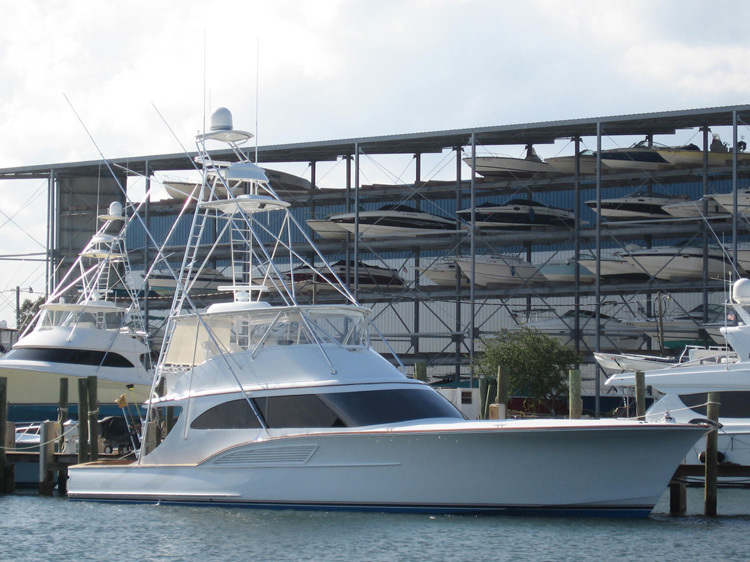 Boca Grande / 26' - 0"
PBT worked with Scopinich on this 26' Boca Grande project in 2014 as the boat got a complete overhaul at his facility in Stuart, FL. The frame was fairly simple with all (4) main legs mounting to the covering boards, did an arch style forward leg section for strength, nav lights and a few rod holders to top it off. 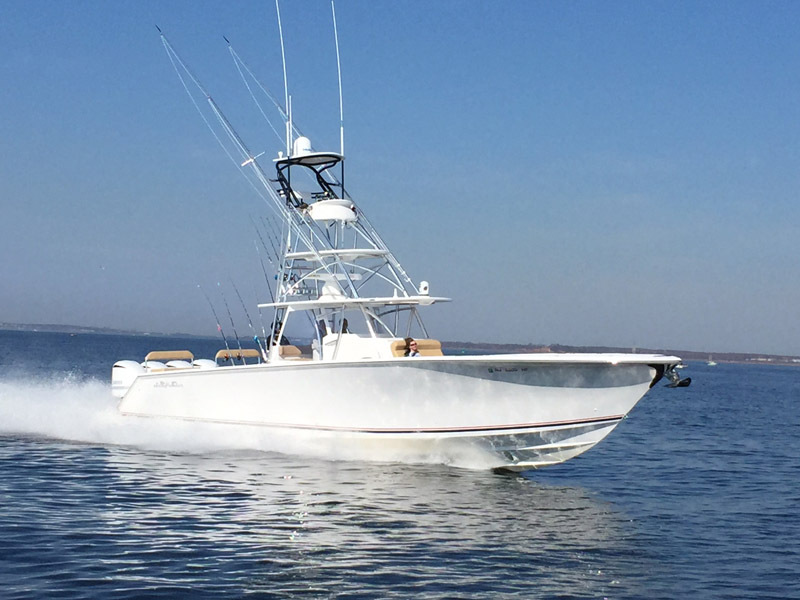 Buddy Davis / 28' - 0"
This center console received a brand new T-top powercoated frame with a fully customized fiberglass hardtop. The hardtop received taco top mount rigger, nav lights, radar pod w/ teaser reels, rod holders, handrails and used the existing electronics box. 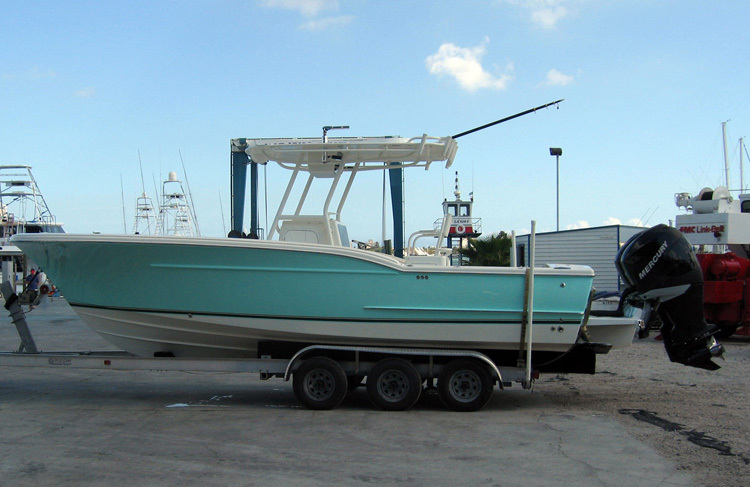 Gamefisherman Boats / 34' - 0"
F&S Boat Works / 36' - 0"
This custom outboard received a polished pipe t-top frame with nav lights, tri-colored lights and a small triangular radar pod. None Selected / 0' - 0"
This 50" control box came complete with the top painted Satin Black and a custom Venturi (plexi-glass wind & glare sheild) forward on the box. This box comes with all the same features as a 50" just larger all around. It can be just white or painted Satin Black on top (see photos). You will also have more room for mounting your electornics on top or through the acrylic door access on the face. This control box is the same as the standard 60" box except with the Venturi Windsheild mounted on the forward edge. This smokey acrylic windsheild not only breaks the wind but reduces the glare from the sun on your electronics. This pod style control box comes complete with single lever controls, flush mounted compass, room for electronic equipment and two single doors on the face for storage in the control box. This is our newest control box which comes with 2 optional recessed electronic boxes and lift up lids that are flush to the face of the box. It also has a built in fiberglass venturi to help reduce glare. This 65" control box comes complete with single lever controls, a flush mounted compass, (2) recessed electronic boxes on top w/ lids, (2) doors on the front face for storage inside the box and a pedestal mount on the underside. This large control box comes complete with a flush mounted compass, acrylic sliding doors on the face for storage inside the box and plenty of mounting space on the top for all your electronic needs. 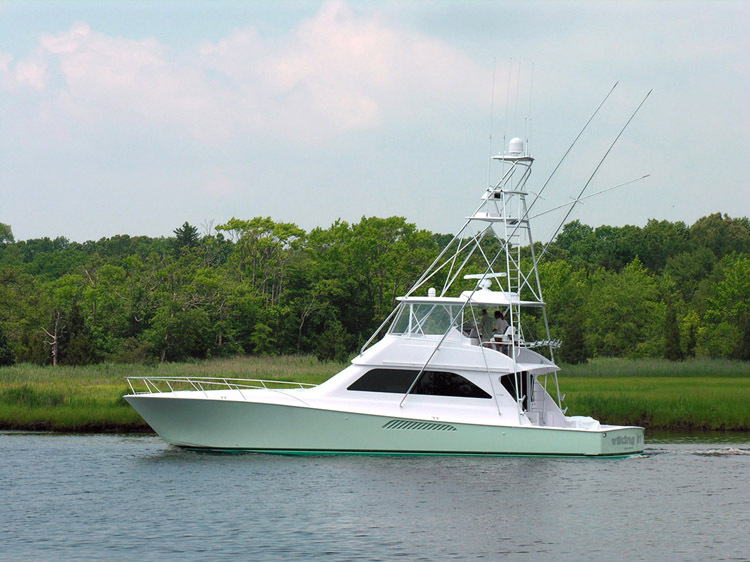 Jersey Cape Yachts / 36' - 0"
This Marlin tower was built with polished pipe, solid aft legs that turn into the control box, an 84" belly band and 32'-2 spreader Rupp outriggers. We also installed nav lights, recessed LED lights on the underside of the hardtop and our small radar pod. 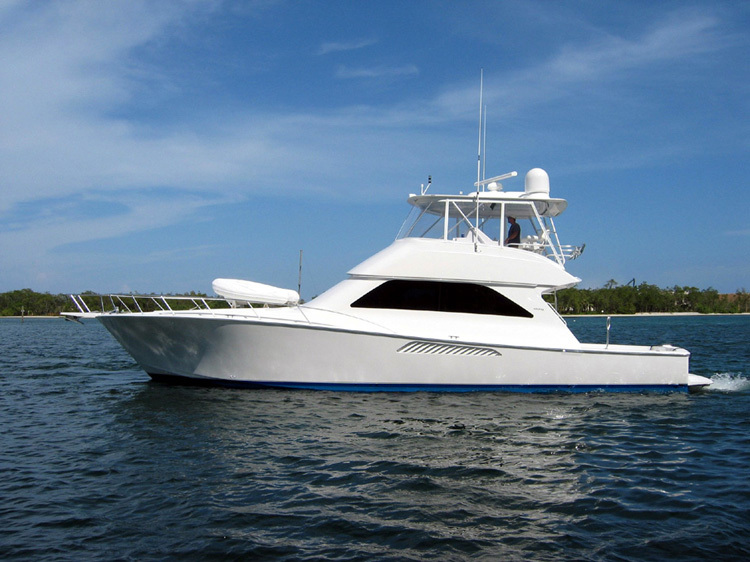 Venture Marine / 34' - 0"
PBT built the standard Venture t-top metal frame to match their current fiberglass hardtop. The t-top frame came complete with pipe sleeves, (6) rod holders and 4 handrails. 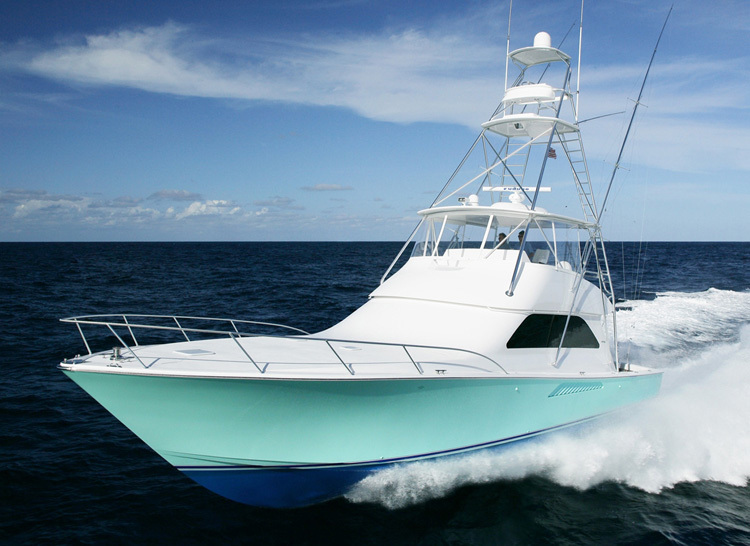 Bertram Yachts / 31' - 0"
This custom molded hardtop and frame received everything the owner wished it could have for such a small top. 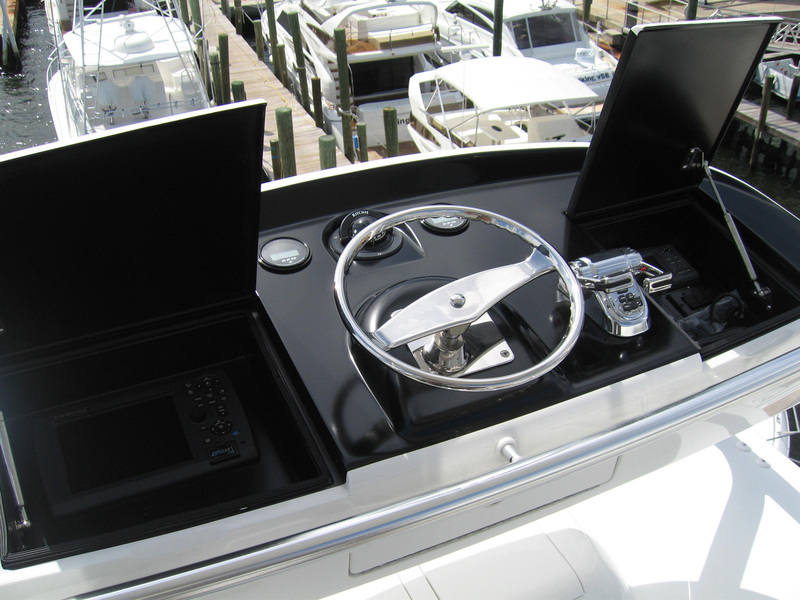 We designed and built a custom stationary radio box on the underside of the hardtop per the owners speced out electronics he wanted on his boat. We also installed 28' Rupp single spreader hydraulic outriggers with dual action lay down and hydraulic locking arms. 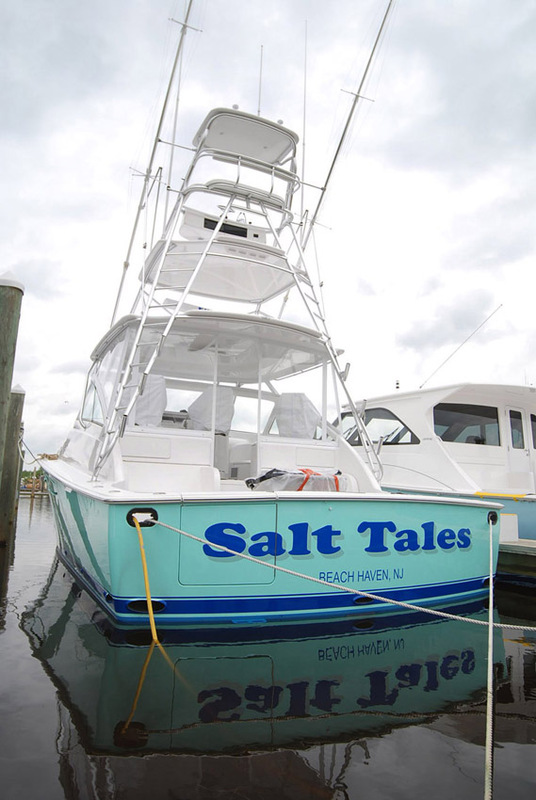 To finish off the hardtop we added customer supplied teaser reels, LED NAV lights, tri-colored LED lights, LED spreader lights and several rod holders to fulfill his fishing needs. 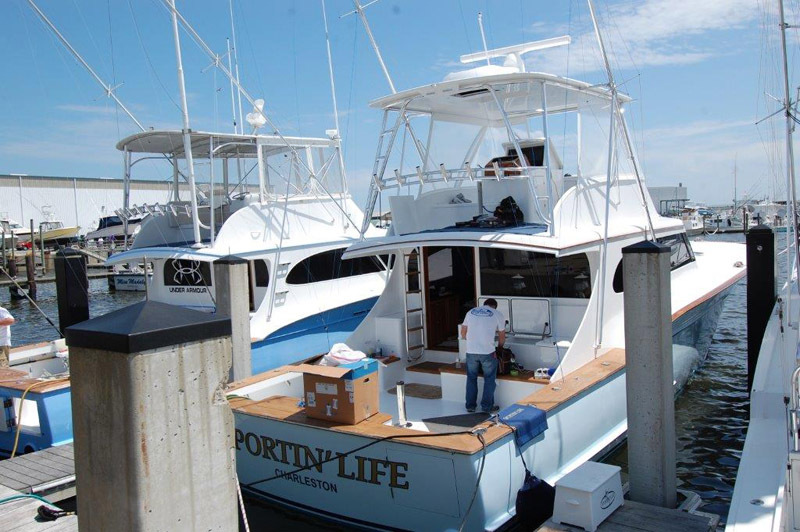 Willis Marine / 37' - 0"
When PBT was given the green to install the tower on the NEW 37' Willis Marine Walk-around, we were extremely excited. The boat threw a few challenges at us, but we were able to over come them with this final design that you will see in the photos. We had to mount the forward and aft legs into very small fixed areas, installed the rod holder rack above the hardtop and installed our smaller new LED spreader lights. The hardtop received a fixed stationary radio box, painted underside, bomar hatch and hardtop mounted outriggers. As for the standing platfrom, we cut in our easy access openings, installed our smaller single coupler box and mini light pods on the underside. Finally we tightened up the ring to accept our smaller control box and sunshade. 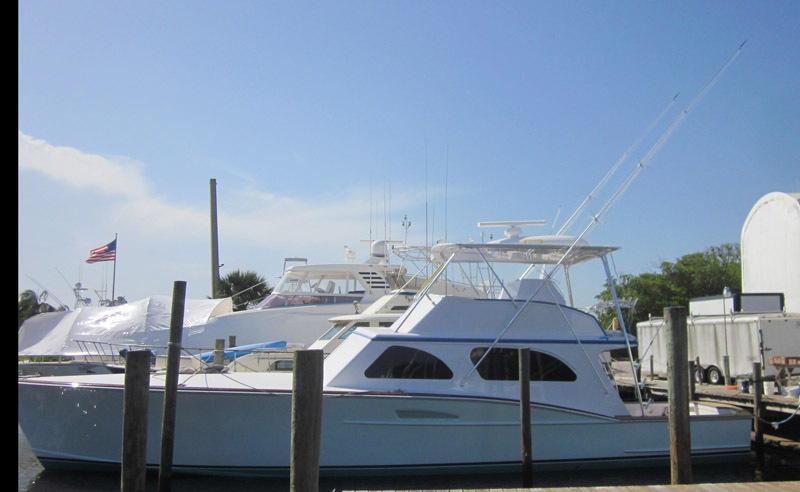 The owner, captain and Willis Marine were very pleased with the look/design and the quick install of the tower. 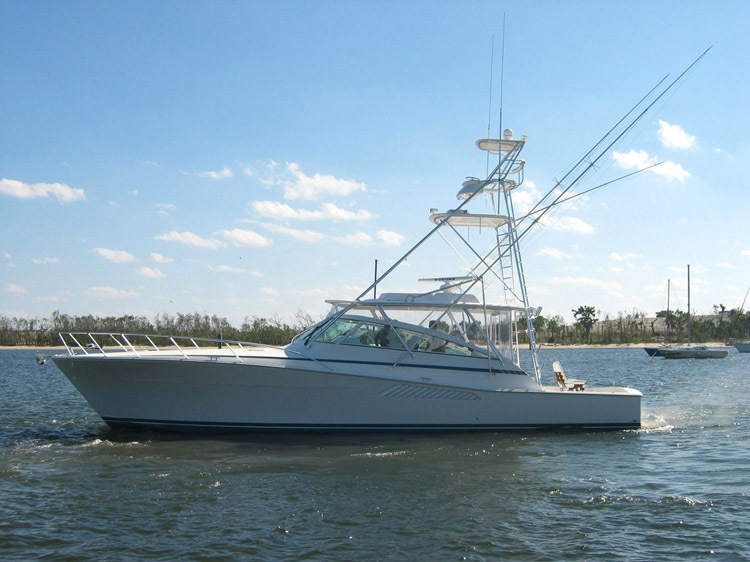 Knowles / 38' - 0"
Cabo Yachts / 33' - 0"
Cabo Yachts / 35' - 0"
This cabo express boat has a 4' Gap with hardtop mounted 32'- 2 spreader outriggers and rod holders on the hardtop aft rail. 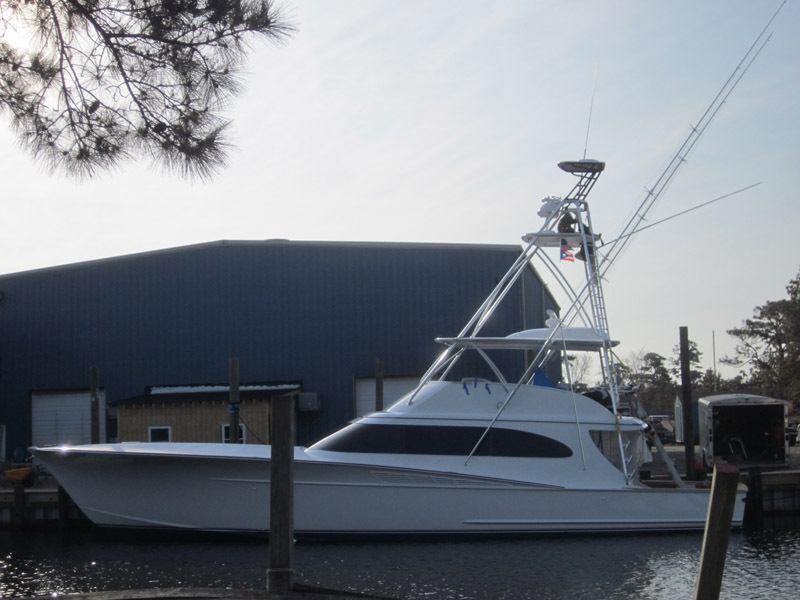 Jersey Cape Yachts / 40' - 0"
PBT completed this 40' Jersey Cape Express hardtop and truss frame back in December 2014. Below are a number of photos of the finished product. 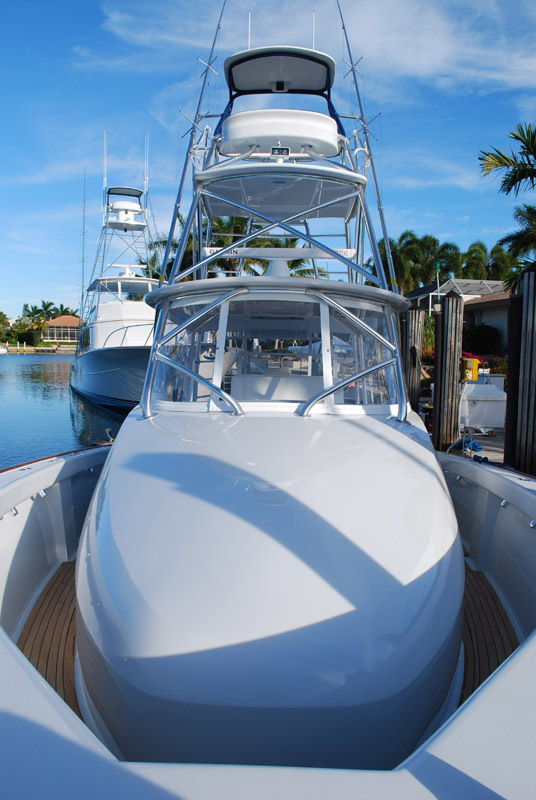 We installed top gun riggers on top, recessed manual teaser reel cranks, recessed LED lighting and bomar hatches in the hardtop. 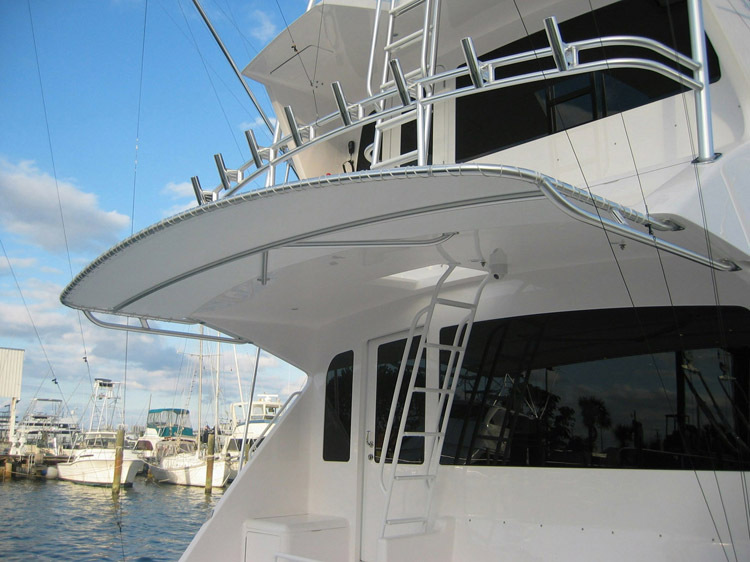 We also installed a new bow rail on the boat 3 months after it came to Florida. 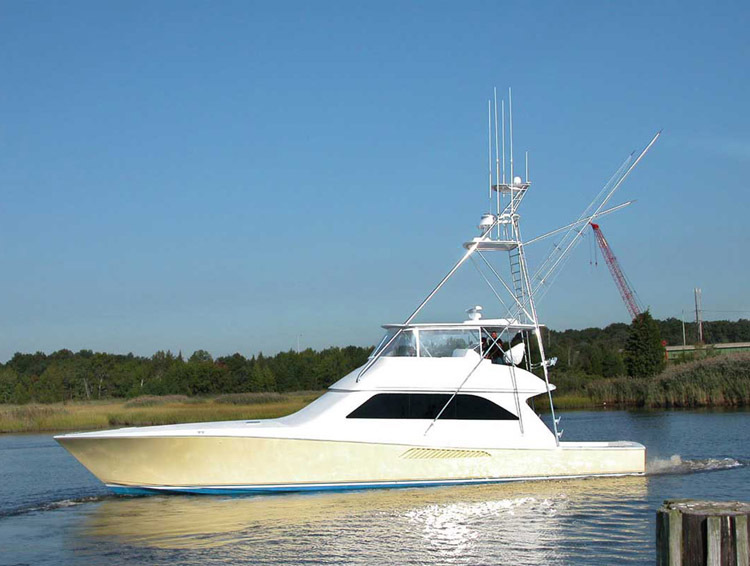 Grady White Boats / 37' - 0"
Installing a tower on the 37' Grady White while integrating our tower with the factory hardtop and frame was quite the challenge. First, we had to create custom forward hardtop pads for both the top and bottom of the hardtop. Second, we had to add a custom truss in between the front legs below the hardtop but also having to miss the forward windshield door that opens up so you could get to the front of the boat. 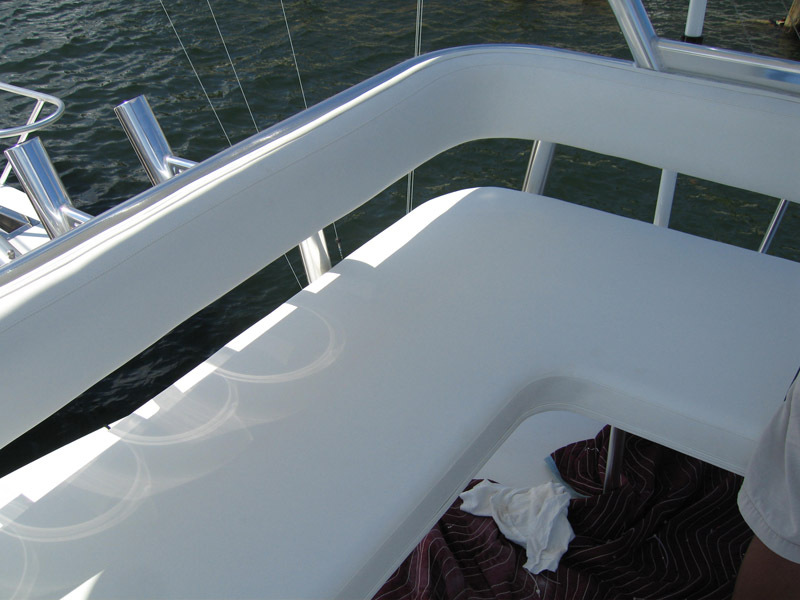 We also had to create spacers between the hardtop and our perimeter rail as we were unable to bolt our perimeter rail directly the hardtop fiberglass as you will see in the photos. 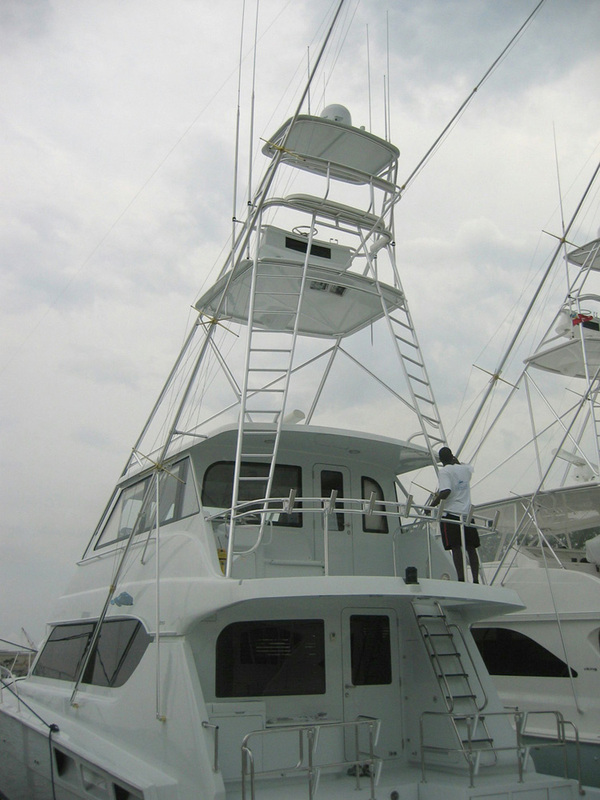 Some other items we installed on the tower were a custom radar mast, rod holder mounted on the inner ladder legs, rod holders behind the tower sunshade seating, (2) rod holders off the side of the tower ring and 31'-2 spreader Rupp outriggers. On the platform we installed LED spreader lights and LED down lighting. 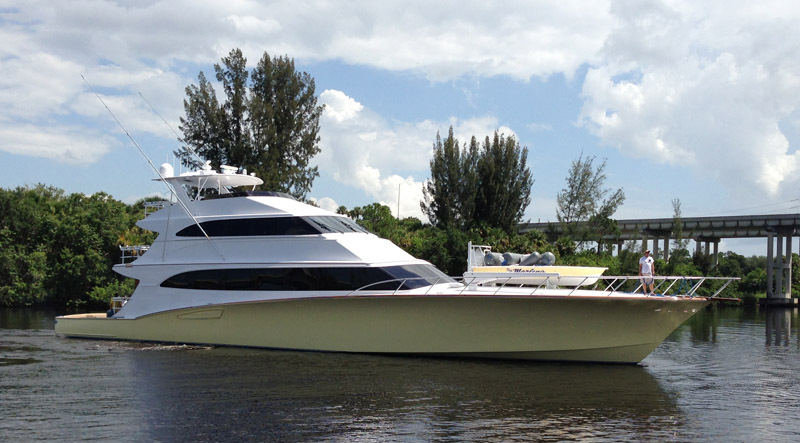 Rampage Yachts / 41' - 0"
This 41' Rampage express would be the first one PBT completed over in Anna Maria, FL at Galati Yacht Sales. The tower received a 4ft gap polished pipe with (2) dual rod locker storage boxes on the underside of the hardtop. We also installed tri-colored LED lights, nav lights, (3) LED spreader lights, our 60" control box and Rupp 31'- 2 spreader outriggers mounted on the hardtop. The enclosure was also (4) sided Strata-glass. 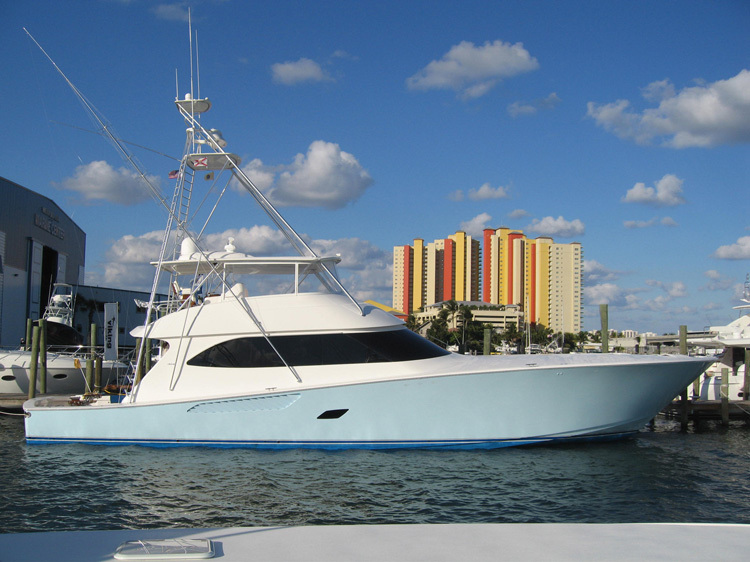 Viking Yachts / 42' - 0"
On this Marlin tower, we designed the tower to fit the customers needs which was to feel like he had a cruising style tower. So we installed a longer and lower benchseat with backrest up in the tower and bomar hatch in the hardtop for more air flow. The tower also received LED spreader lights, rod holders on the inner aft legs, (4) sided enclosure and 30'-2 spreader Rupp outriggers. 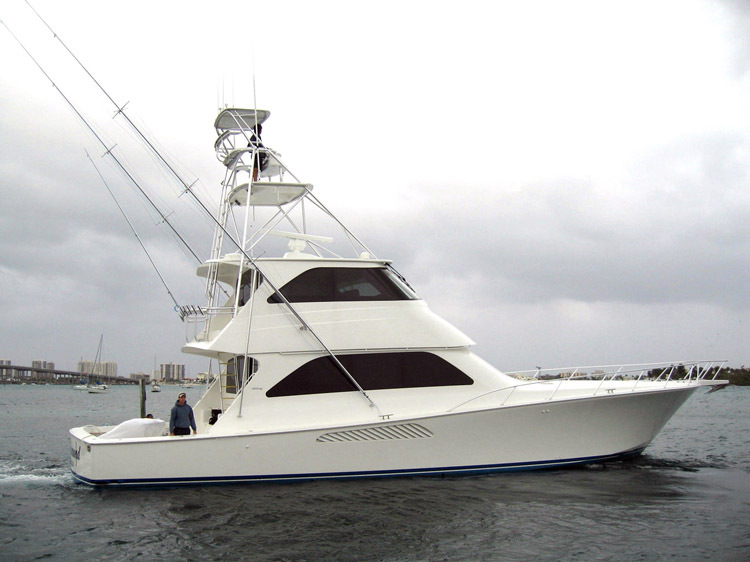 Bahama Boat Works / 41' - 0"
PBT installed a full size tuna tower on this 41' Bahama. 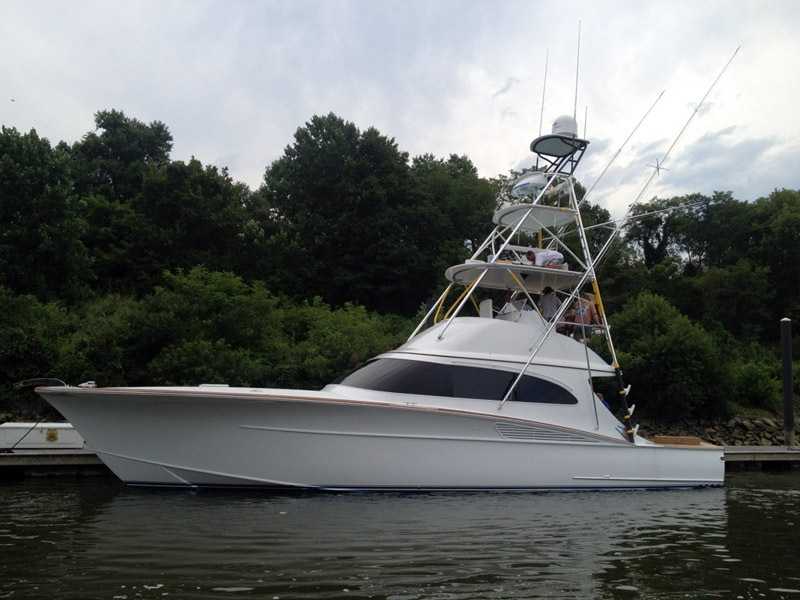 Complete with 29' Rupp outriggers, custom LED lighting, recessed tri-lights, control box and teaser reel opening for reels. It was also built out of all polished pipe. With all the newest features on the 42' Viking Express, like the lift up mezzanine we had to re-engineer the aft ladder section of our tower so that it would not interfere with their mezzanine. As you will see in the photos, we twisted the inner ladder leg to be parrallel with the boat forward to aft. Thought it may look awkward, it functions real well when climbing up the tower. We also installed on this 4' gap tower, LED NAV lights, tri-colored LED lights, mini LED spreader lights, easy access fiberglass in the platform fiberglass and 31'-2 spreader Rupp outriggers. 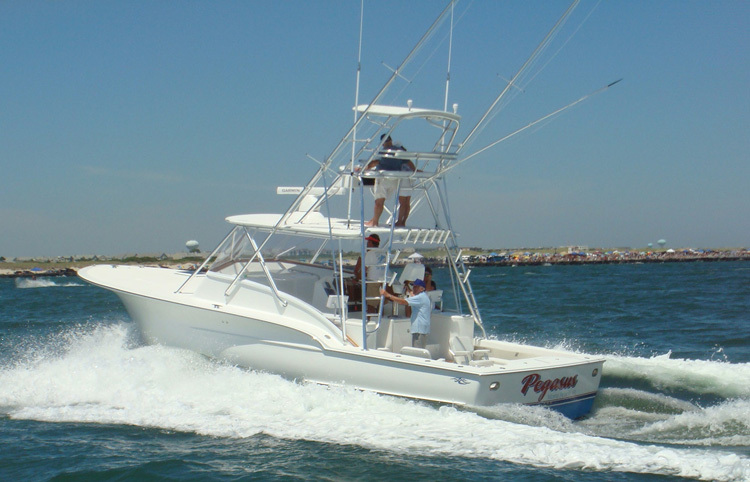 Rybovich / 42' - 0"
This is an Express Marlin tower with hardtop mounted & sunshade release outriggers with (25) rod holders mounted on the aft section of the tower. 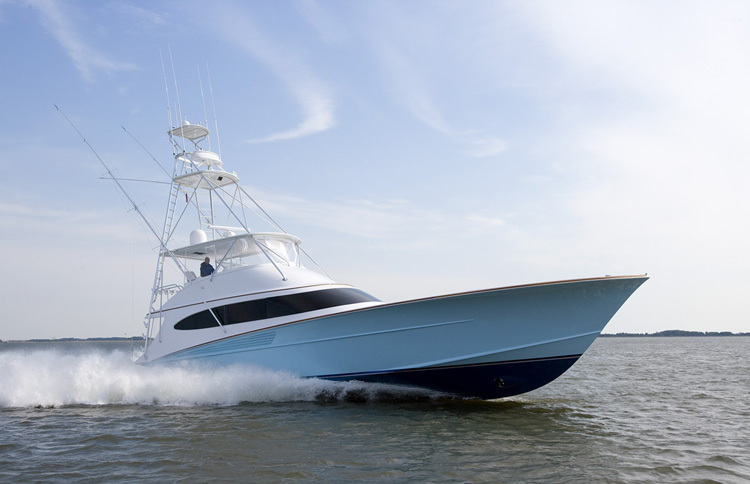 Invincible Boats / 42' - 0"
PBT was given the opportunity of designing, building and installing the most custom tricked out tower package ever installed on a outboard style boat. Mr. Leon and his highly experience team had a very detailed list of ideas and options they had to have designed into the ultimate tower for their fishing style. Together we spent numerous hours in CAD design to develop a super clean look with curved forward legs and bracing, along with our signature curved fiberglass parts. 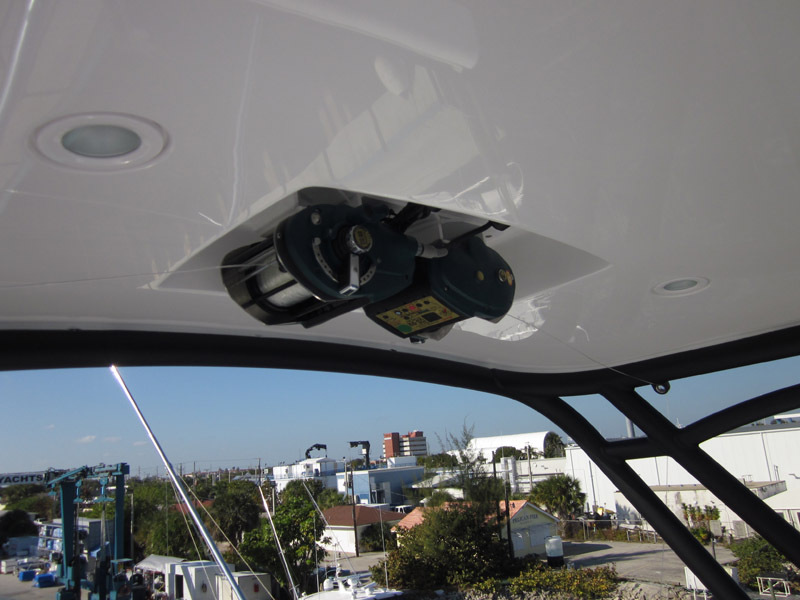 One new feature was a molded sealed kite locker with shelves on the underside of the hardtop, followed by a molded electronics wedge and recessed electric teaser reels with remotes to the tower control box. 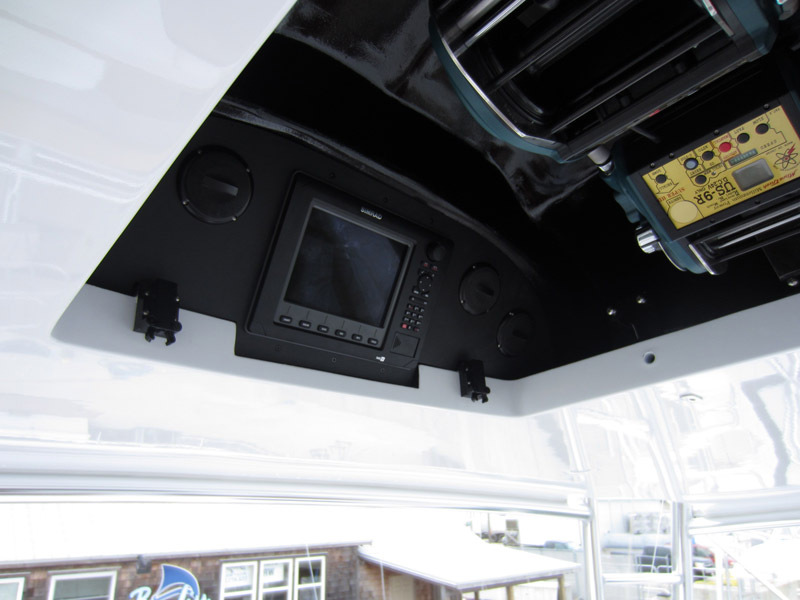 The upper end of the tower was designed with a full complement of electronics including a 12” Garmin display, night vision and search light controls, full engine system and bow thruster joy stick. 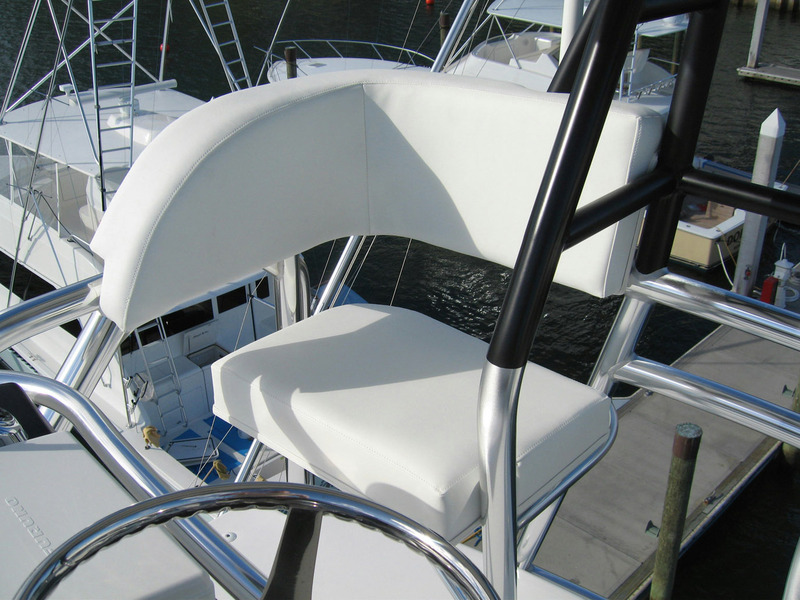 For the Miami style of fishing, we also welded two rod holders onto the bench seat backrest, for the team to be able to quickly cast to tailing Sailfish. Another nine rod holders were welded throughout the tower for storage and the ones on the aft main tower legs have integrated steps for ease of climbing the tower. We also designed a six holder rocket launcher into the deck live well for the perfect live bait set up. Another trick feature, because this team tournament fishes in extreme conditions, we molded in a drip ledge aft on the top, so the crew sitting on the mezzanine will not get soaked with water. Five LED spreader lights provide bright lighting for their night fishing trips, along with tri-colored lights for accent. 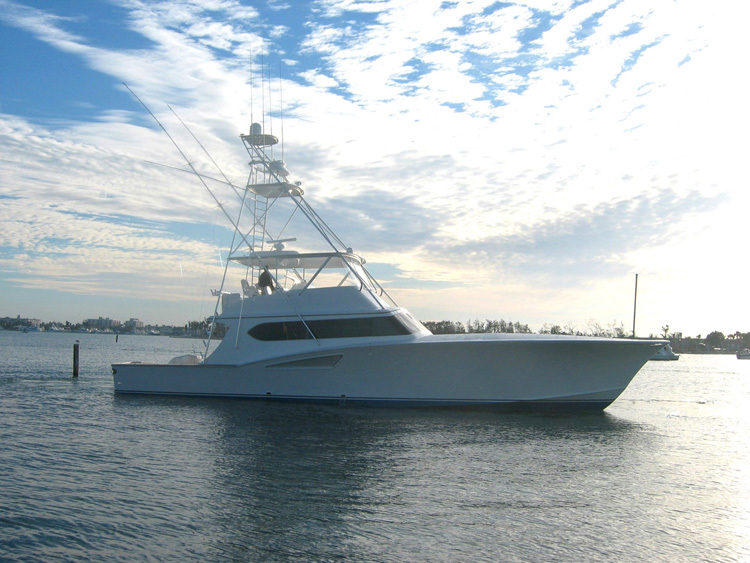 To finish off the ultimate fishing machine, we installed 28’ single spreader riggers on the hardtop, to provide the spread this team needed for all their trolling in the Bahamas. 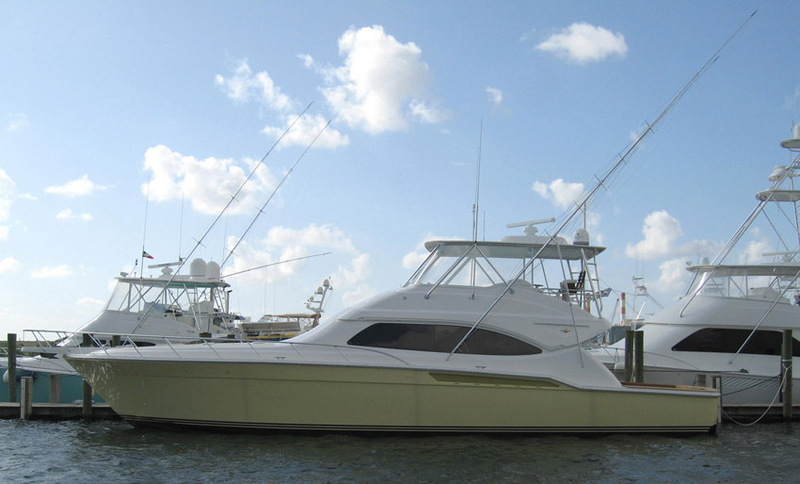 SeaHunter / 43' - 0"
This was the first Sea Hunter PBT ever worked on and it was such a pleasure working with not only the owner and captain, but the manufactor as well. 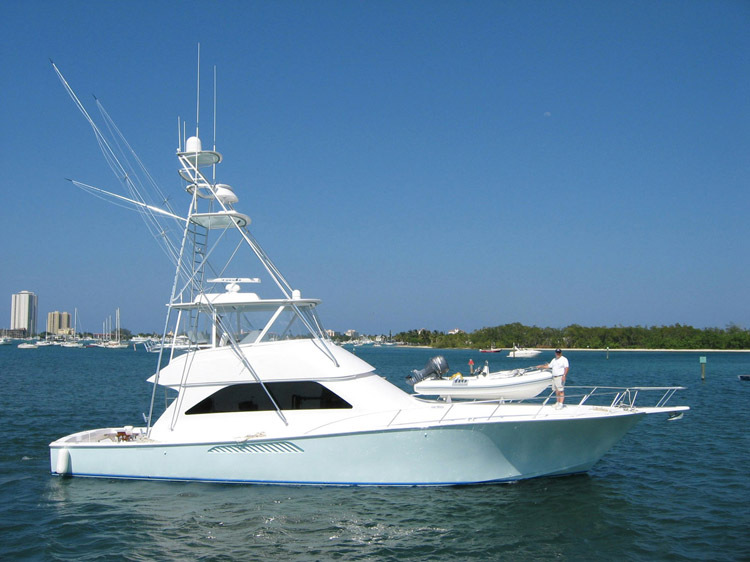 This 3' gap, polished pipe tower received a number of options including custom tower reel seats off the belly band, 28' single spreader Rupp outriggers, rod holders with the steps mounted on top for climbing into the tower, nav lights, led overhead and spreader lights and two removable backrests seats with cushions. We also had the upper control box and sunshade frame painted with a satin flag blue paint. 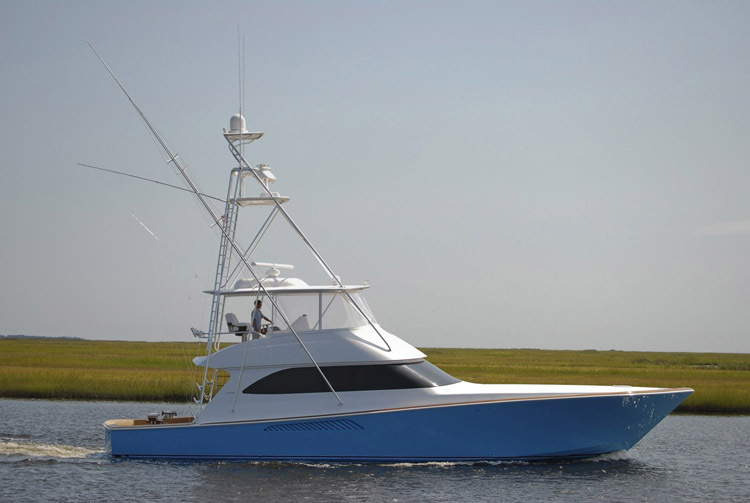 Release Boat works / 43' - 0"
Release Boat Works and PBT teamed up to design a Marlin style tower for their new 43' Walk Around for a customer who wanted a very Comfortable tower for fishing and diving. The belly ring area was enlarged to provide a real nice L shaped bench seat with extra padded cushions and backrests to sit (4). A full lounge to the Port side to relax & enjoy the sites all day. 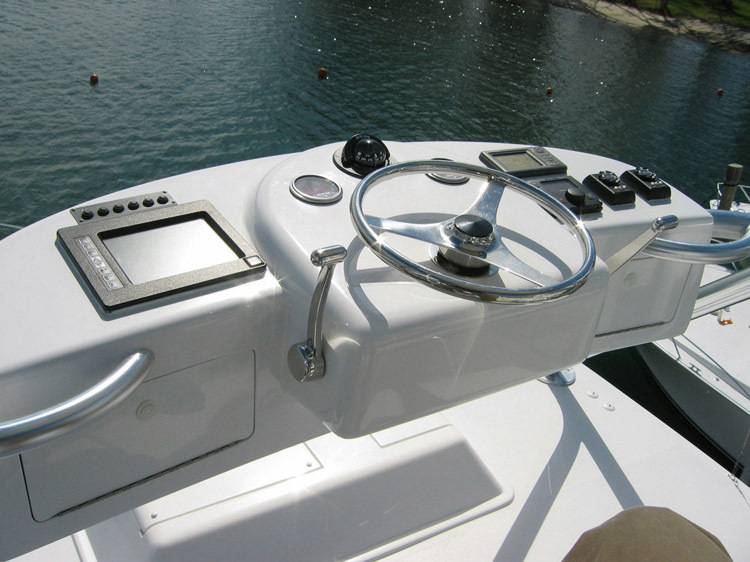 For fishing, PBT provided a 65" control box with pod style single lever controls and recessed boxes on each side to house all of their electronics and monitor displays. 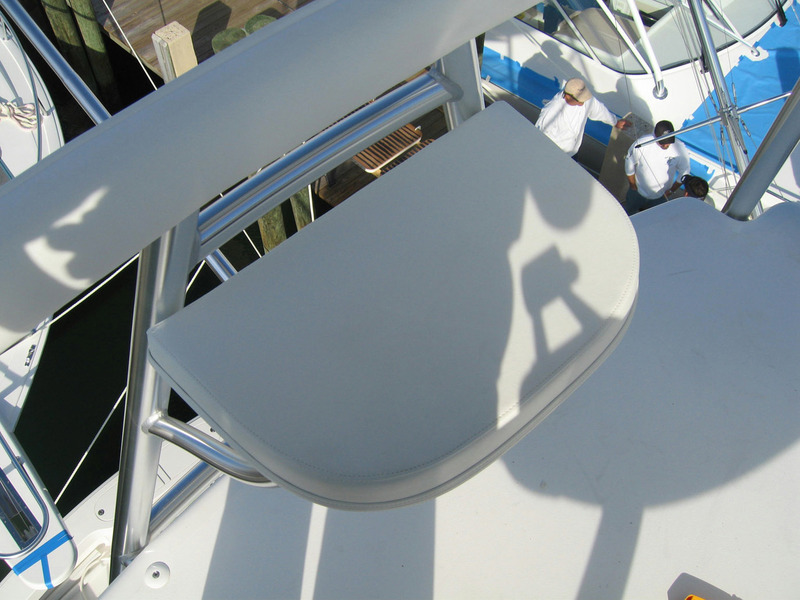 While looking aft at the baits or fighting a fish the aft backrest removes and slides into storage pins under the seat. The tower sunshade provides cover for the entire upper area of the tower and holds the radar and electronic antennas. 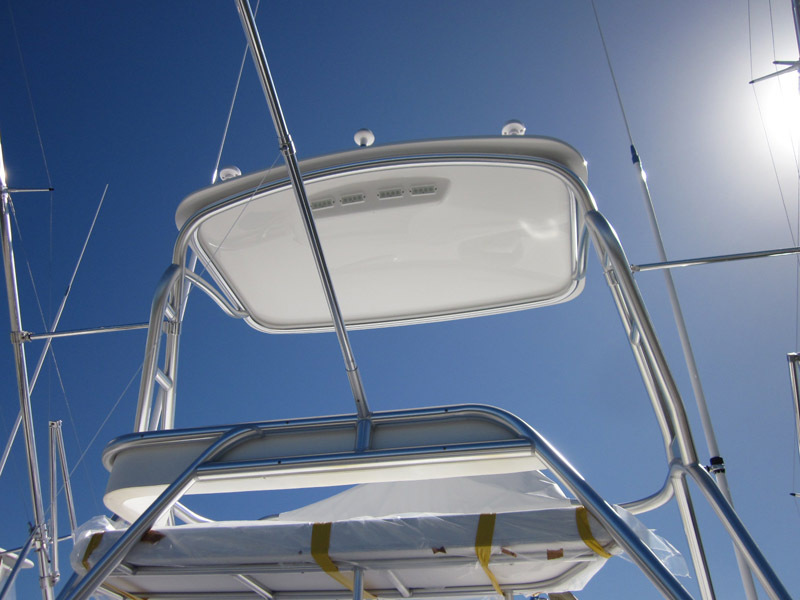 The 34'- 2 spreader outriggers were mounted on the hardtop to allow the angle to move 360 degrees around the entire boat while fighting a fish. PBT and Release are currently working on (2) more custom projects. 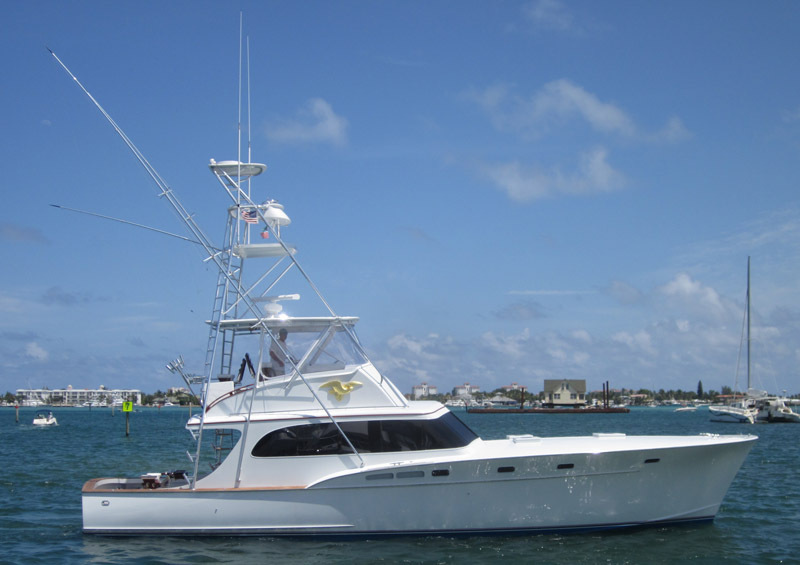 Check this summer to see the 46' Express sporting her 5' Gap PBT tower. 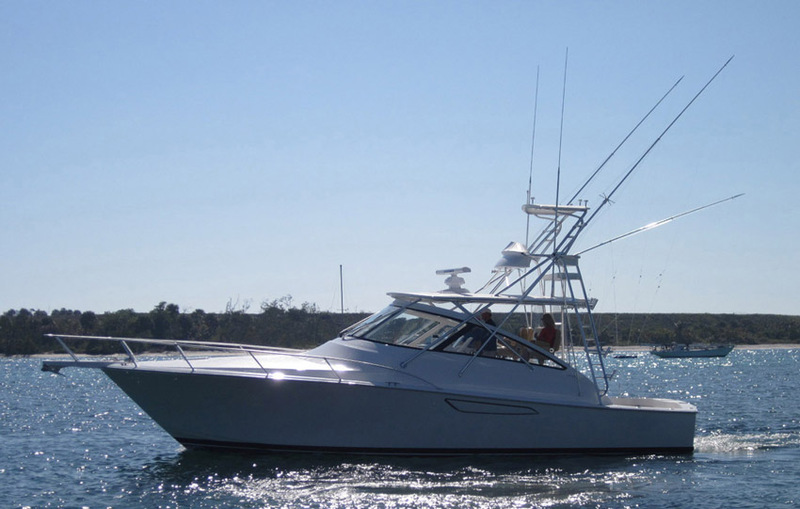 Jarrett Bay Boat Works / 43' - 0"
This sweet looking 43'c Jarrett Bay Boatworks​ express "Gregarious" has a 5'-6" gap polished pipe tower, with 2 1/2" front leg pipes and our curved belly band up top. On the platform we installed a 3 in 1 LED spreader light aft, single LED light fwd, (2) recessed tri-colored lights and painted the underside Kingston Gray. 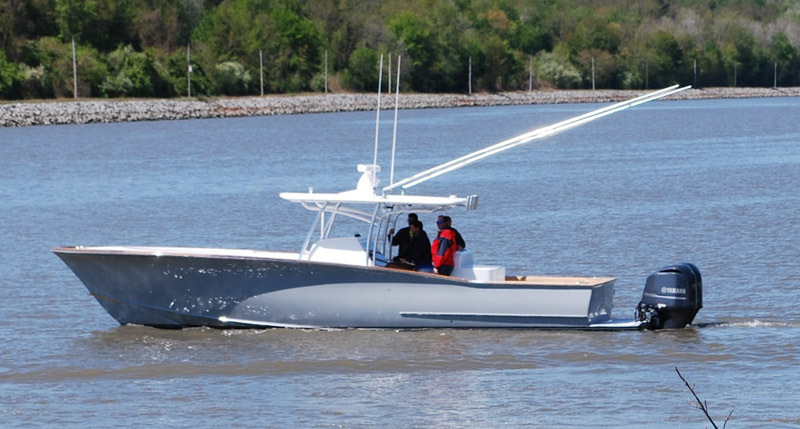 We also installed our 63" control box w/ a Satin black painted top, 33'-2 spreader Rupp outriggers, HD9 US teaser reels located in salon and sunshade fiberglass & metal painted Kingston Gray. 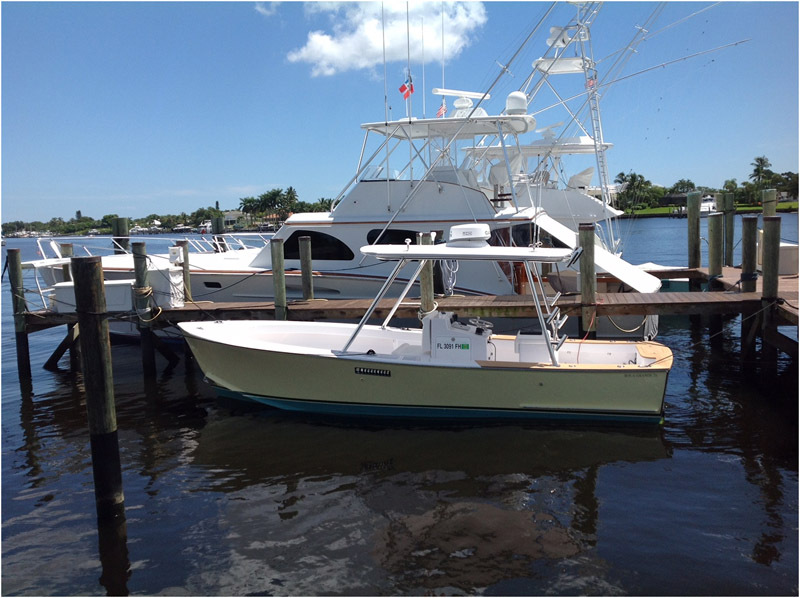 Ryco Marine / 43' - 0"
This hardtop and frame refit was a very simple job. We replaced the hardtop and frame, added a new fiberglass hardtop complete with radar pod, outrigger locks, recessed lighting, under mount speakers and LED lighting. 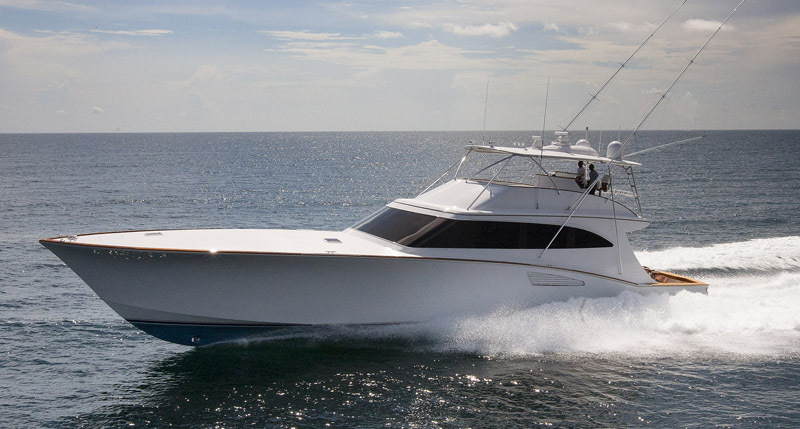 Viking Yachts / 45' - 0"
This is our standard tower for the 45 Viking Express yacht. Its a 5' Gap with rod holders, outriggers and teaser reels mounted on the tower. 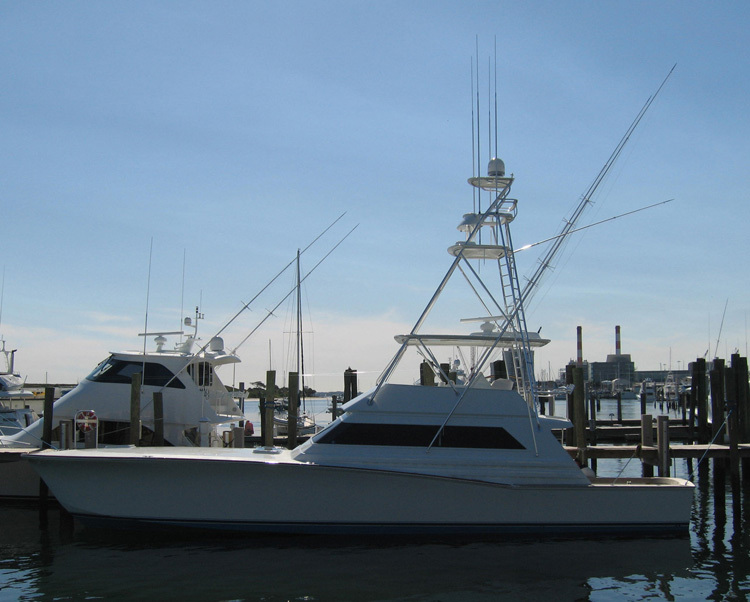 Garlington Yachts / 44' - 0"
This re-fit 8' gap express style tower came complete with 36' -3 speader Rupp outriggers, painted sunshade frame & control box black and painted undersides of the sunshade, platform and hardtop. 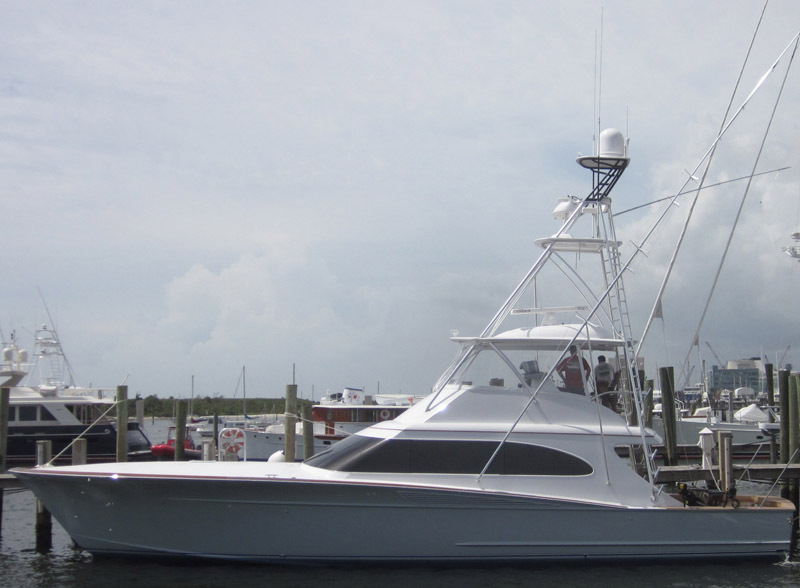 Ryco Marine / 44' - 0"
The owner asked PBT to remove his full tower on the boat and replace it with a lower Marlin tower to fit his current needs. 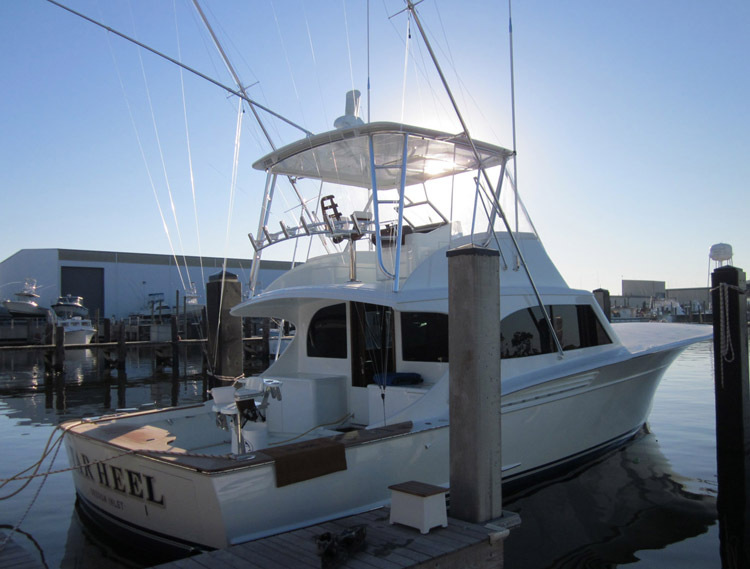 This tower was outfitted with bomar hatches, tri-colored LED lights, custom bench seating in tower, LED spreader lights, our 63" control box and an oversized sunshade to cover the seating in the tower. We also installed the radar pod on top of the sunshade to free up room on the front of the hardtop. This is a side profile of the Marlin Tower. 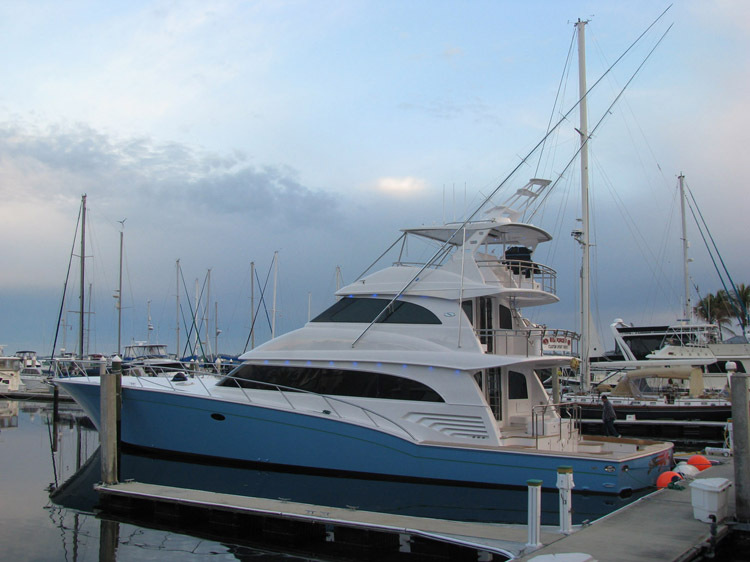 Rybovich / 45' - 0"
This 45'c Rybovich received a newly re-fit 4' Gap tower with a stationary electronics box on the underside of the hardtop and most of our standard features. We re-mounted the existing outriggers on the boat and installed an old style flat bottom board for the standing platform. 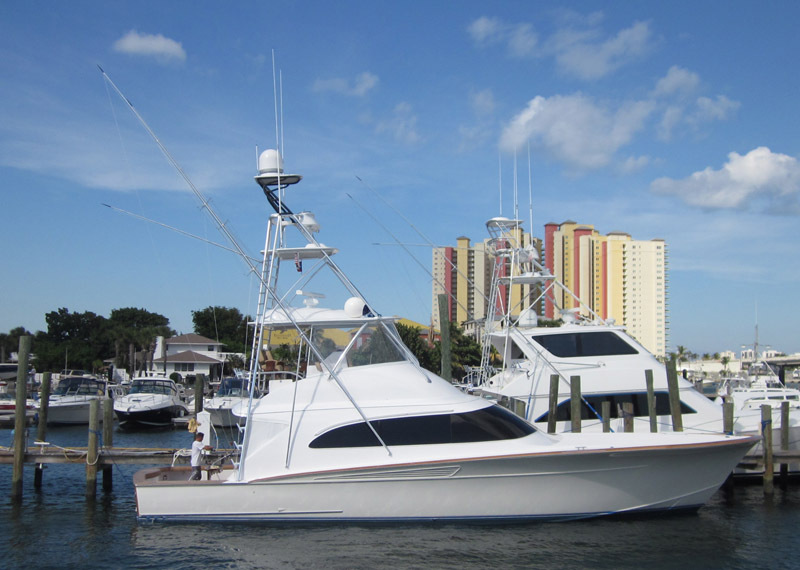 F&S Boat Works / 45' - 0"
Huckins / 45' - 0"
This tower was extremely hard to construct with all of the options the owner needed with his tower/ seating. Between adding the aft leg truss, custom hardtop bridge ladder, hatch opening in hardtop, electric sure shade for the cockpit, bench seating up top and rupp riggers. This larger style radar pod will fit our slider teaser reel bracket for (2) or (4) US9 reels, plus have room for a drop down box or fixed recessed radio box. 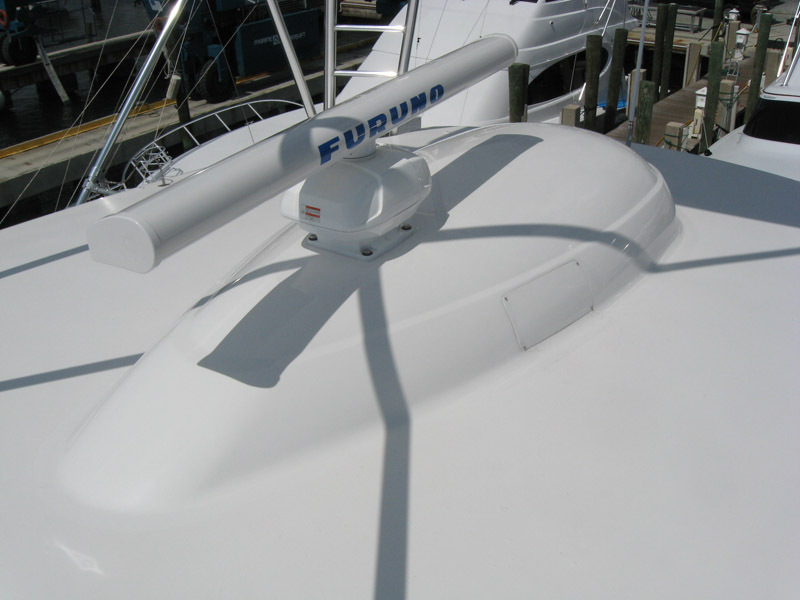 PBT uses this radar pod mainly on express style boat/towers because the radar wedge is mounted aft toward the middle of the hardtop. And the teaser bracket fwd to line up with the bridge console. This pod will hold both our slider teaser bracket and electronics drop down box. 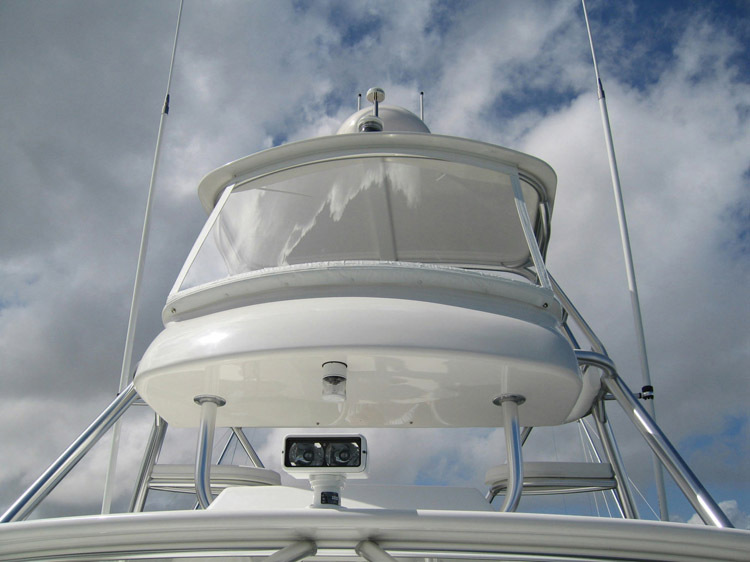 With this radar pod you can install a push style teaser reel lid and/or a slider teaser reel bracket. 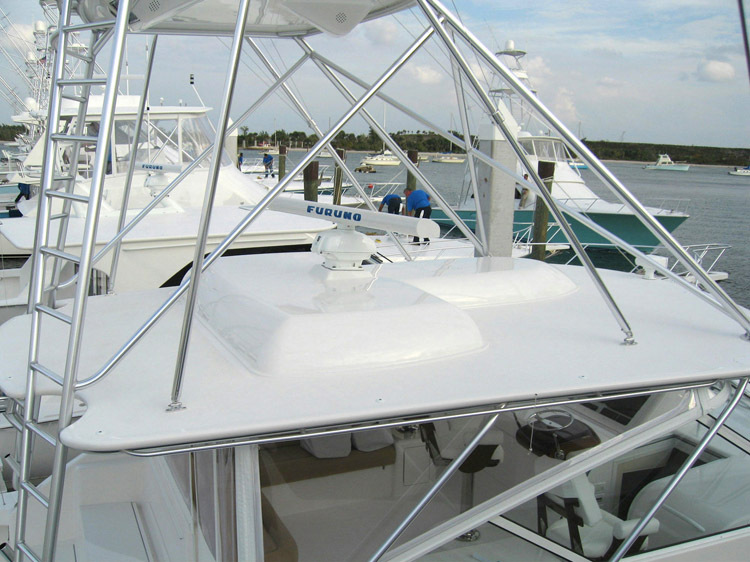 This hardtop rod locker can be used on certain express boats and convertibles depending on the size of the hardtop. The locker will hold the rod and reels with owner supplied rack system. This electronics box is mainly used on the underside of our sunshades, but we have placed them on the underside of the hardtop per the owners request. 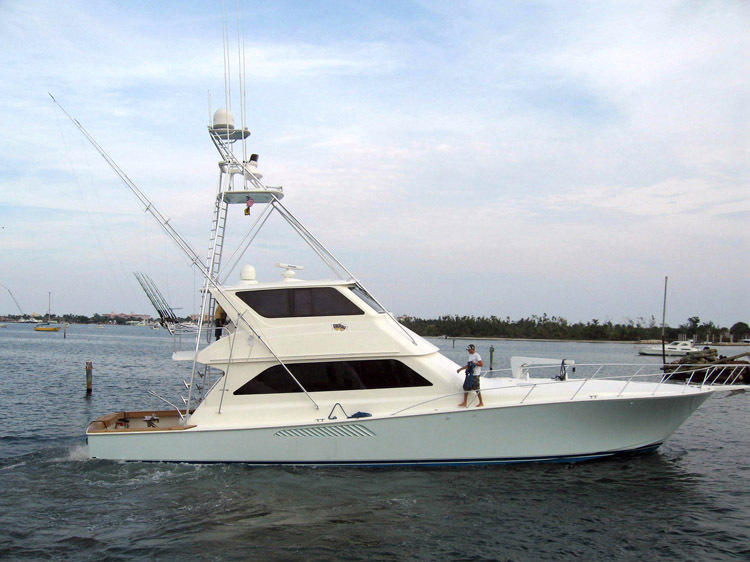 Merritt’s / 46' - 0"
This Merritt received a 6' gap tower with 4 teaser reels in the hardtop, standard low profile radar pod, front legs to the bridge deck and a custom aft ladder as part of the aft bridge rail. 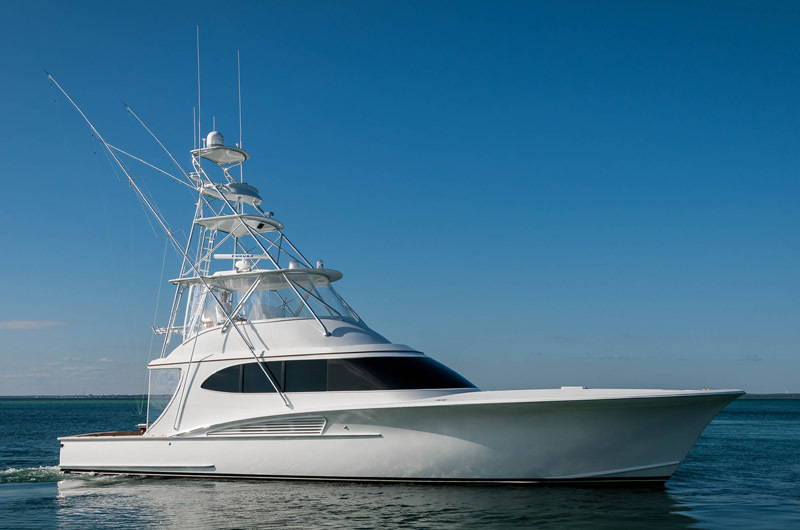 Viking Yachts / 56' - 0"
This custom hardtop has 2 G6 SAT TV domes, a large oval radar pod with a 6' ray, and the frame is made of brushed pipe. 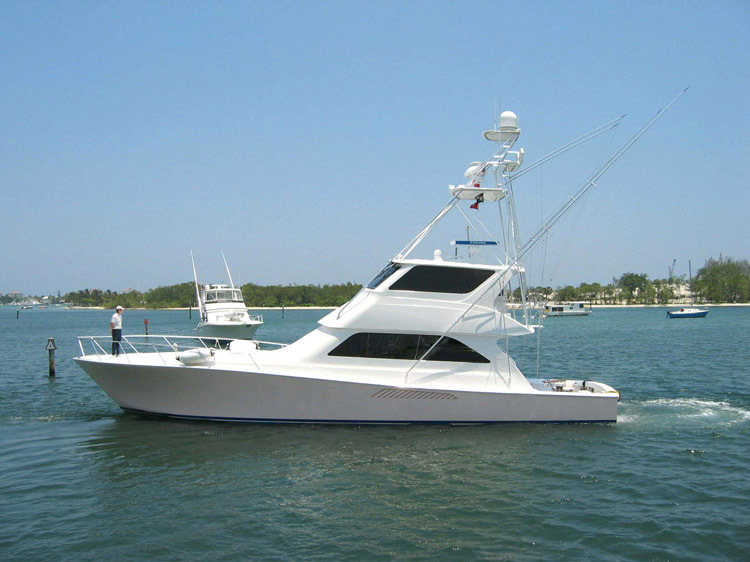 Viking Yachts / 46' - 0"
This tower has a 5' Gap with 36'- 3 spreader outriggers that are hardtop mounted. 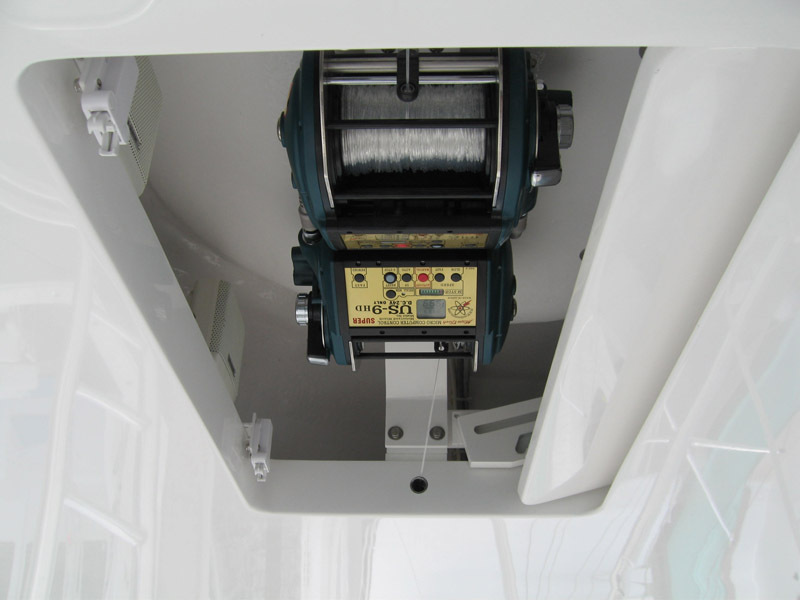 Other items on the tower are sliding teaser reel lid, 60" control box and pin style rod holders welded to aft outer legs. 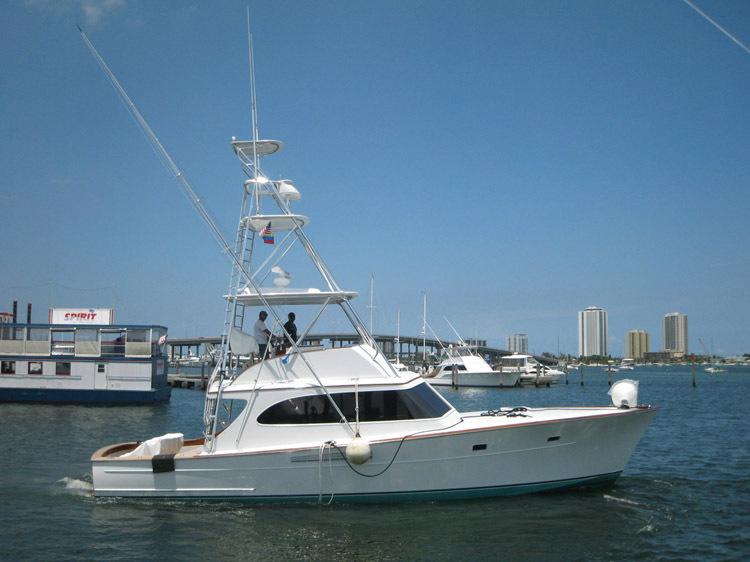 Riviera Yachts / 47' - 0"
This 47 Riviera has a 6'Gap tower with 38'- 3 spreader outriggers that are bridge release. The tower is also equiped with a slider teaser door and a fold down electronics box. 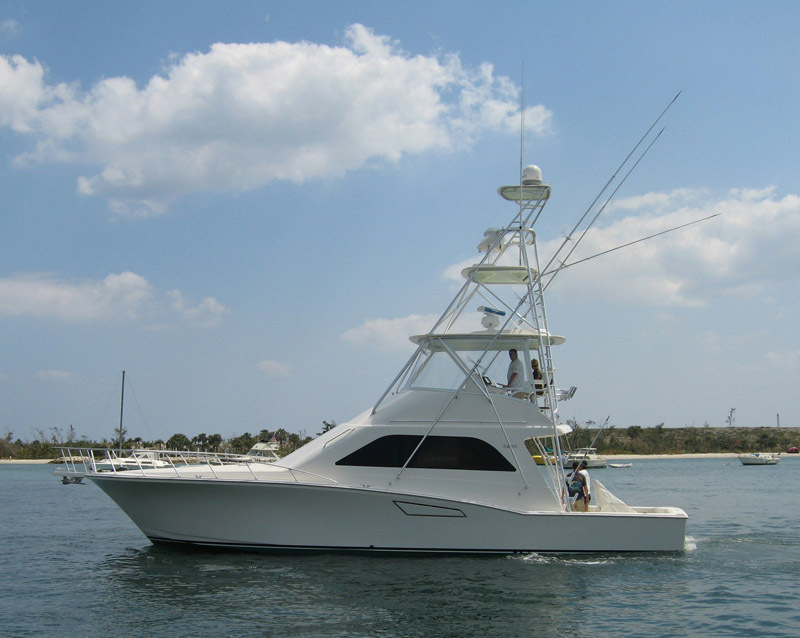 Viking Yachts / 48' - 5"
This is a 5' Gap tower with 38'- 3 spreader outriggers and low profile radar pod with a sliding teaser reel door. 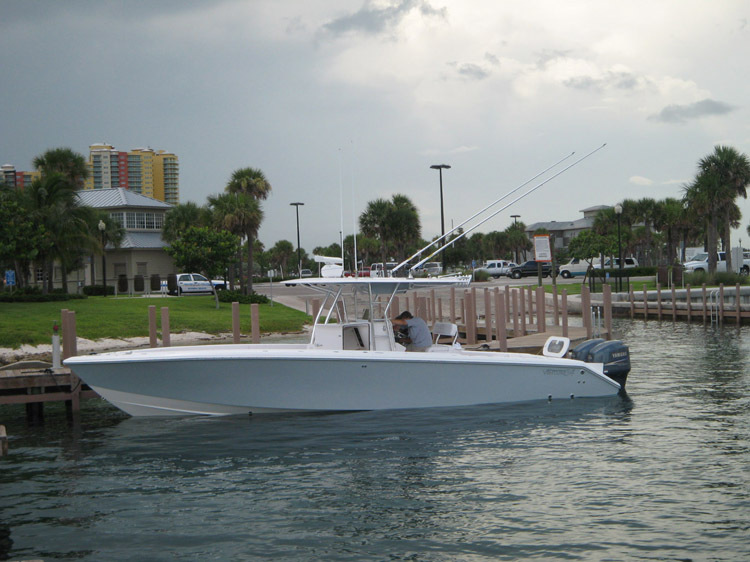 Gamefisherman Boats / 46' - 0"
This 46' Gamefisherman received a 5' gap tower with several custom items including, a stationary overhead electronics box on the underside of the sunshade, a custom teaser bracket on the underside of sunshade, black out kit in tower and acylic windshield. 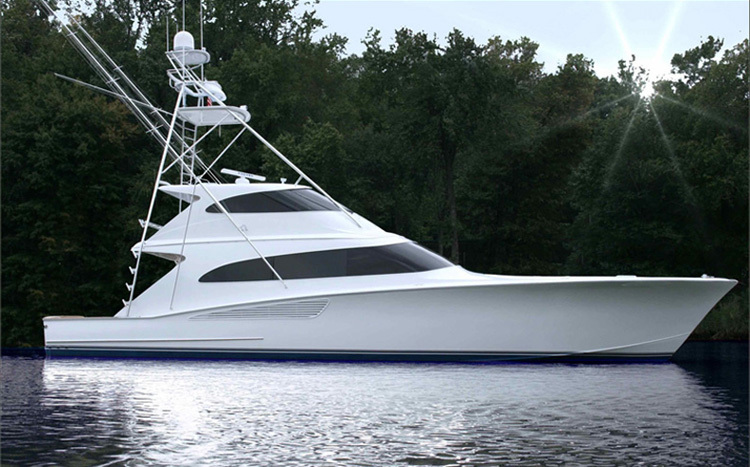 Cabo Yachts / 48' - 0"
Viking Yachts / 50' - 0"
46' Release Boat Works Express "Gladiator"
Release Boat works / 46' - 0"
Release Boat Works and PBT teamed up again to design a full style tower for their new 46' Express for a customer who wanted a very comfortable tower for fishing and diving. 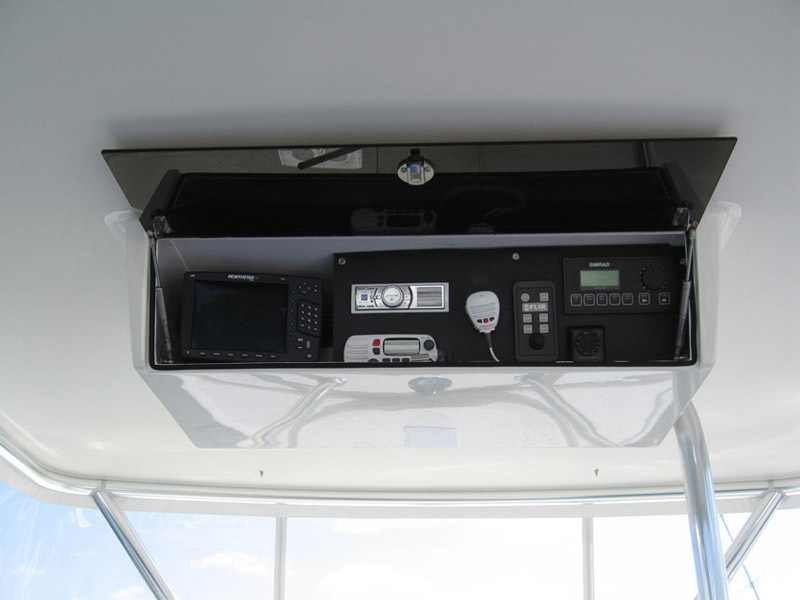 For fishing, PBT provided a 63" control box with recessed boxes on each side to house all of their electronics and monitor displays. As well as all the steering components mounted on top of the control box for usability. We have also installed Lumitec Lightings NEW Mirage LED lights on the underside of the sunshade, platform and hardtop which are substantially much smaller than the previous LED lights we use to install. The 36'- 3 spreader outriggers were mounted on the side of the bridge with a center rigger mounted aft below the ring. This 6' gap tower came complete with a 60" belly band, low profile radar pod, tri-colored lights in the hardtop, platform and sunshade and our 50" control box. 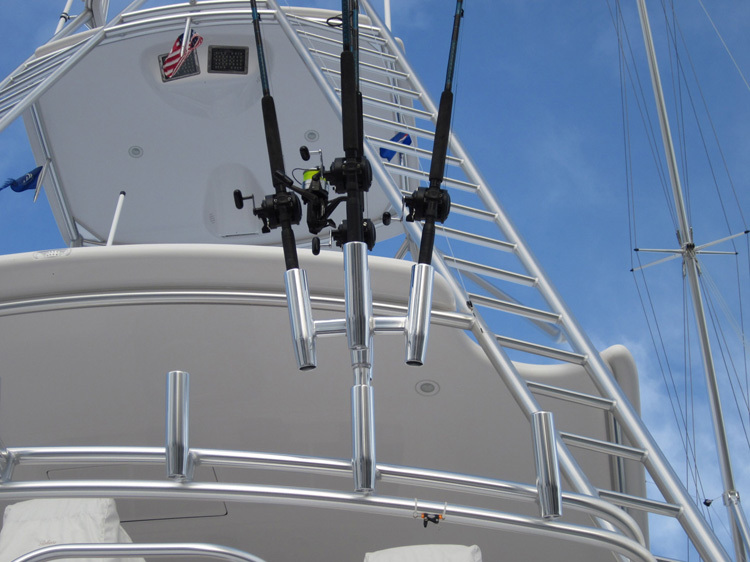 We also installed 41'- 3 spreader outriggers and (10) rod holders on the tower. 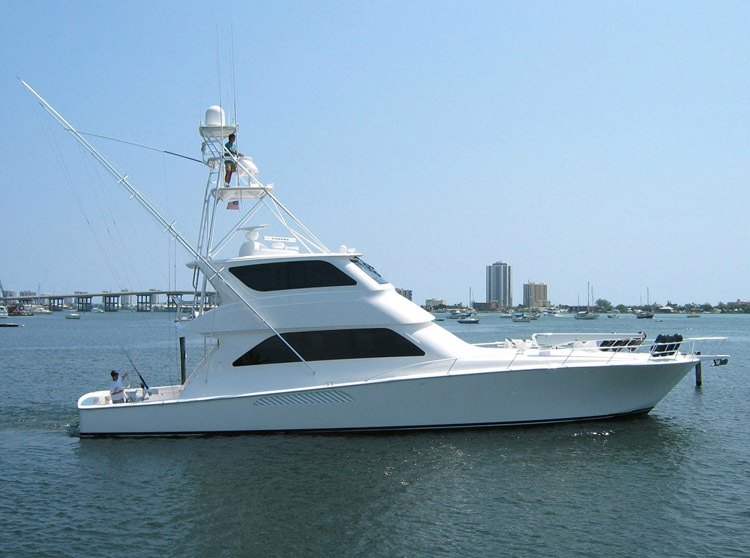 Riviera Yachts / 51' - 0"
This is a 7' gap tower w/ large oval radar pod for slider teaser reel assembly and radio drop down box. Buddy Davis / 47' - 0"
This is a 6' Gap tower with a stationary electronics box on the underside of the hardotp w/ a collapsible spring hinge. Scarborough / 47' - 0"
We installed a new brushed pipe, single perimeter rail hardtop frame with ladder steps on this renovated 47' Scarbough. 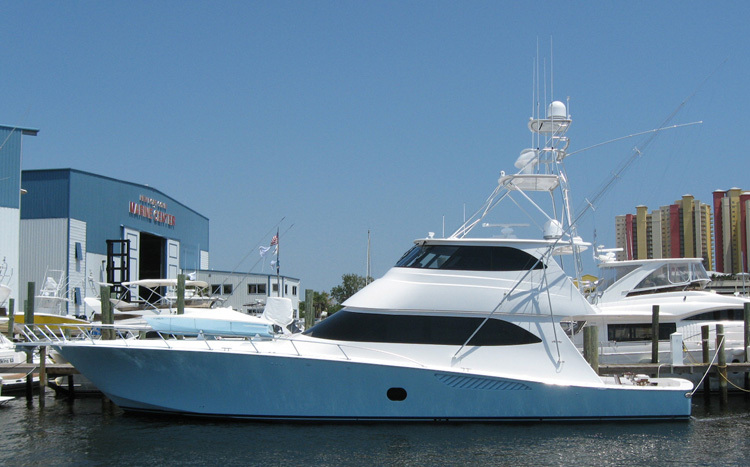 F&S Boat Works / 50' - 0"
This custom 50'c F&S received a 5' gap polished pipe tower with all curved bracing and diagonals. 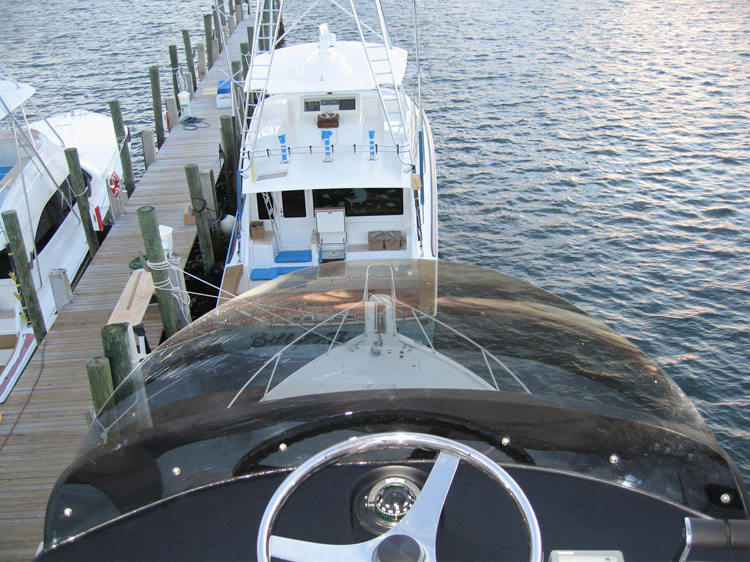 We installed some of our most common options like drop down box, teaser reels, nav lights, tri-colored LED lights and painted undersides to the platform, hardtop and sunshade. 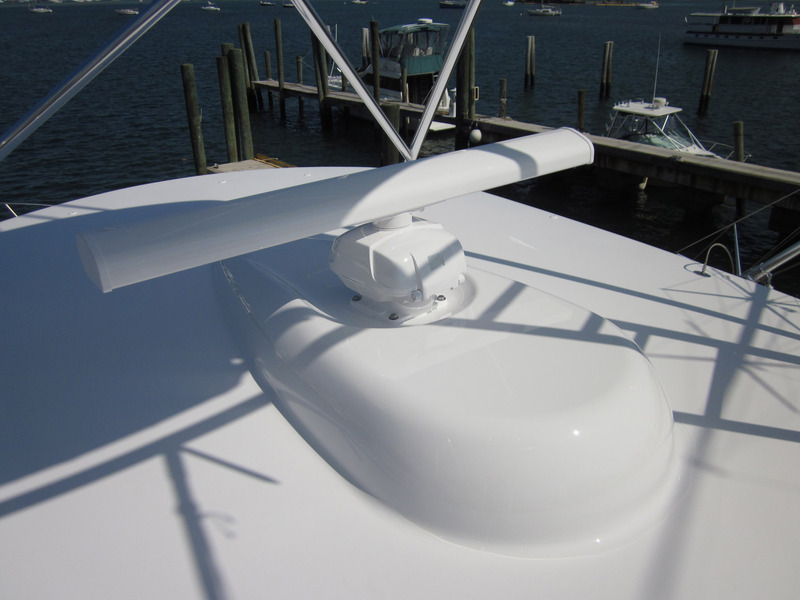 We also installed a set of 38'-3 spreader Rupp outriggers. 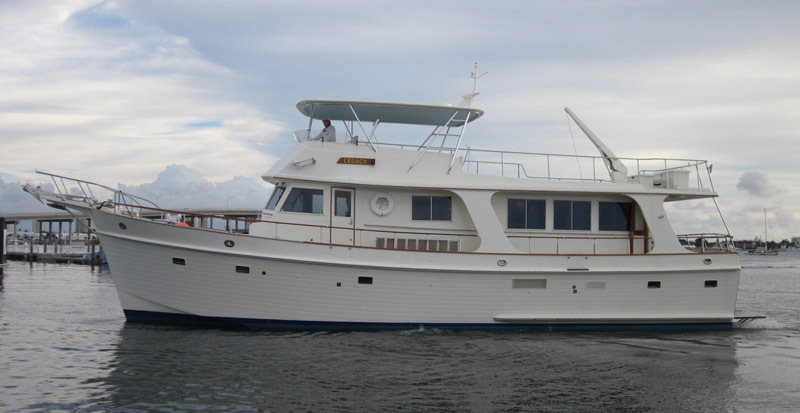 Rybovich / 50' - 0"
"Miss Budweiser" was treated to a major refit at Michael Rybovich & Sons in 2011 & 2012. 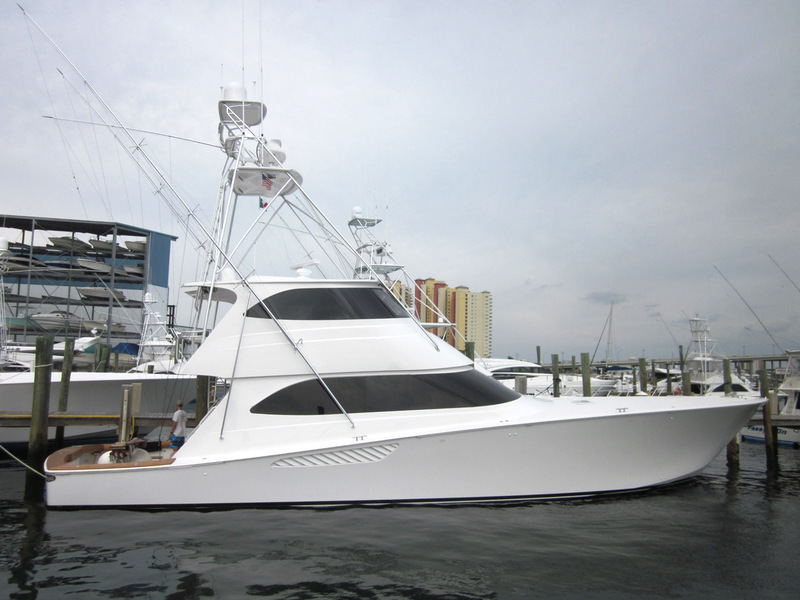 This legendary 50'c sportfishing boat was completely refinished top to bottom which included a new PBT 5' Gap tower. 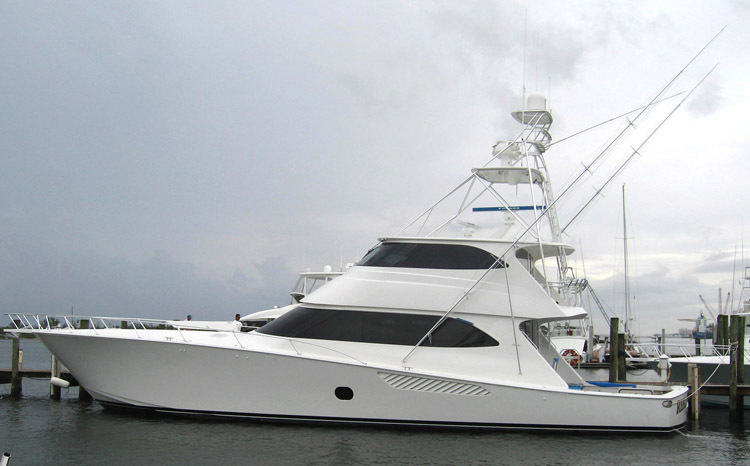 PBT worked closely with her new owner and captain to design a modern clean looking tower while maintaining her traditional lines. We moved the forward main tower legs up to the house top from their original forward deck location and the aft legs to the cockpit gunnels with (6) rod holders. The double perimeter rail under the hardtop and traditional style standing platform provided a classic touch to her new modern tower design. LED navigation lights, molded LED spreader lights and recessed LED hardtop lights completed her new modern lighting on the exterior. Buddy Davis / 52' - 0"
After we removed the existing tower on the Davis, we re-fit the boat with a 7' gap tower. This tower received a 60" belly band and was built out of polished pipe. PBT also installed clip in tri-colored lights, LED spreader lights and our new nav lights. The riggers were original to the boat, so we remounted them to the angle of the tower forward leg. 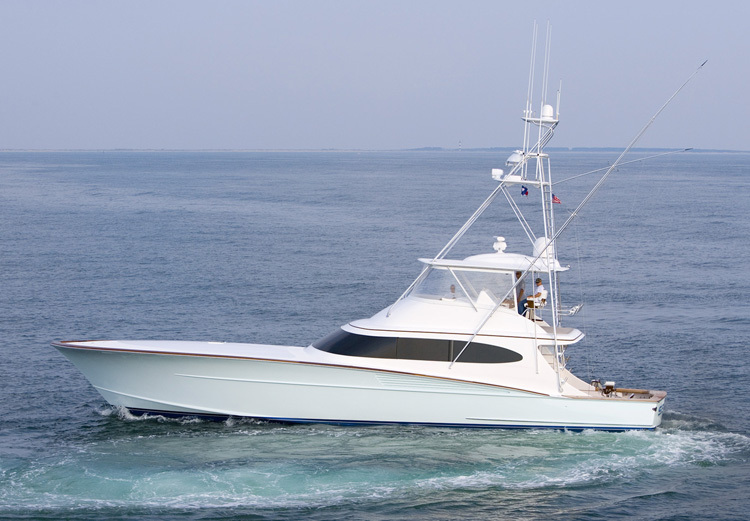 Scarborough / 52' - 0"
PBT just returned home from Bayliss Boatworks​ after completing a new custom hardtop package with riggers on the 52’ Scarborough “Agitator” for the Duffie brothers. 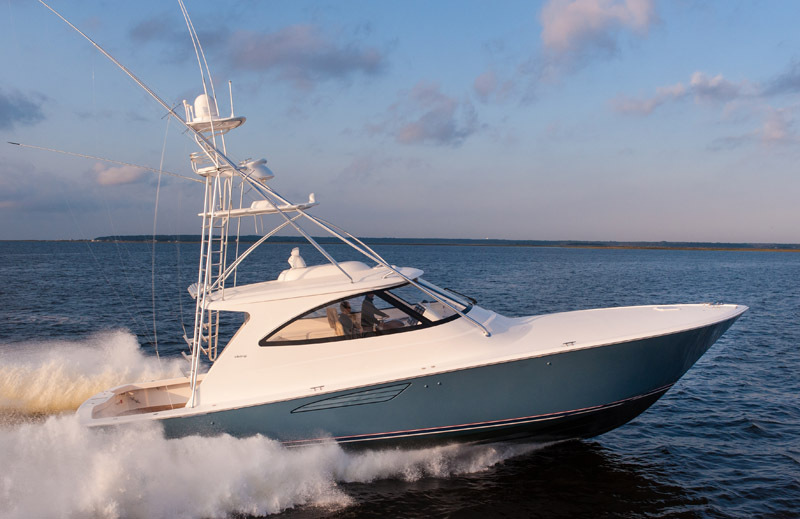 There were many custom features incorporated into her new design, including contoured pipes to flow with her curved lines, 4 teaser reels recessed into the hardtop with custom line guides. The underside was painted satin ice blue and a single EZ2CY panel will be installed to keep the bridge super clean. 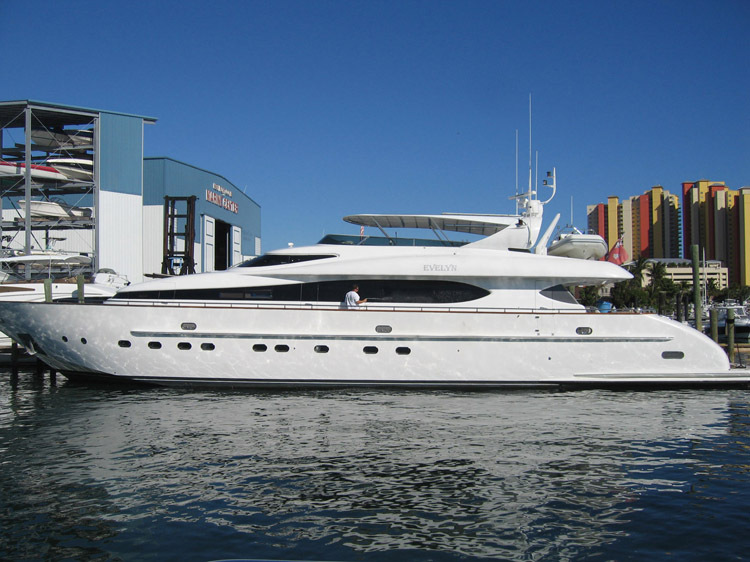 Check out the boat this summer in OC and Los Suenos next winter. The entire rebuild is something to see. 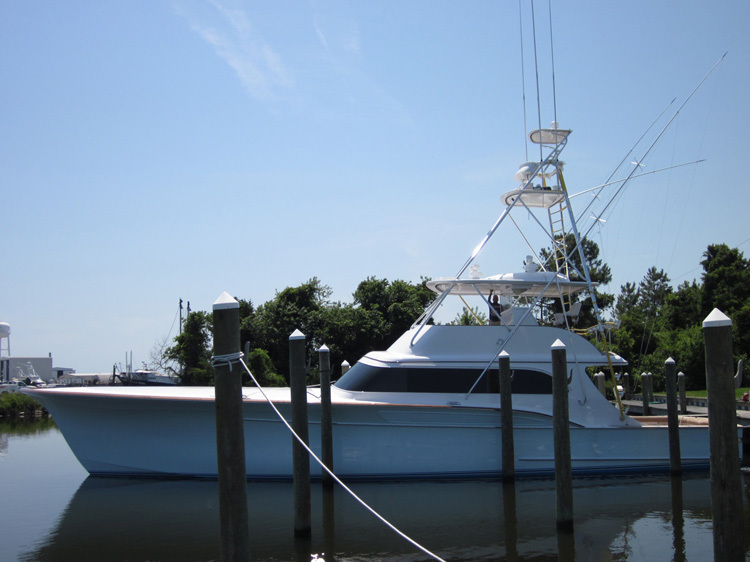 Sculley / 53' - 0"
Recently we got the opportunity to complete a re-fit on a 53' Sculley. 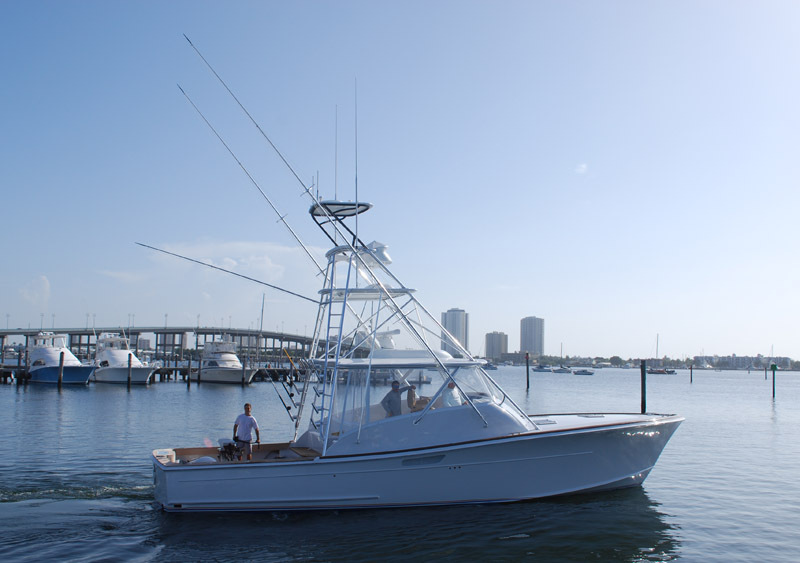 The boat originally had just a hardtop and frame and we were able to modify parts of the existing frame into our new marlin tower design. The whole forward section of the tower frame (fwd legs & perimeter rail) is the original pipe work from the hardtop frame. We also used the existing hardtop cutting out new ladder openings in the back, put on a new radar pod, cut a teaser door and wire track in and gave it a whole new paint job. We also powder coated the whole tower frame and bow rail per the customer request. It came out beautiful. 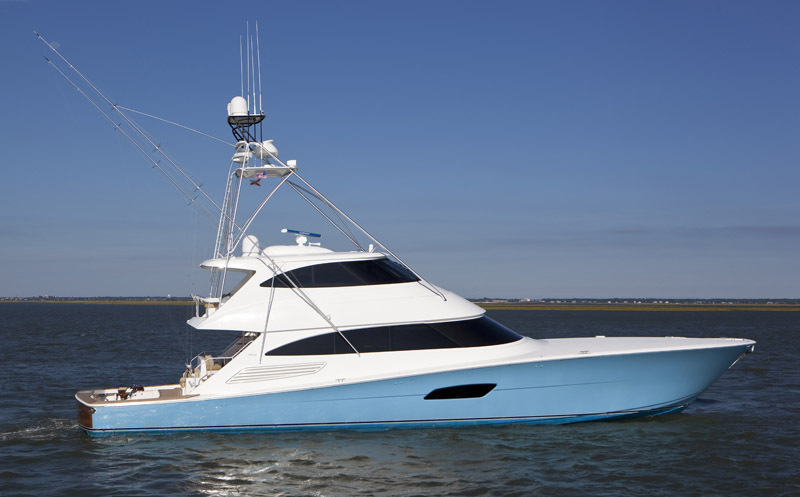 Viking Yachts / 52' - 0"
Viking introduced its hot new 52' Sport Yacht in August 2014 showing off her custom PBT 6' Gap Tower. With all of her extreme curves and angles, PBT followed this same styling through the tower with our contoured and curved pipes, braces and control box. 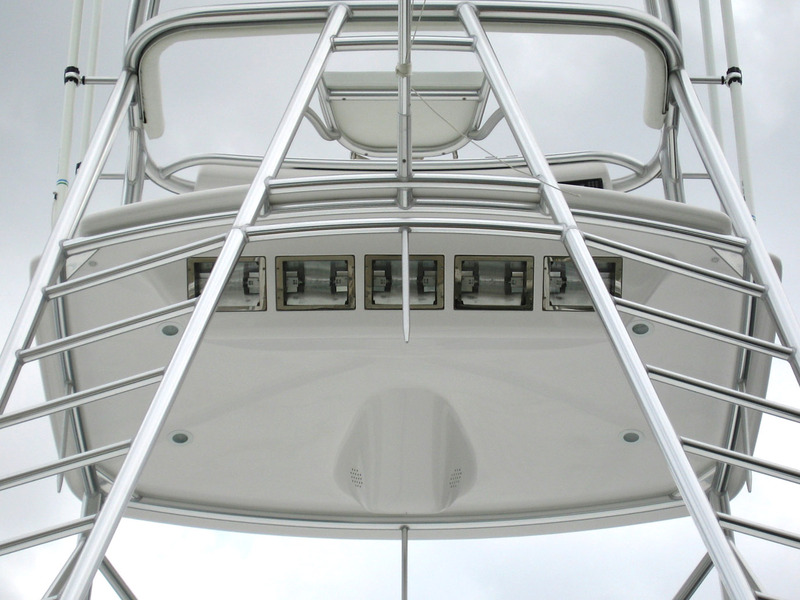 The upper end of the tower is set up for the ultimate comfort and visibility while fishing. A tailored wrapped belly band cushion provides soft padding and clean visibility, while the electronics are recessed into two boxes with lids to protect all of your equipment. 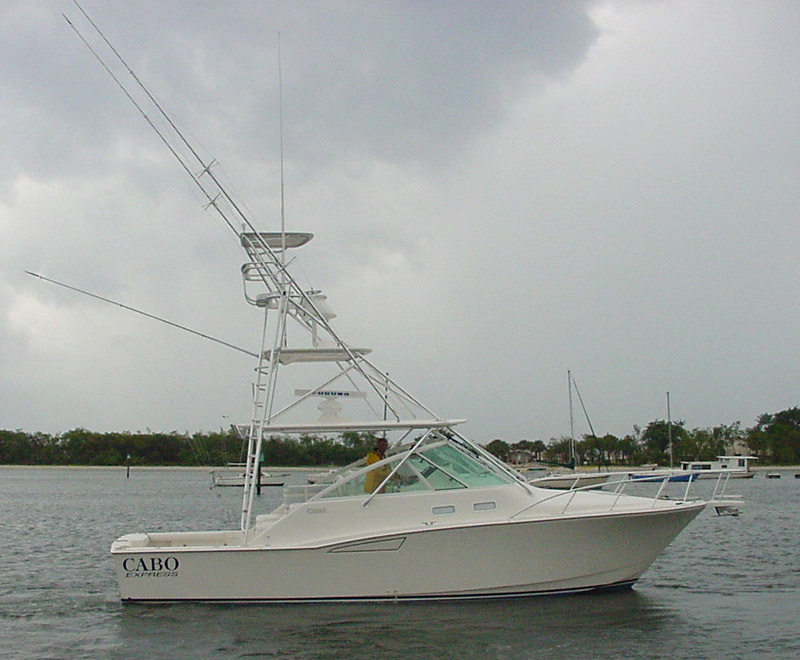 This is a 6'-6" gap tower with 38'- 3 spreader hardtop mounted outriggers and a hardtop rod locker for storage of rods. There are also 2 photos on the dock of a 7' gap tower with 38'- 3 spreader bridge mounted outriggers. 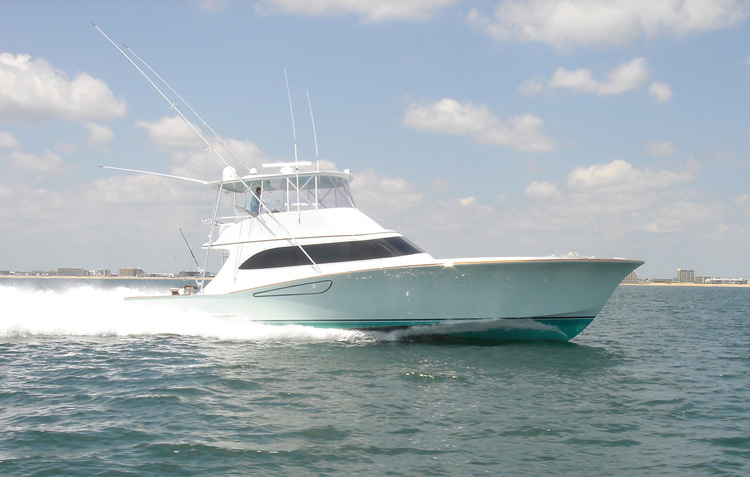 Jarrett Bay Boat Works / 53' - 0"
This hardtop truss style frame has a single hardtop perimeter rail with custom fiberglass hardtop. The hardtop has recessed tri-colored lights, large radar pod with sat dome extension, nav lights and a 4 in 1 quartz light pod on underside of aft hardtop. 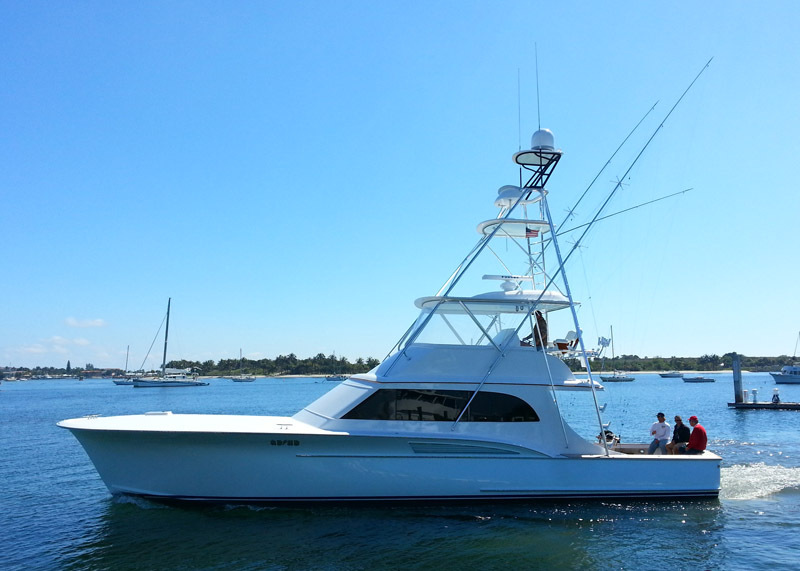 Viking introduced its hot new 52'c in June of 2013 showing off her custom PBT 6' Gap Tower. With all of her extreme curves and angles, PBT followed this same styling throught the tower with our contoured and curved pipes, braces, raked enclosure, radar pod and control box. The upper end of the tower is set up for the ultimate comfort and visibility while fishing. A tailored wrapped belly band cushion provides soft padding and clean visibility, while the electronics are recessed into two boxes with lids to protect all of your equipment. 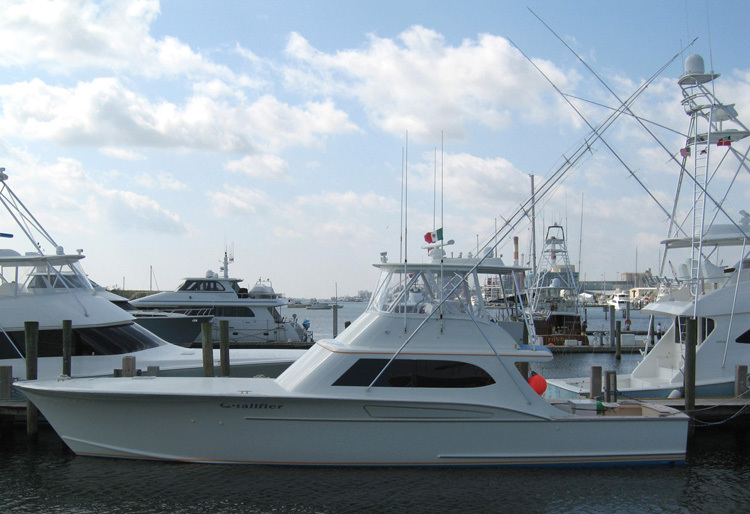 Jarrett Bay Boat Works / 55' - 0"
This is a 8' gap tower with 41'- 3 spreader outrigger bridge release and a large oval radar pod for a radio drop down box and a slider teaser reel door. This single perimeter rail hardtop frame was made out of polished pipe with several custom items on the hardtop. These items include our large radar pod w/ the sat dome pod aft, several hardtop handrails and painted satin underside. 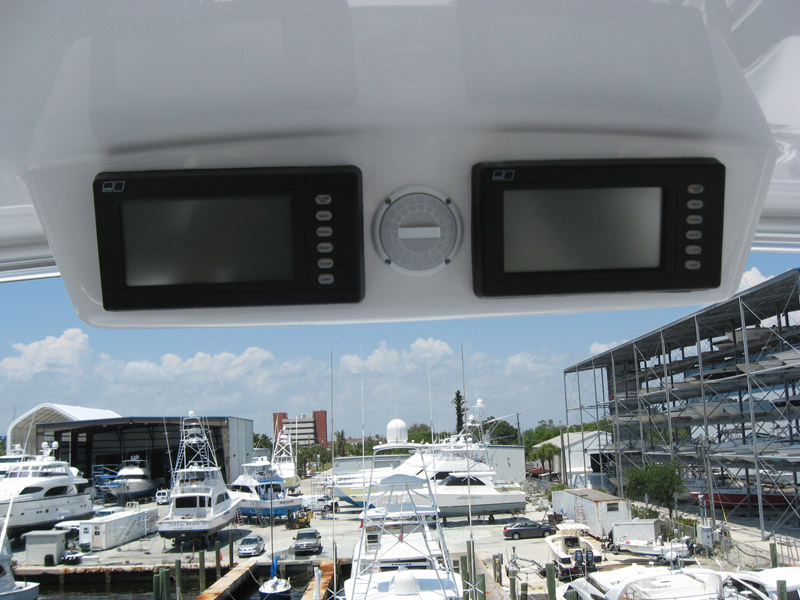 This teaser reel opening with the display monitor aft in the opening was installed on the 84'c Bayliss "Orion". So when the captain is facing aft, he is able to not only watch the fisherman in the back, but be able to monitor the display at the same time. 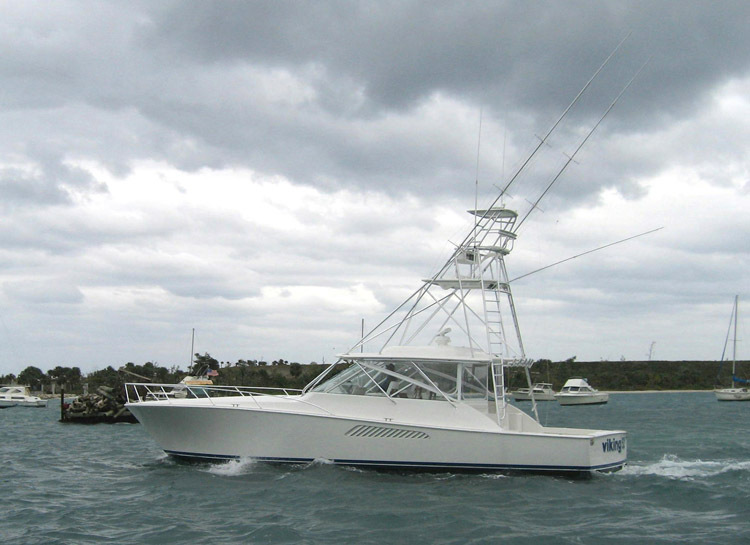 Viking Yachts / 54' - 0"
This is an 8' Gap tower with 39'-3 spreader outrigger house mounted. The hardop is complete with slider teaser door, large drop down box and tri-colored lights. 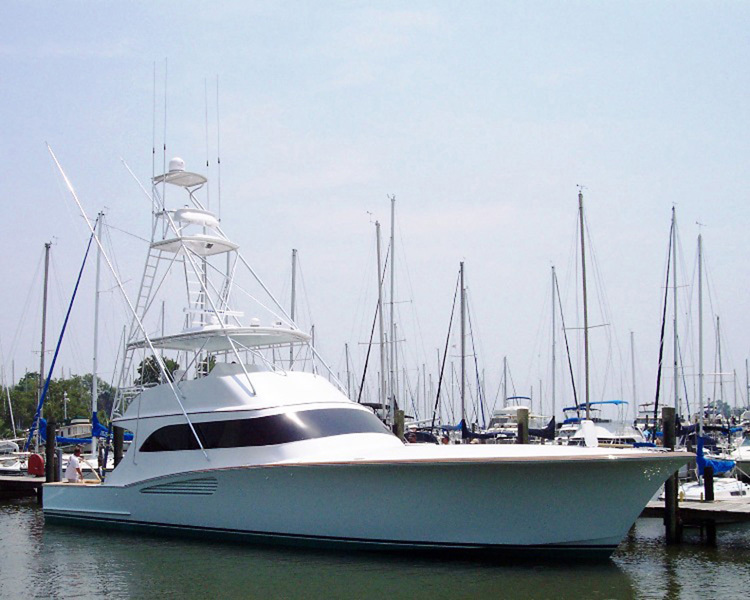 Bertram Yachts / 54' - 0"
This refit job on the 54'c Bertram received a hardtop & truss style frame with the existing mounting spots reused for wire access. The side V brace was also the main forward leg which mounted on the side of the bridge. For the hardtop we installed our stationary recessed electronics box, a single set of teaser reels, LED down lighting, LED spreader lights aft and a SAT dome pod on top of the hardtop. As for the bridge ladder, the handrail had to tie into the aft bridge rail w/ rod holders for support. 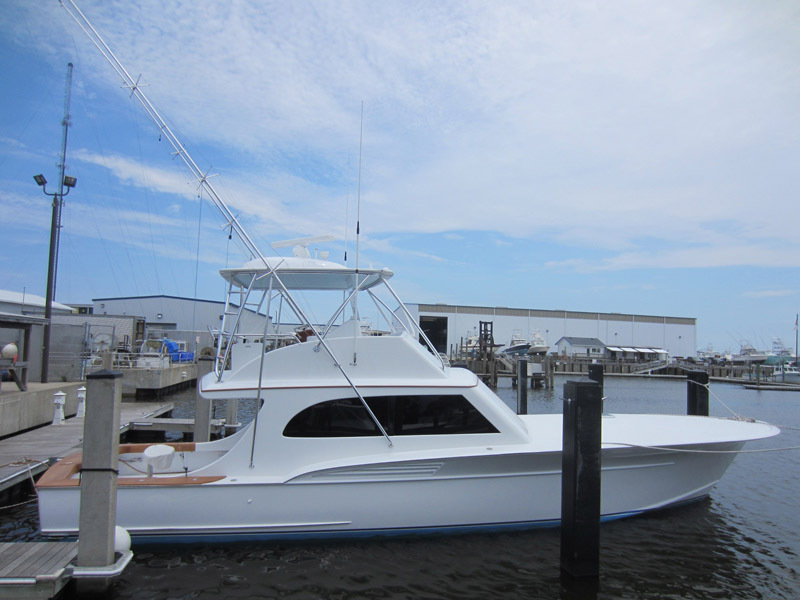 Viking Yachts / 55' - 0"
This 8' gap tower is fitted with our low profile radar pod, 60" pod style control box, 41'- 3 spreader outriggers and a new polished pipe bridge ladder to match the tower. This brand new Viking hull received a 7' gap tower with 41'- 3 spreader "Bigg Riggs" from Rupp as well as all curved bracing and supports. We also installed our 63" control box, LED spreader lights, LED overhead lights, drop down box, teaser reels and our single leg style sunshade. 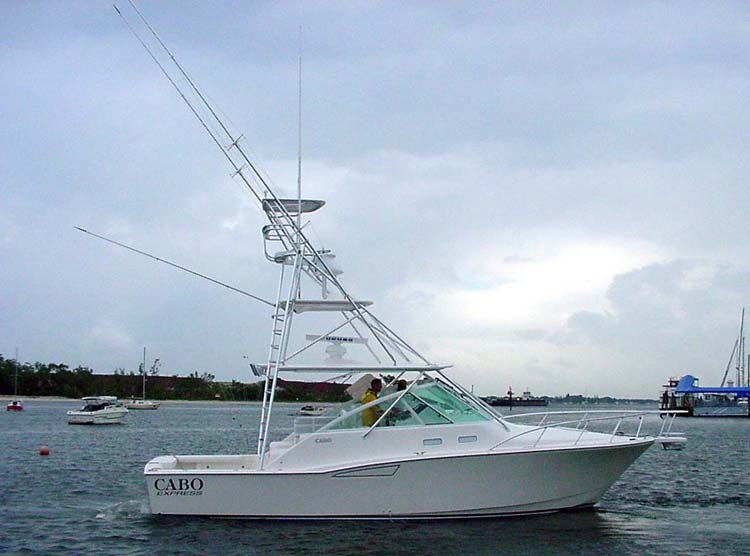 F&S Boat Works / 56' - 0"
This 6' gap polished pipe tower received a 60" belly band, curved bracing & supports, our standard drop down box and (4) teaser reels in the hardtop. 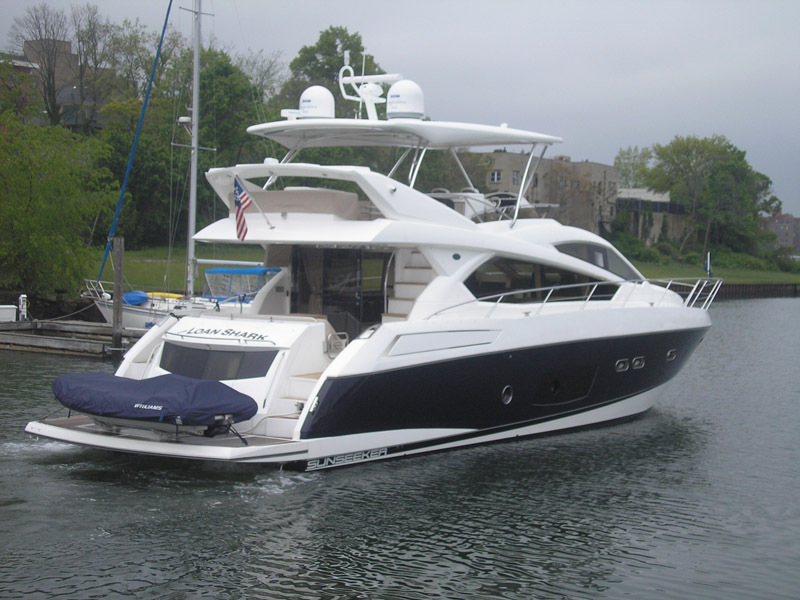 We also installed custom pop up cleats on the topside of the hardtop per the owners request. All the fiberglass parts were painted a seperate color on the undersides as well as adding our new Maxillume LED spreader lights to the platform. The riggers that were installed were 41'- 3 spreader Rupp "Bigg Riggs". This Viking Demo had a 9' Gap, 43'- 3 spreader bridge release outrigger with a large oval radar pod. 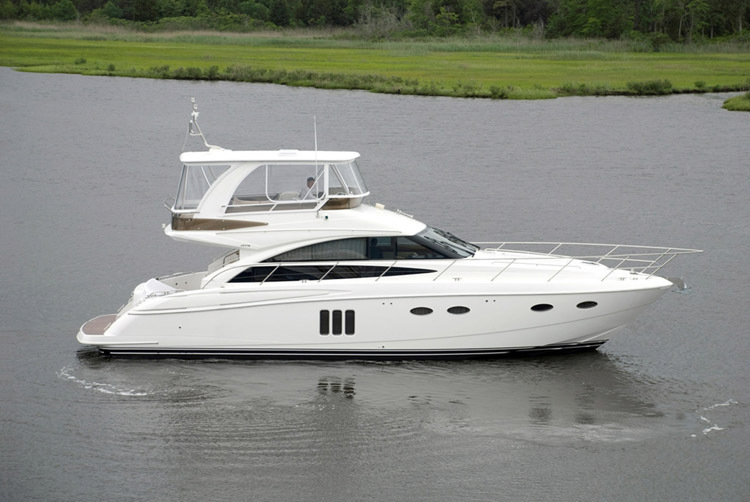 Princess / 54' - 0"
This Sport Cruiser received a custom painted arch with a fiberglass hardtop that included bomar hatches, tri-colored lights and (2) sat dome pads on top of the hardtop. 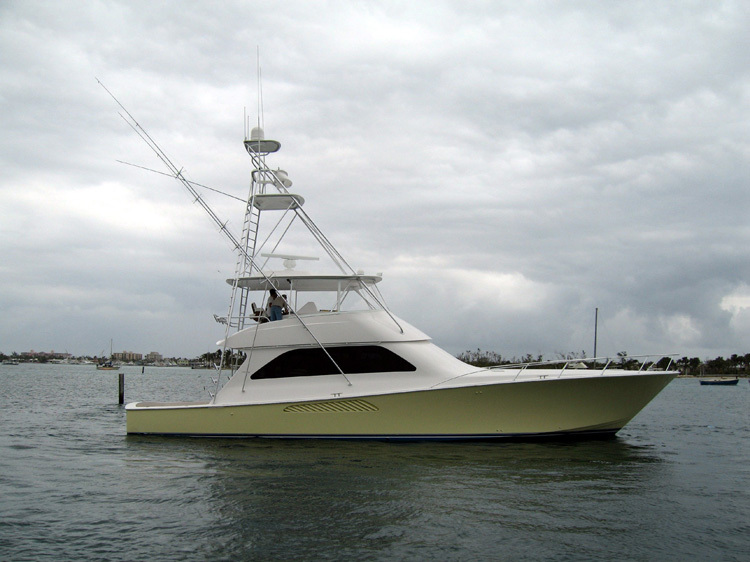 Viking Yachts / 57' - 0"
This 8' gap tower came complete with our NEW larger stepped radar pod, 60" control box, tri-colored lights in the hardtop, platform and sunshade, and 3 sided EZ2CY enclosure. The tower also received 43'- 3 spreader outriggers. Paul Mann / 56' - 0"
This custom hardtop and frame received a custom stationary radio box w/ acrylic lid and the underside of the hardtop was painted with a colored non-skid texture. 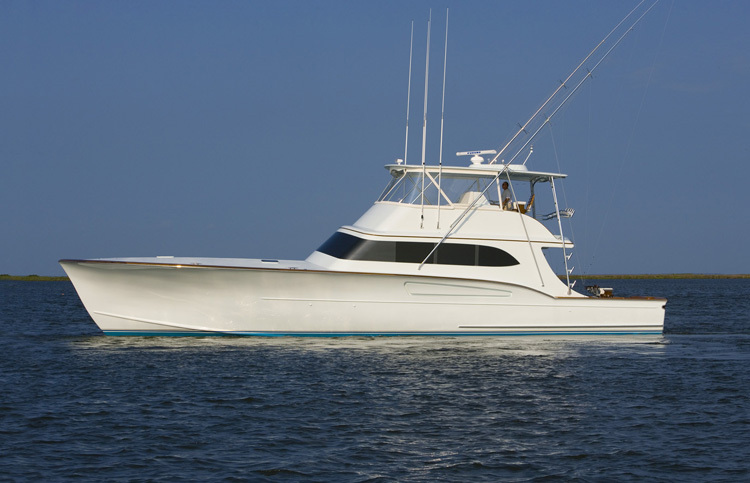 Grand Banks Yachts / 58' - 0"
PBT installed a very simple hardtop and frame on this Grand Banks troller per the customers request. We installed (9) LED lights on the underside of the hardtop, painted the underside SATIN Atlantic Blue and installed to custom speaker recess in the back side of the hardtop. We also built a radar mast with two Lumitec LED lights that were integrated into the mast. This hardtop was also our 2 3/4" thick hardtop to give it a little bit of bulkiness so it didn't disappear from a side profile view. 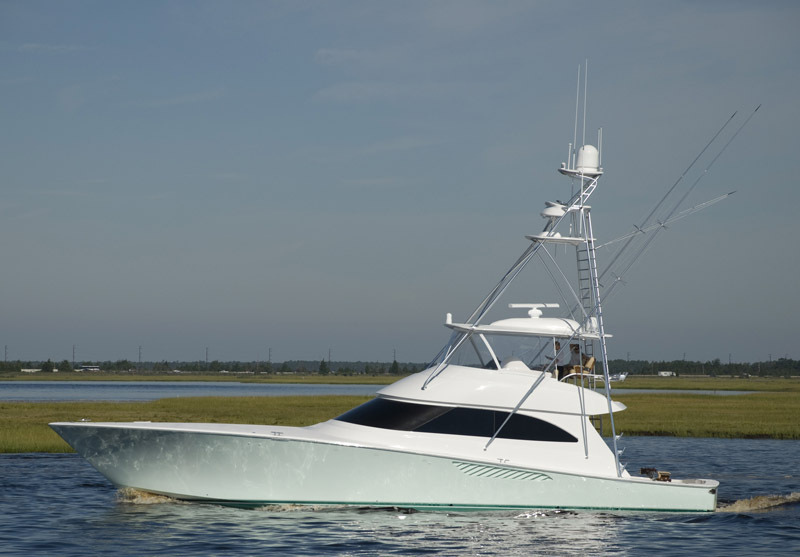 Viking Yachts / 60' - 0"
Spencer Yachts / 57' - 0"
PBT traveled to North Carolina to install a new custom tower package for the consistent tournament winning team of Gray Ingram and Capt Ronnie Fields. 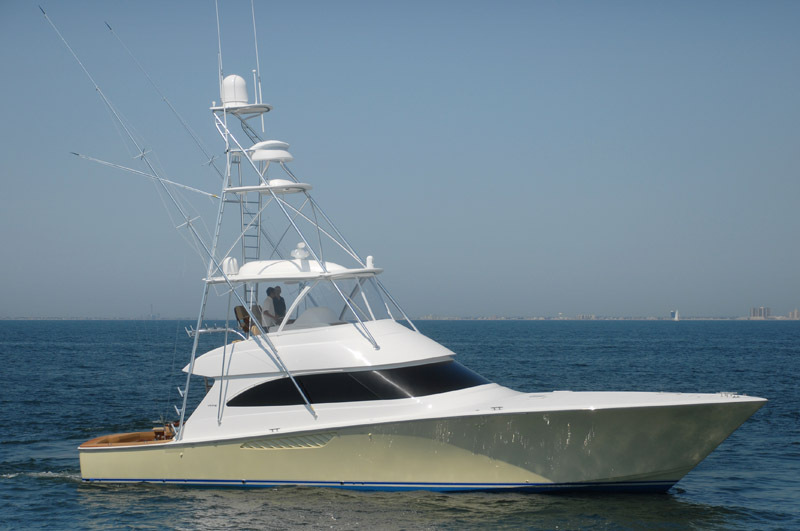 Gray just completed a new 57’ Spencer named “Trophy Box” and chose the talents of PBT to provide him with a tower designed to pursue billfish throughout the world. This 7’ gap tower fit perfect to the angled and curved lines of this Spencer. In working closely with Capt. Ron, we designed in our 60” belly ring, with center jump seat, so he could lock himself in with comfort on rougher days. 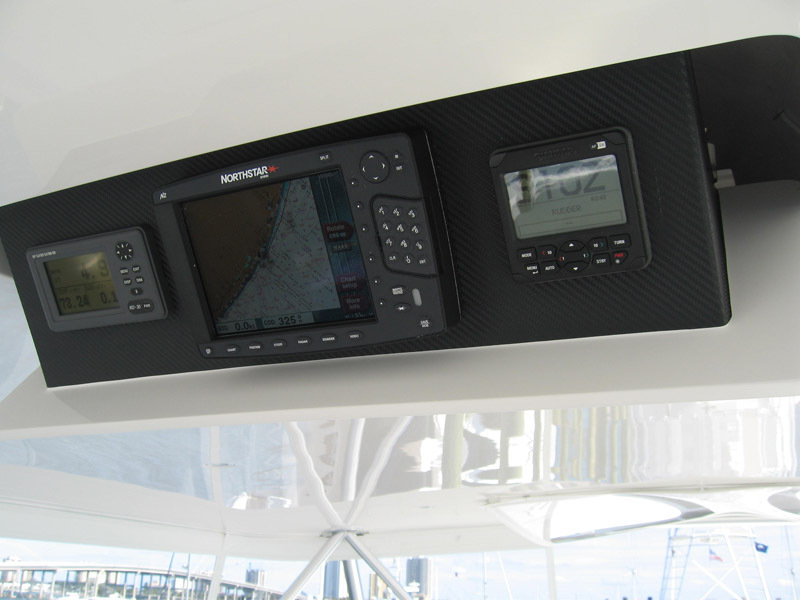 His 12” Garmin display is recessed & protected in our curved control box. Other features include 5 LED spreader lights, Recessed US 15 HD reels recessed into the hardtop with swivel roller tips to provide the ultimate pulling power. 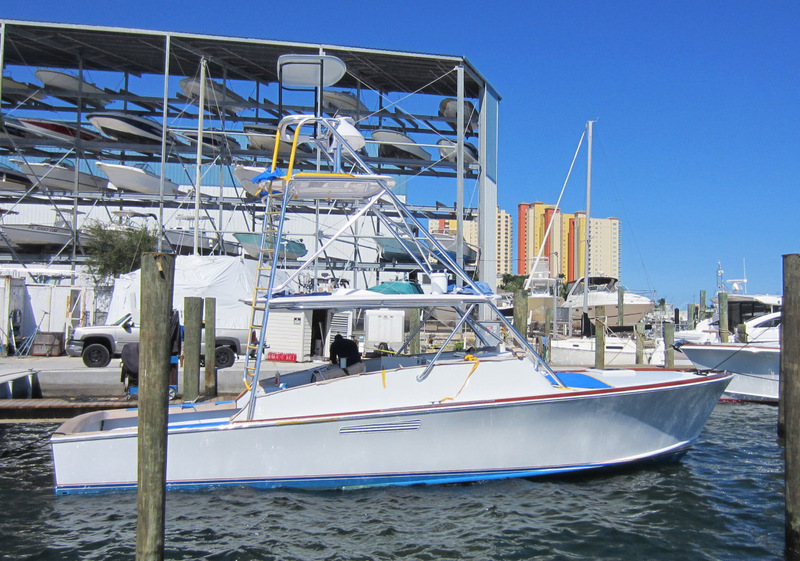 The final part of the project was to install 43’ Rupp outriggers at just the right angle to insure the ultimate layout for their bait positions. 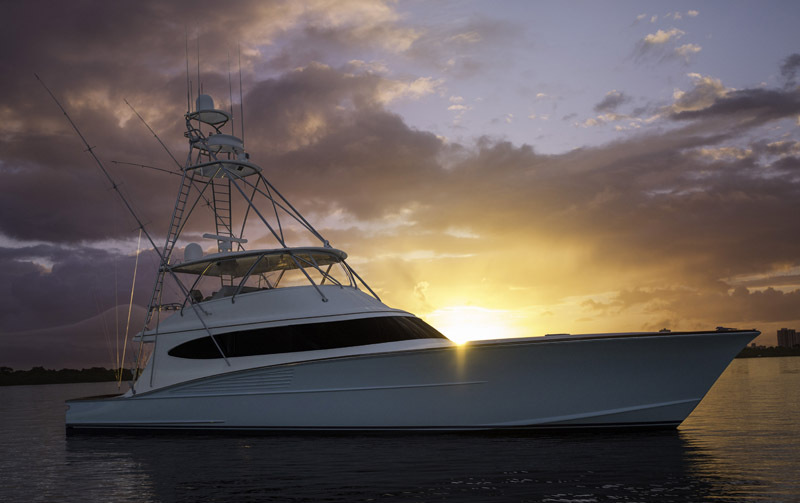 We are proud to have the “Trophy Box” team fishing our product in the most prestigious big game locations in the world. This re-fit that PBT completed on this 57' Spencer was a great little project to work on. We mounted a traditional style hardtop and frame with the front legs going down to the front of the bridge, to give it that full tower look. 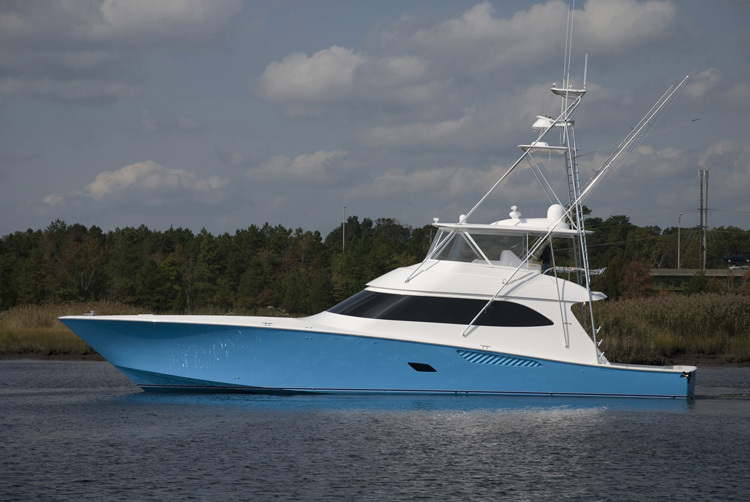 The hardtop received (4) teaser reels, LED navigation lights, LED clip in tri-colored lights, our large radar pod to hold the teaser reels and the underside of painted Satin Blue. 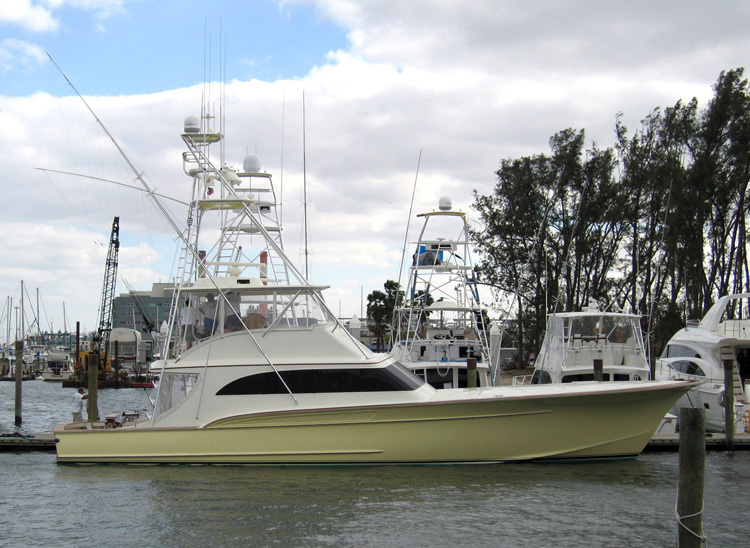 Island Boat Works / 57' - 0"
This fully refurbished 57'c Island Boat Works boat "CowPoke" was finished in March 2015 and is located at its home port in Fort Pierce, FL. This was an 8' gap polish pipe tower with a 60" belly ring up top. 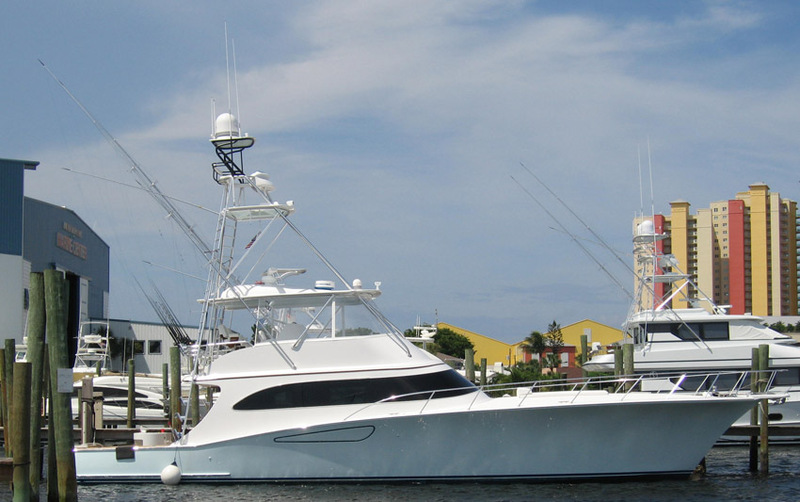 The tower also received our 53" control box, stationary recessed electronics box, (2) sets of teaser reels, LED lighting, painted undersides to fiberglass, upper section of tower blacked out and new Rupp "Bigg Riggs" 43'- 3 spreader riggers. We also built the bridge ladder and handrails per the customer request. 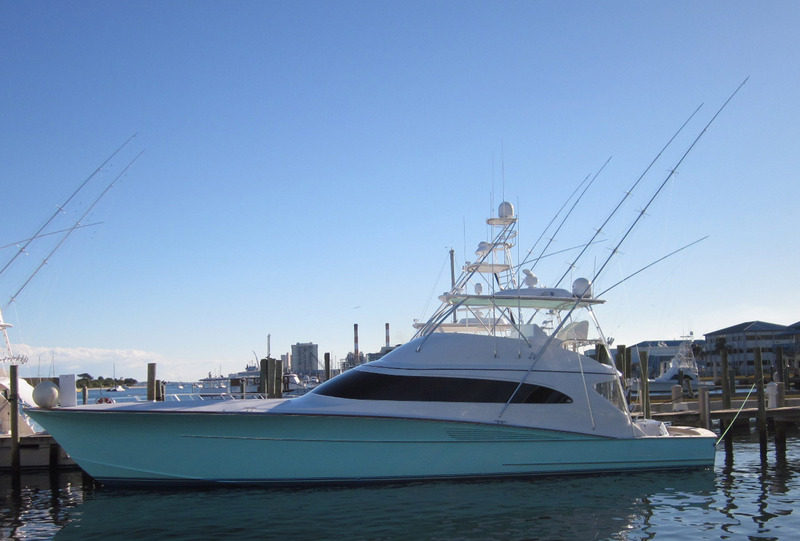 Dean Johnson / 57' - 0"
This re-fit 6' gap tower came complete with our low profile radar pod, nav lights, color painted undersides to the fiberglass and a stationary radio box on the underside of the hardtop. We also modified the existing outriggers to match our tower after mounting. After seeing the tower, the owner made a final request, that we design and build a custom scuba tank teak seat that is removable and collapsible for storage. It is to be mounted on the inside covering board of the cockpit. 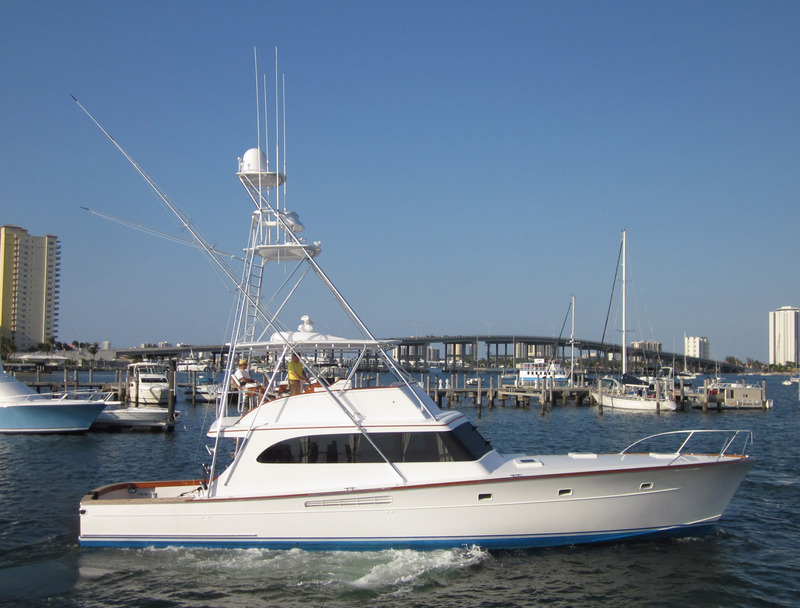 Caison Yachts / 58' - 0"
Whiticar Boat Works / 58' - 0"
This re-fit hardtop frame replaced a full tower that was originally installed on the boat. We installed a truss style frame with our fixed stationary recessed box, teaser reels, nav lights, large stepped radar pod, LED spreader lights and aft legs down to the gunnel. We also installed the aft legs down to the gunnel. 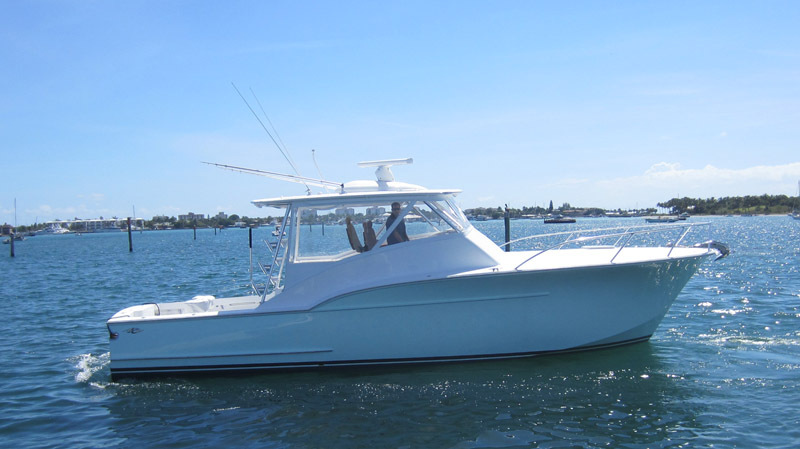 Weaver Boat Works / 58' - 0"
This has a custom hardtop frame and hardtop with the aft legs down to the gunnel. Comes with slider teaser lid, nav lights, low profile radar pod and a stationary radio box. 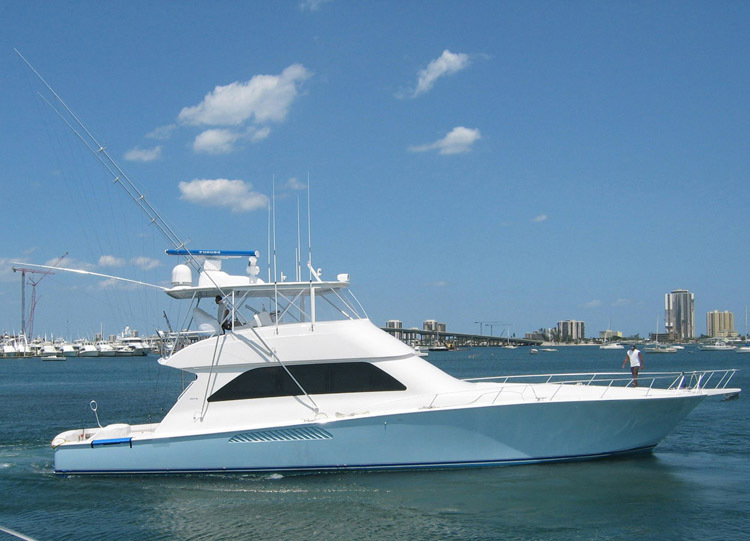 Viking Yachts / 61' - 0"
This 9' gap tower comes with 43'- 3 spreader outriggers, tri-colored lights and our single style leg sunshade. 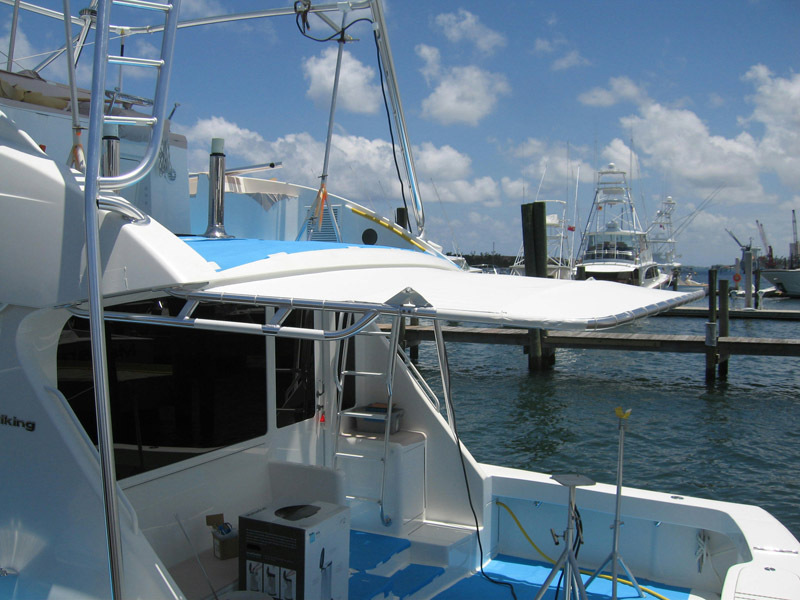 Also attached are photos of a 2nd boat with the undersides painted on the hardtop, platform and sunshade. Paul Mann / 58' - 0"
PBT installed a single perimeter rail with aft leg truss frame made of polished pipe on this Paul Mann boat. We also mounted 41'- 3 spreader Rupp "Big Rigg" outriggers, our large stepped radar pod with the aft section cut out for the 24" SAT tv dome and several LED lights. 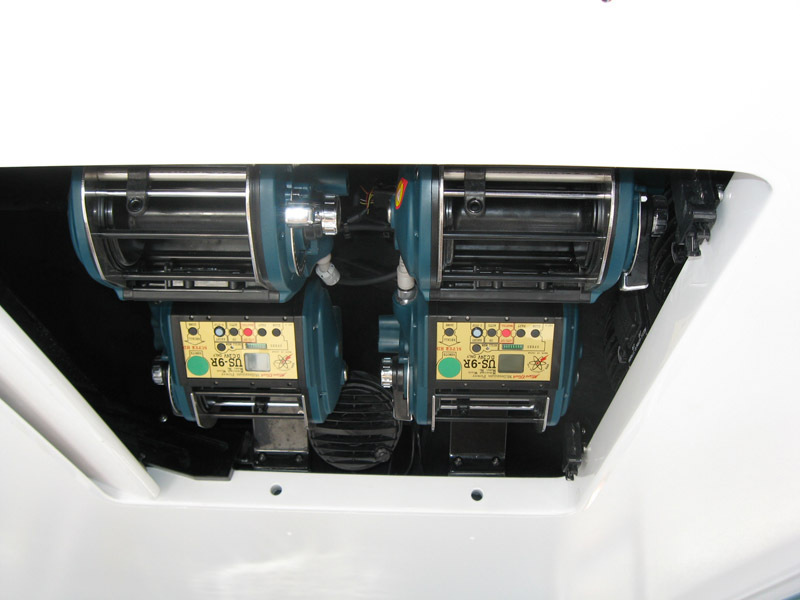 On the underside of the hardtop, (2) sets of teaser reels were installed as well as our standar drop down box. 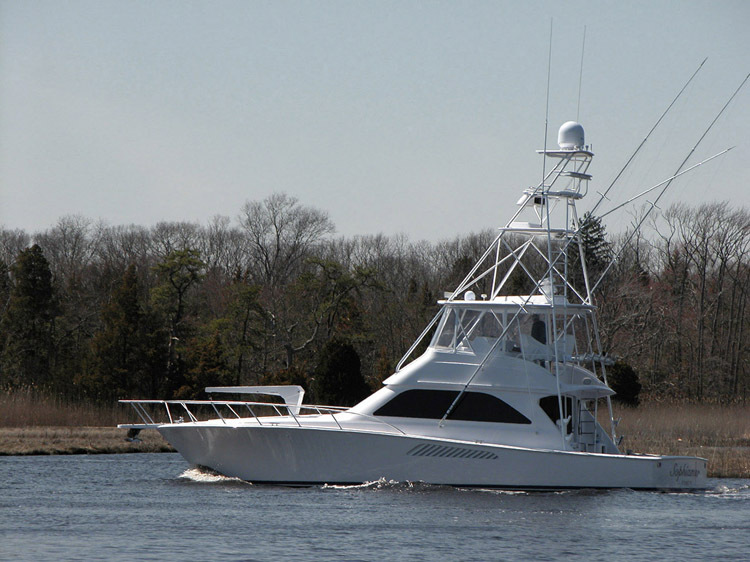 Taylor Made / 58' - 0"
This custom Taylor Made refit received a single perimeter rail with a ladder style frame. The hardtop received our curved sliding teaser door, stationary recessed electronics box, LED down lighting, LED spreader lights aft, nav lights, radar pod and SAT tv dome. As for the riggers we installed new 41'-3 spreader outriggers. 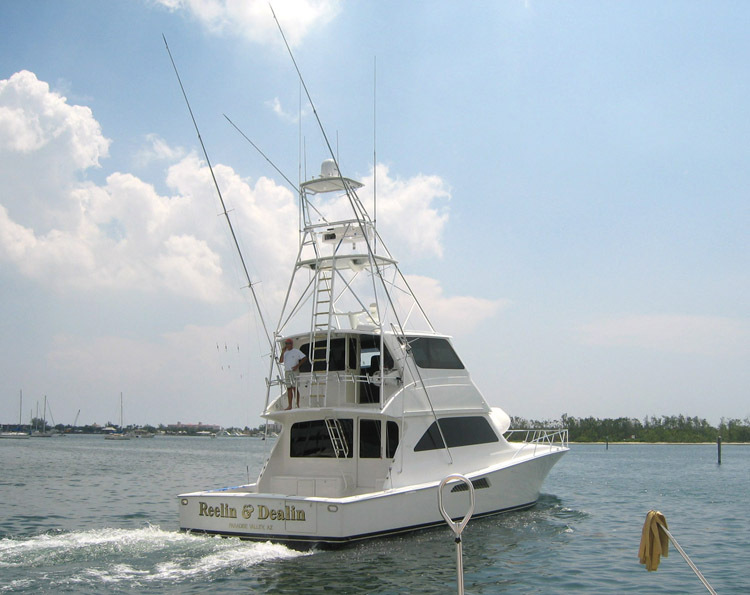 Merritt’s / 60' - 0"
PBT removed the "Ships Cafe" original tower and installed a new custom tower for long time avid angler Pete Boinis. 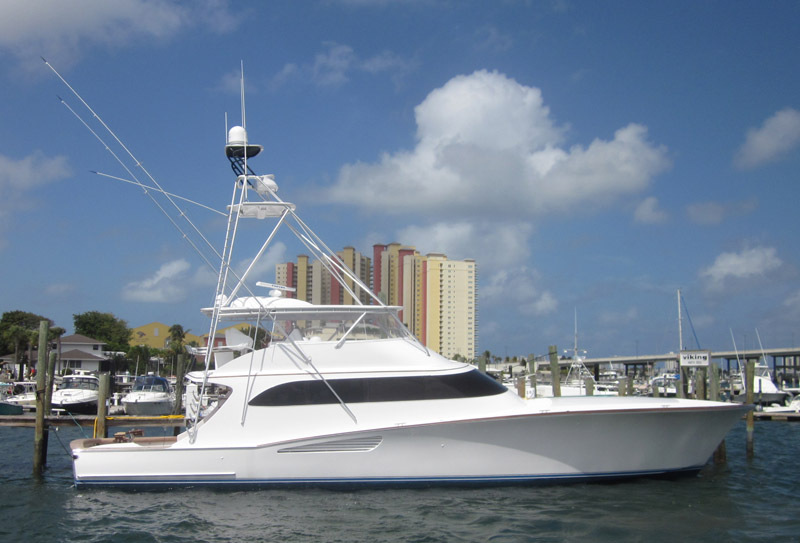 Pete has owned and rigged over twenty prestigious sportfish yachts and chose the detailed team of PBT for his latest project of a total makeover of his 60'c Merritt. This 8' gap tower was designed to flow with the traditional lines of this Merritt with providing a super clean modern look to the tower. A custom bridge rail and ladder were constructed together and welded to the tower per the owners specs. The custom hardtop included recessed teaser reels, LED tri-colored lights, molded LED NAV lights and was finished off with a super gloss Imron Snow White Paint. 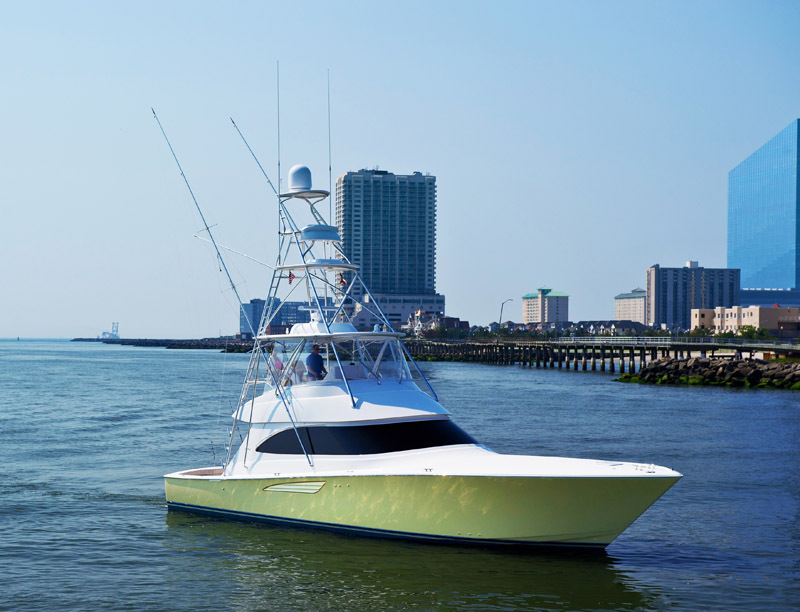 PBT's own bridge LED spreader lights were integrated into the modern molded platform and new Rupp hydraulic outriggers were installed to provide the ultimate fishing package for Pete. Jim Smith / 60' - 0"
This 8' gap polished pipe tower was mounted on the side of bridge for both the front and aft legs. It also received a 50" control box, tri-colored lights, sliding teaser reel door and remounted the existing outriggers. Garlington Yachts / 61' - 0"
62' Weaver Boat Works "Miss Scarlet"
Weaver Boat Works / 62' - 0"
This Weaver boat received an 8' gap tower with polished pipe, tri-colored lights, slider teaser reel door, NEW PBT radar pod and large drop down box. 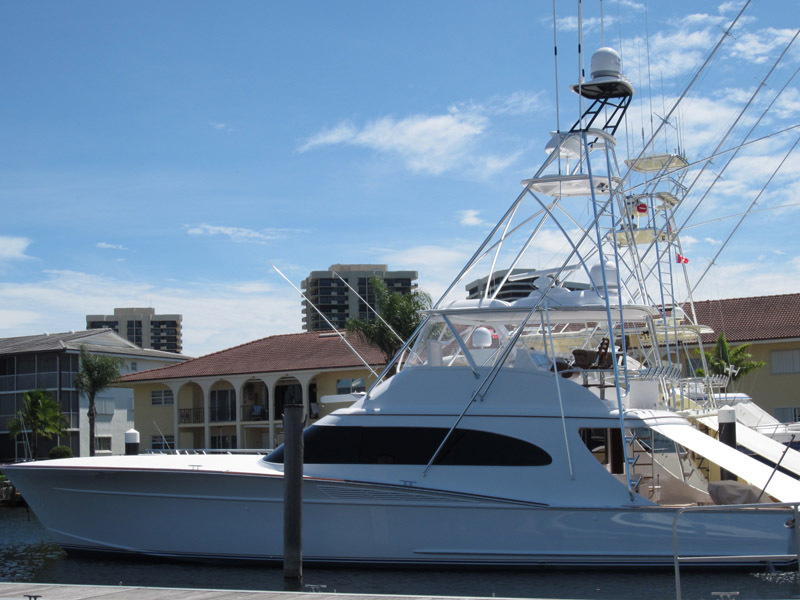 We also mounted 41' Bigg Riggs with rigger locks and mounted custom handrails around salon windows. 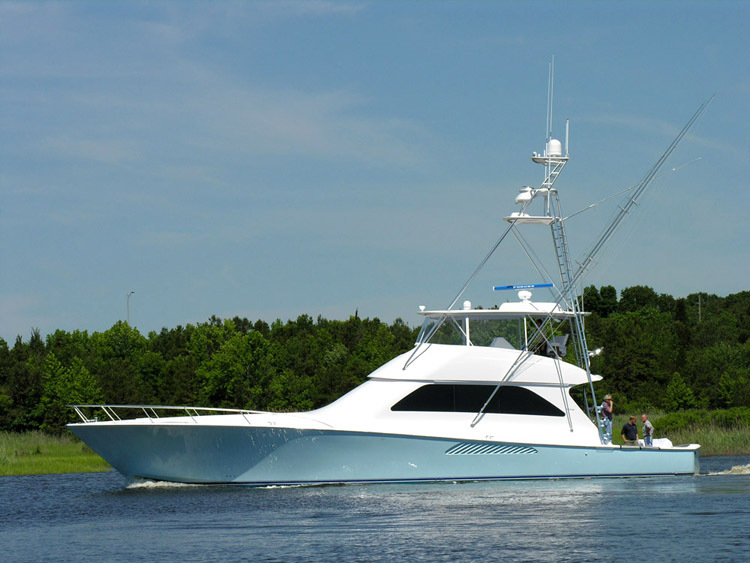 Spencer Yachts / 62' - 0"
Once again PBT took its tower install crew on the road to Spencer Yachts in NC to install a 7'-6" gap tower on the New 62'c "Marlin Darlin". 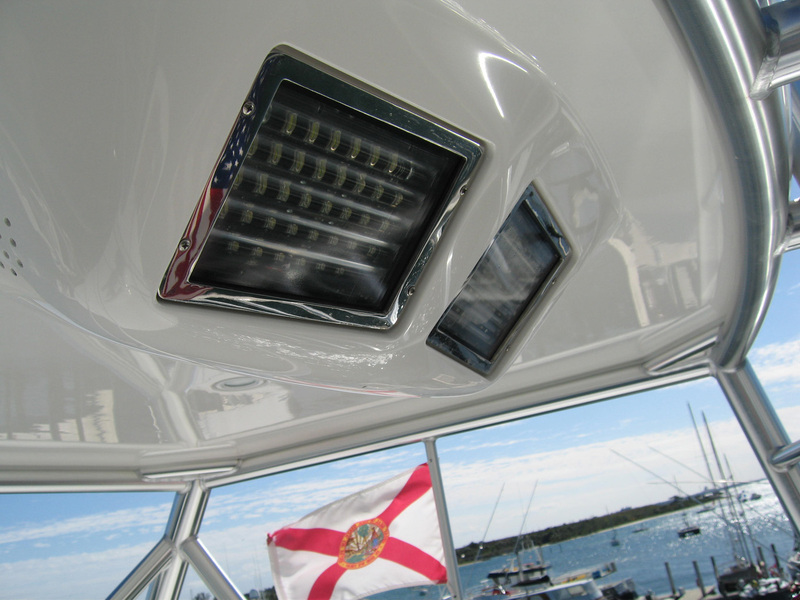 We installed all of our newest features on the boat from our curved pipe, to recessed electronics box in the hardtop, tri colored LED lights, 53" control box and LED spreader lights. To keep the reflection down while up in the tower we painted the sunshade frame and top of the control box Satin Black. 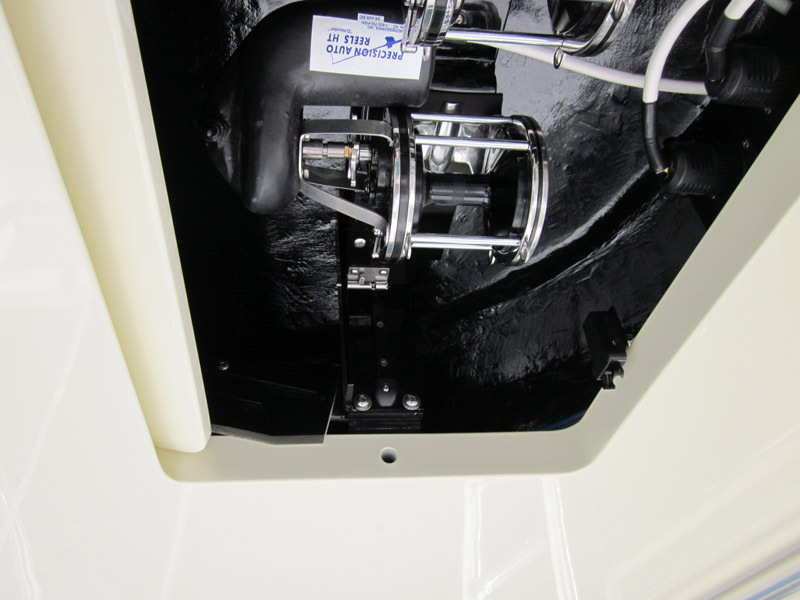 We also installed a set of 43'- 3 spreader outriggers on the boat as well. 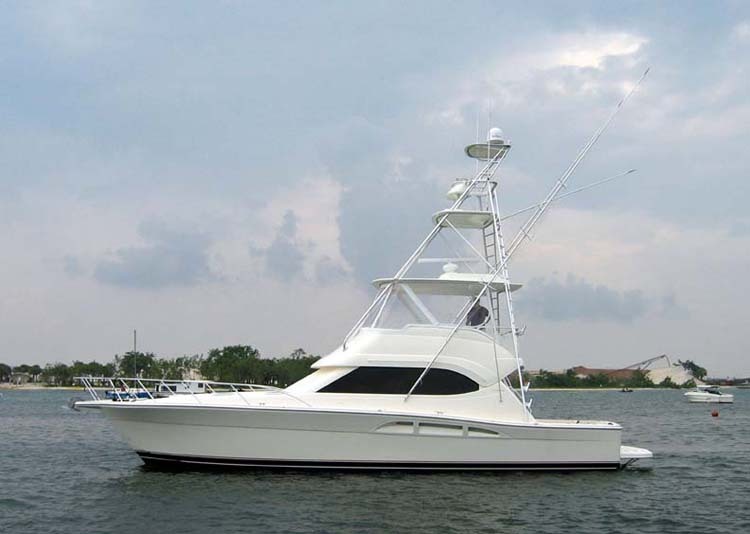 Merritt’s / 63' - 0"
This 9' Gap tower came several options including a built in bridge ladder to the aft bridge rail of the tower, low profile radar pod with slider teaser reel asembly and a Merritt style pedestal/control box combo. 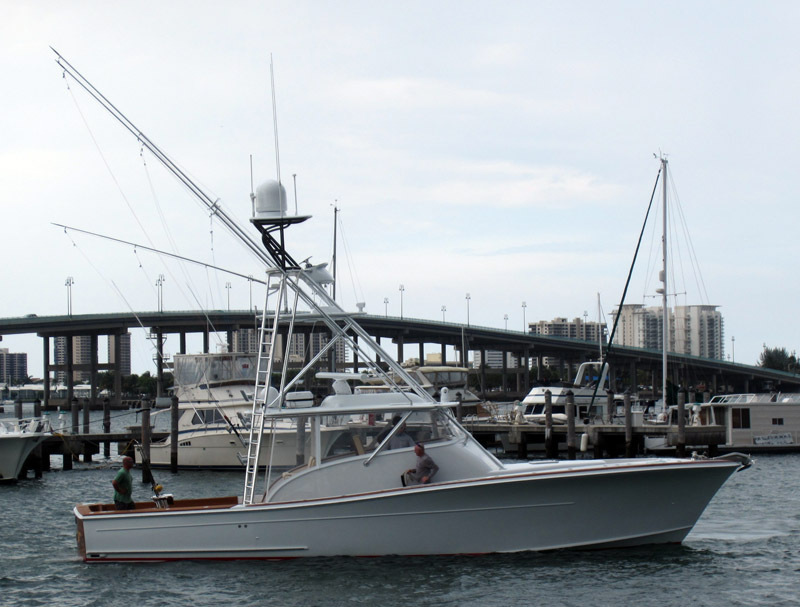 Weaver Boat Works / 63' - 0"
We installed an 8' gap tower with a custom aft bridge rail, west coast style bowrail, bridge mounted 36'-3 spreader Rupp outriggers and a custom bridge ladder. They also received tri-colored LED lights, drop down electronics box and a 60" control box. 64'c Weaver Boat Works "Southern Pride"
Weaver Boat Works / 64' - 0"
This 64'c 10' gap tower received our new coupler box on the platform, recessed teaser reels under the sunshade and our 63" control box. It also received 43'-3 spreader outriggers and aft legs turned into the cockpit wing for mounting. 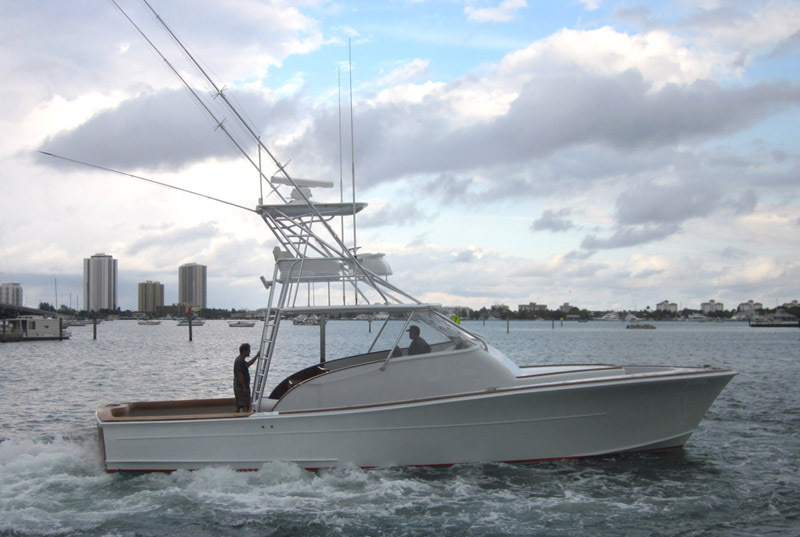 64'c Weaver Boat Works "Cyntinory"
This is a 9' gap tower with 43'- 3 spreader outriggers and a double rail hardtop perimeter rail. 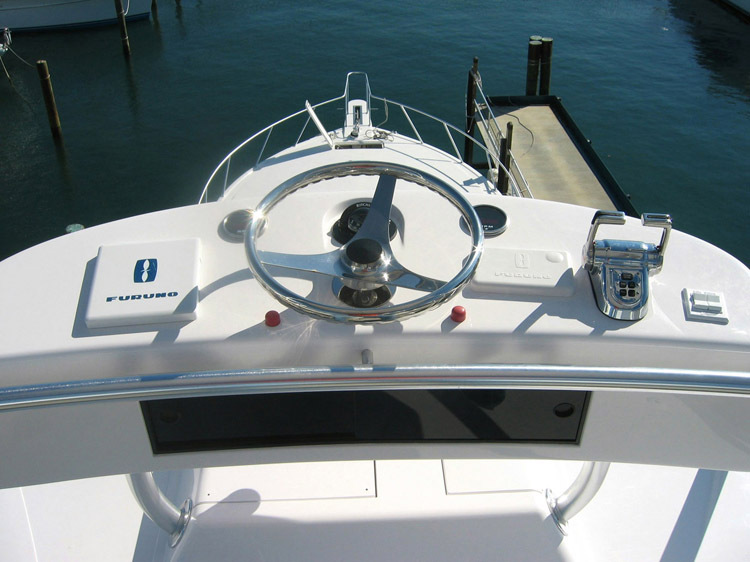 The hardtop is fit with a slider teaser reel, drop down box, Release Marine custom grommets, painted light green underside and several other items. 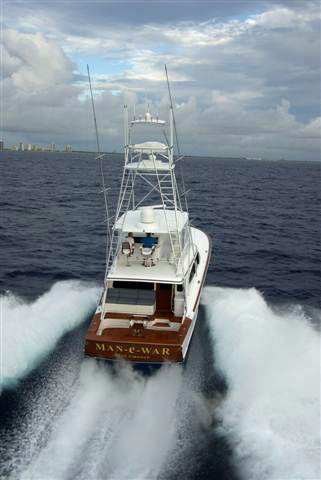 64'c Bayliss Boat Works "Man-e-War"
Bayliss Boat Works / 64' - 0"
This Bayliss boat received a 9ft gap tower with the aft main legs into the side of the cockpit wing, (4) teaser reels in the hardtop and a larger sliding teaser reel bracket door. F&S Boat Works / 64' - 0"
This speedy 64’ express “Full Throttle” that was built by F&S boat works was quite an exiting project to work on. 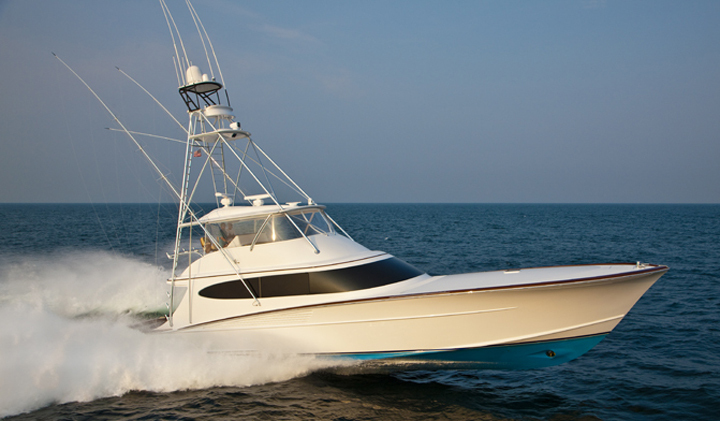 From the beginning we knew this boat was going to run over 50 knots, so we worked closely with Jim Floyd to make sure every mounting point for the tower was reinforced and built with the most high tech materials available. In working with the F&S team and their 3D CAD models along with our 3D tower designs, we were able to set the exact location of every brace and pad, before the boat was built. Making it very efficient for the builder The 6’ gap tower was built using polish pipe with 3” front legs and 2 ½” pipe for the aft legs. This really streamlined the look of the tower as we built around the larger pipe on the boat. The tower received (5) spreader lights on the underside of the platform, tri-colored LED lights, hydraulic outriggers mounted on the hardtop , our 63” control box, which fit the large 15” Garmin display, (12) rod holders on aft legs and rocket launcher between inner legs and blacked out the upper section of the tower. This 8' gap tower has the tower front legs to the front of the bridge and a custom two person bucket seats up in the tower. 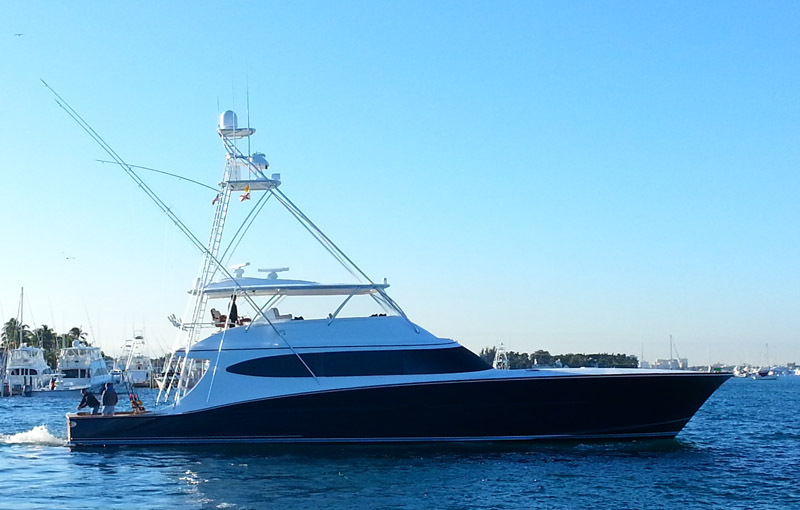 Viking Yachts / 62' - 0"
Viking introduced its hot new 62'c in February showing off her custom PBT 8' Gap Tower. With all of her extreme curves and angles, PBT followed this same styling throught the tower with our contoured and curved pipes, braces, raked enclosure, radar pod and control box. The upper end of the tower is set up for the ultimate comfort and visibility while fishing. The buggy top frame and control box top are Satin Black to reduce the glare from the water. A tailored wrapped belly band cushion provides soft padding and clean visibility, while the electronics are recessed into two boxes with lids to protect all of your equipment. 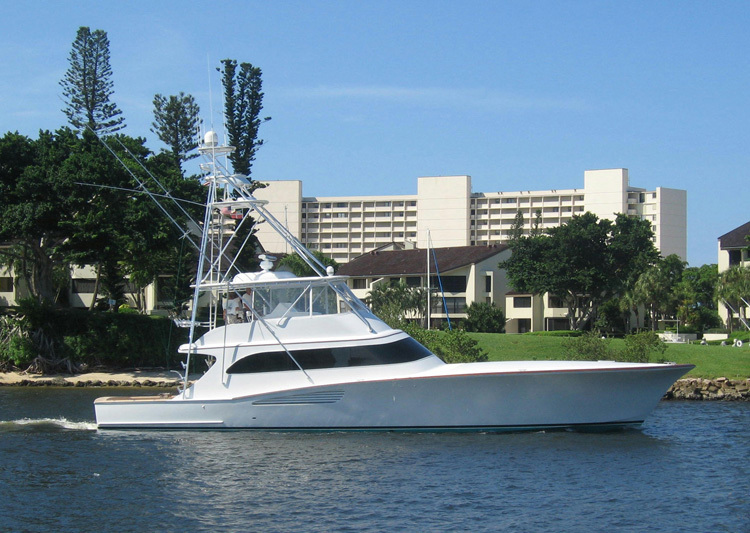 Bertram Yachts / 63' - 0"
PBT installed a custom hardtop & frame that came complete with 43'- 3 spreader Rupp "Bigg Riggs" outriggers, tri-colored LED lights, (4) speaker slots in hardtop for recessed speakers and a stationary radio box on the underside of the hardtop. We also created a unique aft seat with backrest that was incorporated into the side saftey rail and bridge ladder opening railing. 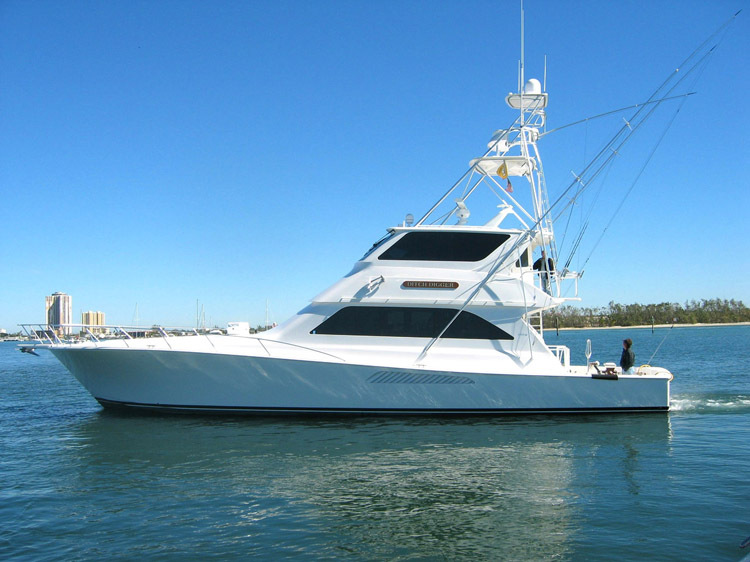 Viking Yachts / 64' - 0"
Both towers in the 64'c photos are 10' gap towers with 43'- 3 spreader outriggers, large oval radar pod and tri-colored lights. One of the towers has the underside of the fiberglass painted to match the hull. 65' Mann Boat Works "D.A. 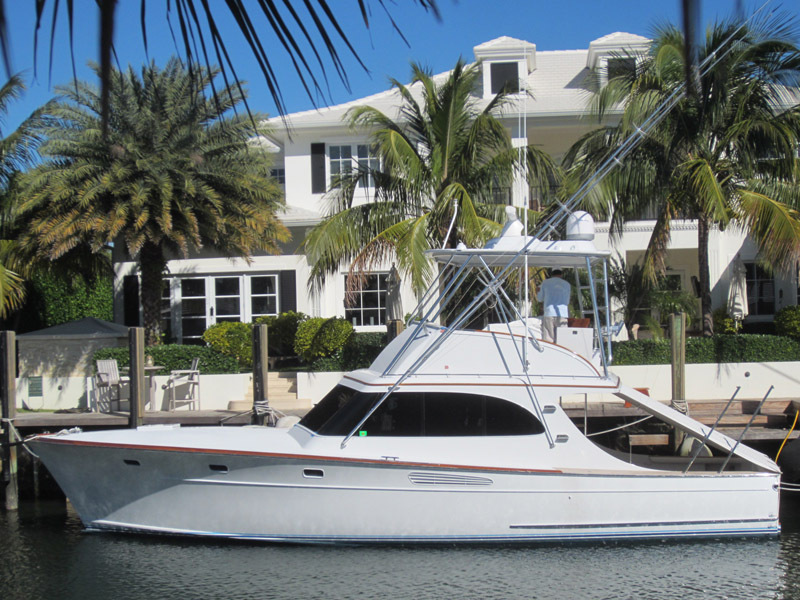 SEA"
Paul Mann / 65' - 0"
PBT installed a custom hardtop and truss style frame with the aft legs of the frame turning into the side of the house for a less cluttered look. This 6' gap enclosed bridge tower has its front legs to the top of the hardtop. Also came complete with 43'- 3 spreader outriggers, center ladder with acylic white steps and molded quartz lights on the underside. 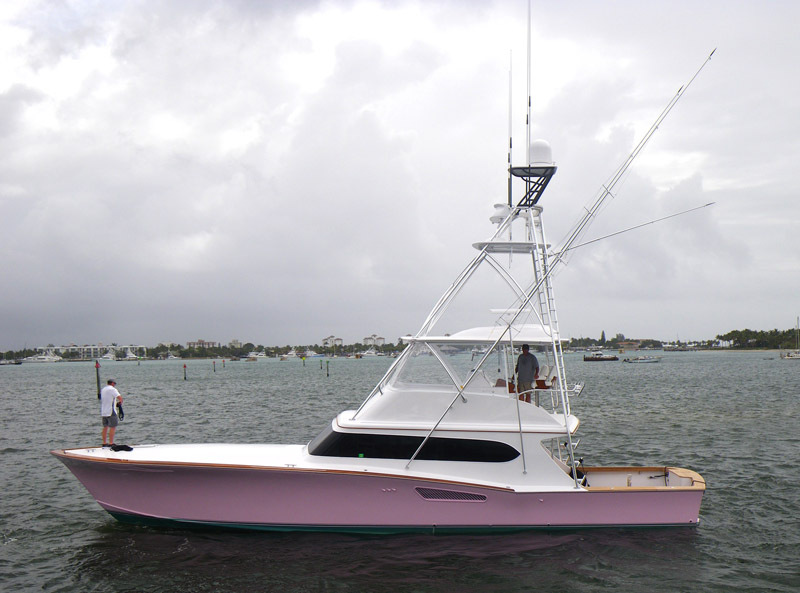 Holton Custom Yachts / 65' - 0"
This is an 8' Gap tower with slider teaser reel, drop down radio box and the underside of the fiberglass parts painted to match the hull. The rigger were reinstalled after the new tower was mounted. 65'c Island Boat Works "Jester"
Island Boat Works / 65' - 0"
This is an 9' Gap, 43'- 3 spreader outrigger with the front legs mounted to the top of the house, just forward of the bridge. 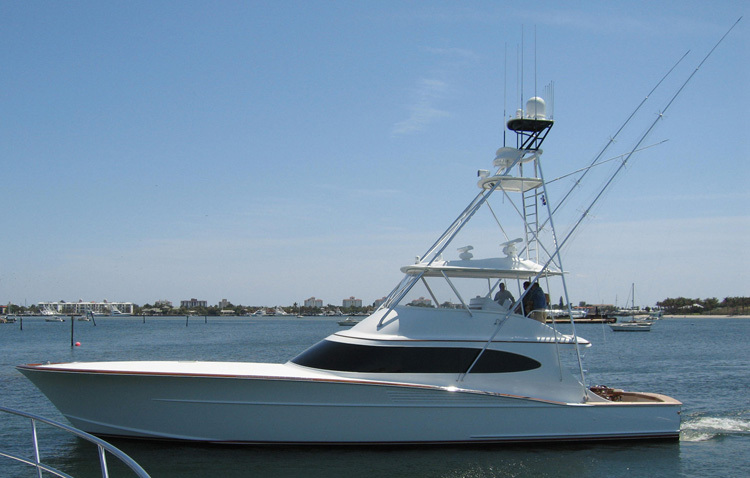 Viking Yachts / 65' - 0"
This is an 8' Gap tower with 43'- 3 spreader outriggers, large oval radar pod to fit teaser reels and a flip radio down box. This 6' gap enclosed bridge tower has its front legs to the top of hardtop. 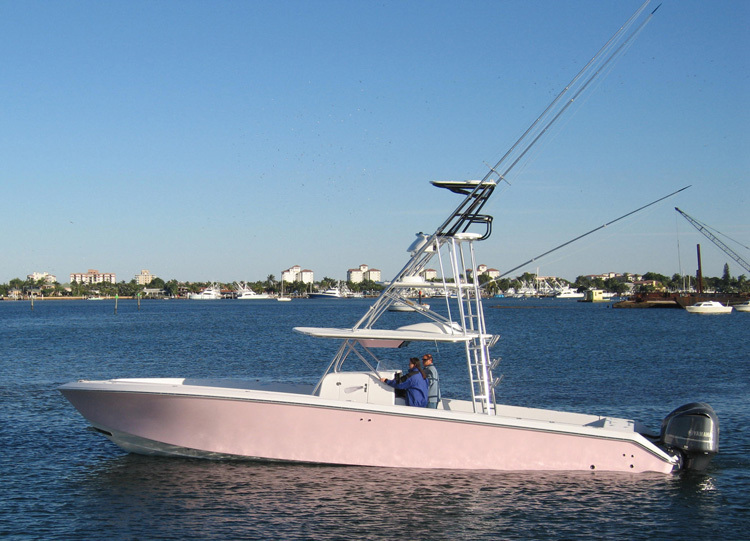 It also comes complete with 43'- 3 spreader outriggers, nav lights in the platform, acrylic center ladder steps and a 3 sided aft bridge rail. 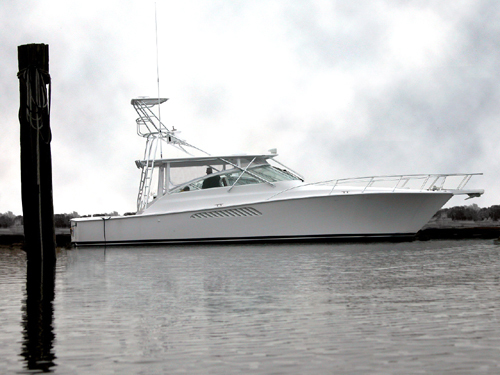 Bayliss Boat Works / 65' - 0"
PBT installed a 9' Gap polished pipe tower on this 65' Bayliss. 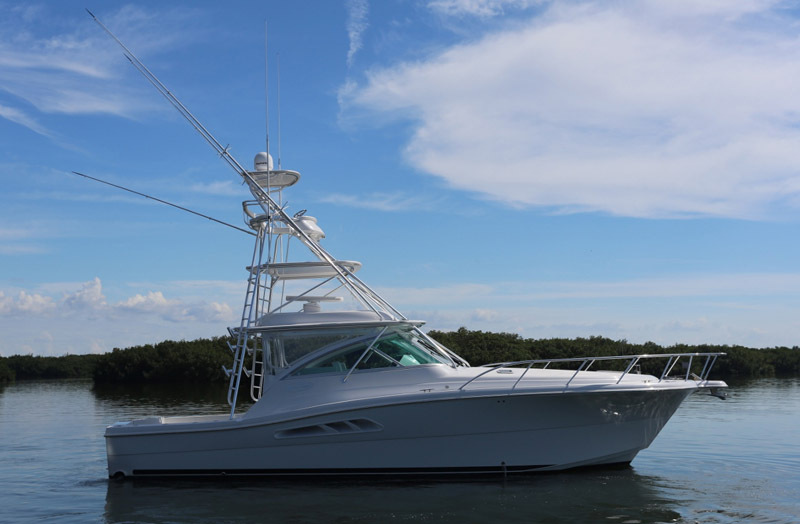 Some of the towers features include a stationary recessed hardtop electronics box, 63" control box, easy access aft cut outs in the platform, tri-colored LED lights, LED spreader lights and nav lights. We also installed customer supplied outriggers and built a bridge ladder for the boat. This 9' gap enclosed bridge tower has its front legs mounted to the front of the bridge as well as having traditional ladder steps on either side like a convertible. The bridge deck was also extend out as you will see in one of the photos per the owner. 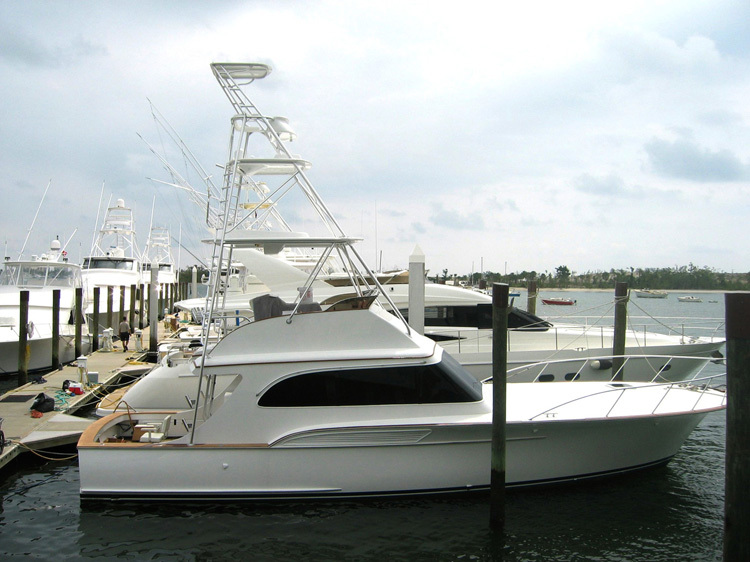 F&S Boat Works / 66' - 0"
PBT installed an 8ft gap polished pipe tower on this stylish 66' F&S. As you will notice all the tower bracing and supports are curved and contoured to match the style of the boat. Some of the items we installed on the hardtop were our stepped radar pod with the dome extension off the back, recessed tri-colored lights, (4) teasers reels and brackets, drop down box and nav lights. We also installed tri-colored lights on the underside of the platform and tower sunshade. 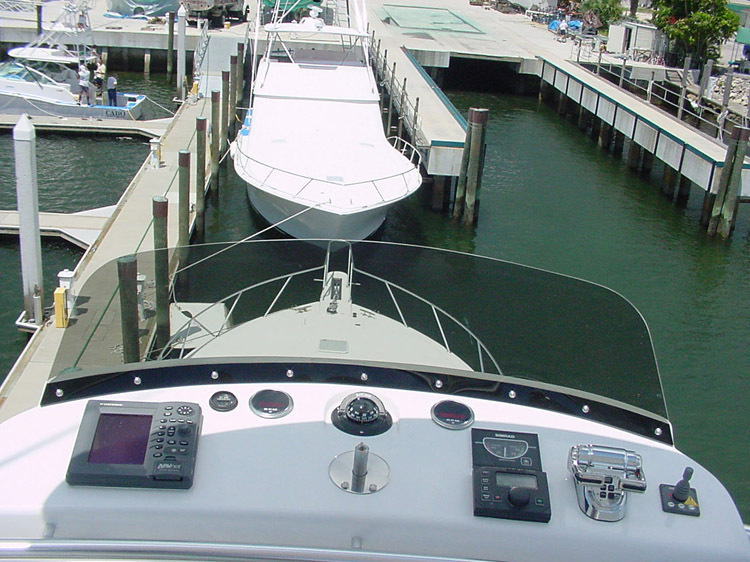 You will also notice the Satin Black colored painted on the tower sunshade and top of the 63" control box to reduce the glare off the water while in the tower. A set of 46'- 4 spreader Rupp hydraulic outriggers was also installed with Rupp rollers on the spreader. Full Length Luevered Cockpit Sunshade. 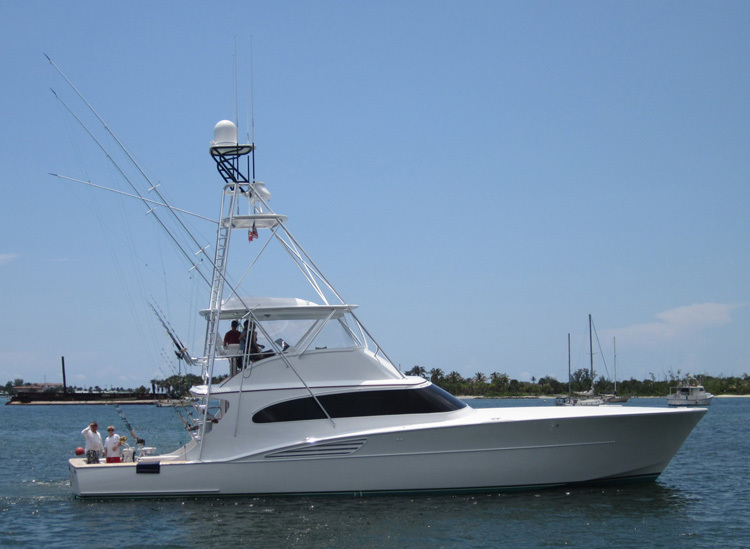 Spencer Yachts / 66' - 0"
PBT was on the road again to North Carolina to install a new custom tower package for AVID billfish angler Jose Valdes Jr. on his new 66' Spencer "Mojito". PBT worked closely with Jose and his crew to design the ultimate 9' Gap tower. Our pipes, braces and fiberglass parts were all curved & contoured to provide a perfect fit to the curved and angled lines of this Spencer. All of the fiberglass parts were built using carbon fiber and the (2) teaser reel brackets were custom designed to slide down on tracks from inside the radar pod to below the hardtop to provide Capt. Tito with total control of the reels & lines. 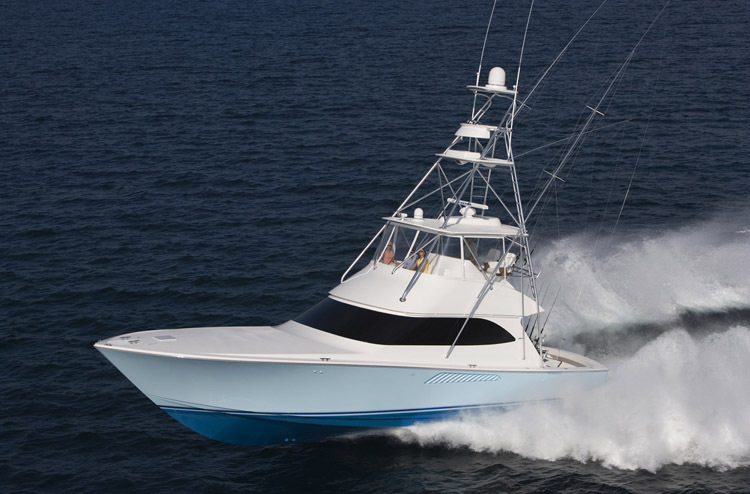 From push buttons at the helm, they can control the 48'- 4 spreader hydraulic outriggers so they can be laid out to provide the team with the perfect bait spread. (6) Aft tower leg rod holders were set to the exact height and angle that the crew requested. 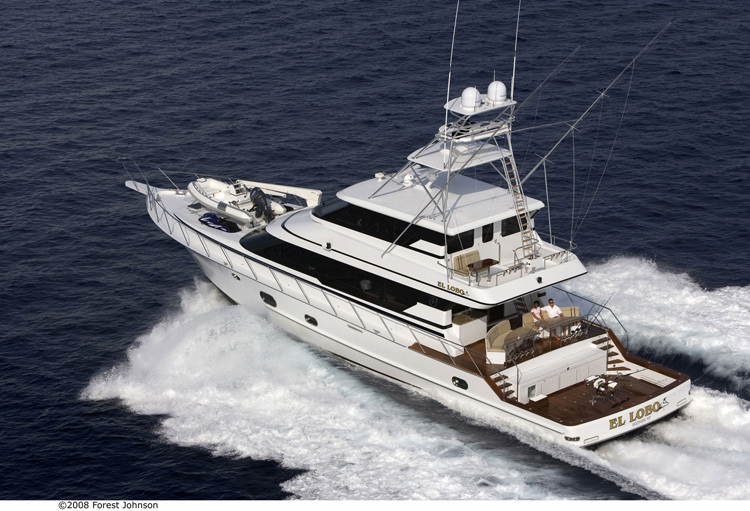 PBT is very proud to have worked with this awesome team and closely with Spencer Yachts on this project. When you see "Mojito" in Puerto Rico, Dominican Republic or St. Thomas, take a close look at the details of this impressive tower. 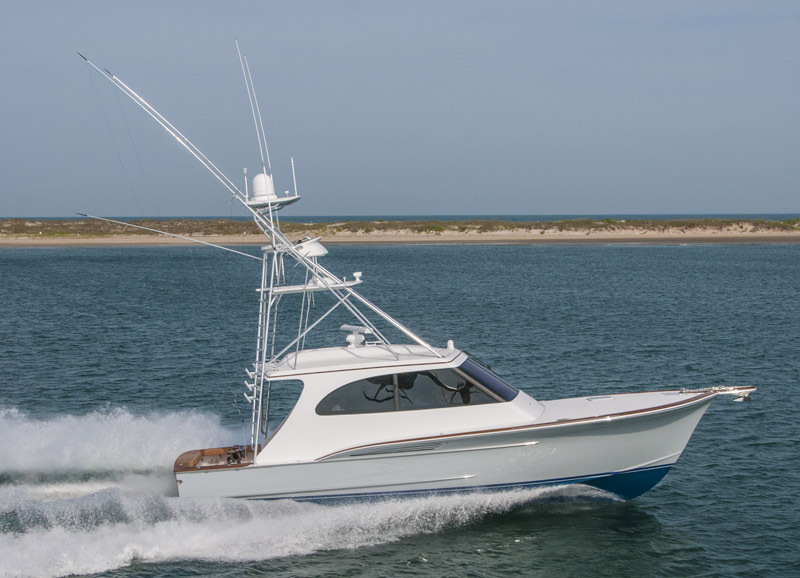 Viking Yachts / 66' - 0"
Viking rolled out there new 66'c sportfisher, sporting off a new PBT 9' gap, brushed pipe tower with carbon fiber fiberglass parts. All (4) main fiberglass parts were constructed with this carbon fiber material which has dropped the weight considerably off the parts. We also installed tri-colored LED lights, LED spread lights, electronics drop down box, 43'-3 spread Rupp outriggers, swept/curved supports for the tower and our 63" control box. 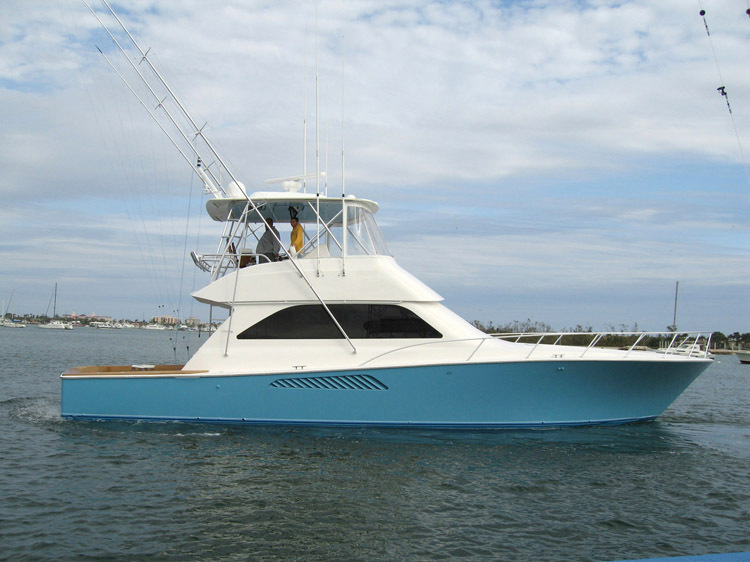 67' Mann Boat Works "Royal Flush"
Paul Mann / 67' - 0"
Viking Yachts / 68' - 0"
This 10' gap tower comes with 43'- 3 spreader outriggers and 2 1/2" front and aft legs. 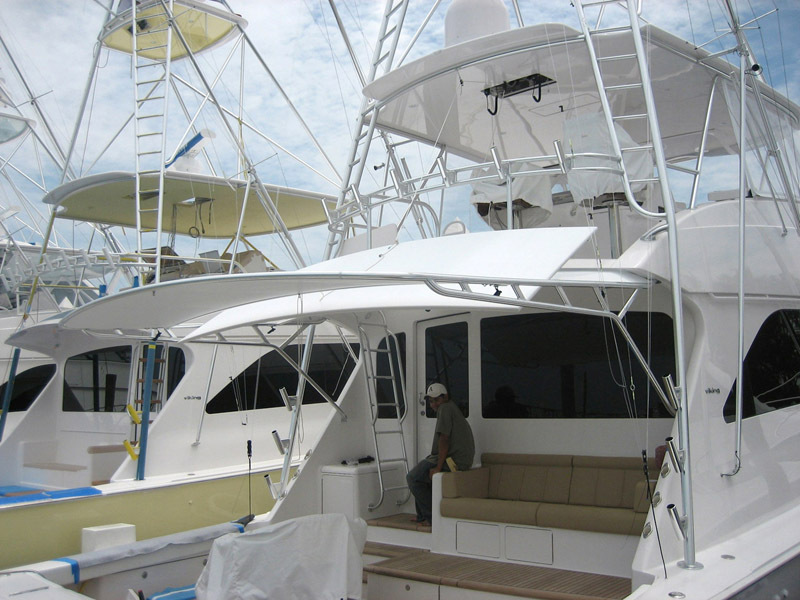 This custom molded hardtop with single perimeter rail aluminum frame came with our large radar pod, two single quartz lights aft on the underside of the hardtop, U shaped handrail on the underside, gold polished rod holders and 43'- 3 spreader outriggers. 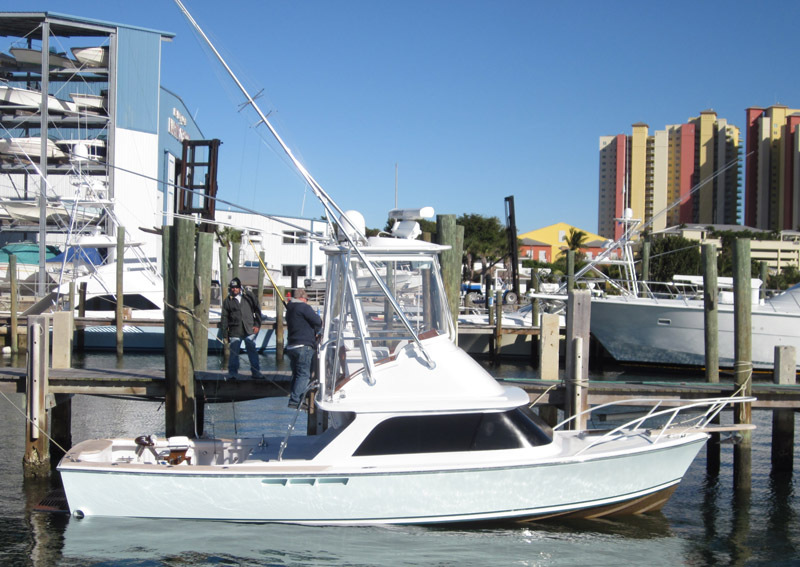 F&S Boat Works / 67' - 0"
This 8' gap tower tower received our (4) teaser reel setup with sliding door, easy access aft platform cut outs, 46'-6" 4 spreader Rupp "Bigg Riggs" and our newest 63" control box. 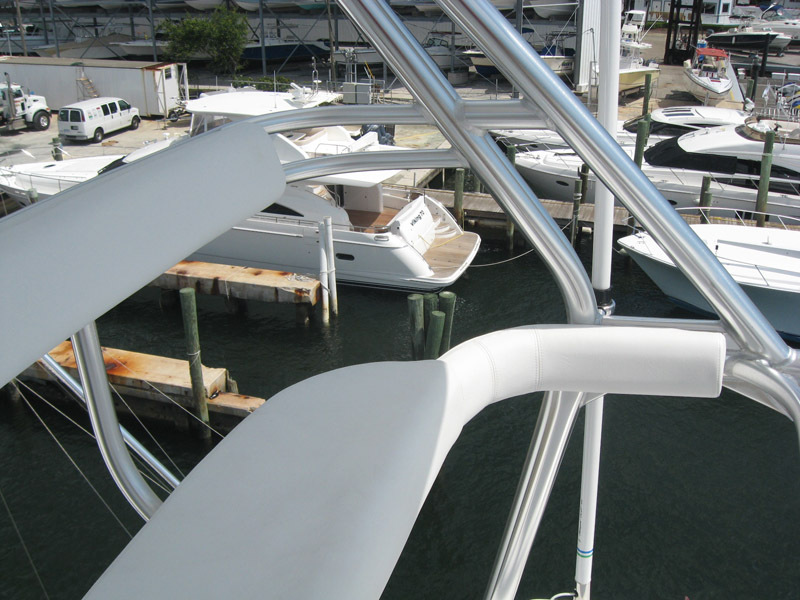 We also installed the Hydro locking arms for the outriggers as well as the custom bridge ladder. 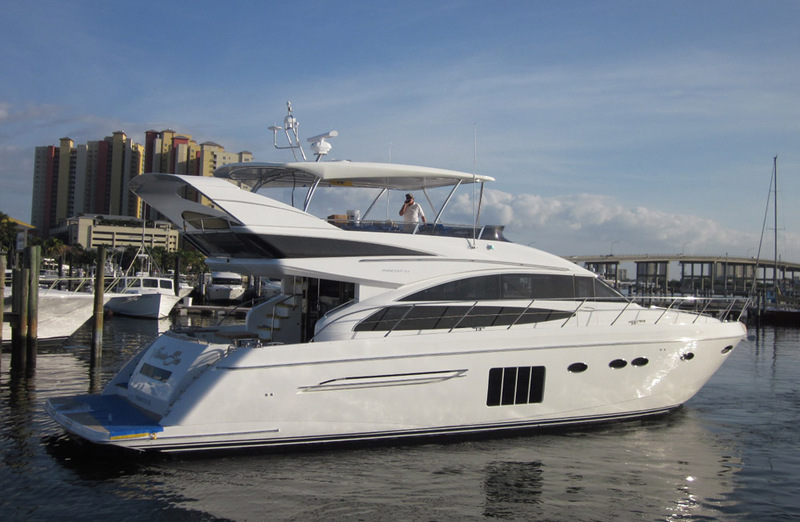 Sunseeker / 63' - 0"
PBT took there talents to the "Big Apple" this time to mount this brand new custom CS hardtop and frame. The two biggest features of this CS Hardtop are the retractable 8' x 8' power sunroof and the fiberglass side wings that follow the metal arch style frame. We also installed LED lights on the underside as well as custom drain paths for the water run off on the hardtop. 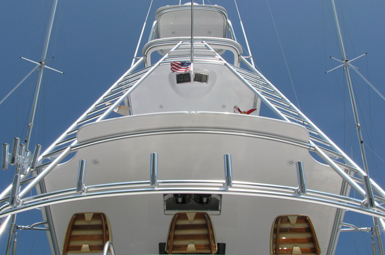 Viking Yachts / 70' - 0"
This brushed pipe tower received a 9' gap with the front legs to the front of the bridge and our standard center ladder layout. As you will notice in the photos, we had his teaser reels custom painted white to match the hardtop overhang, where the reels are mounted. We also installed a hailer horn in his forward light pod. 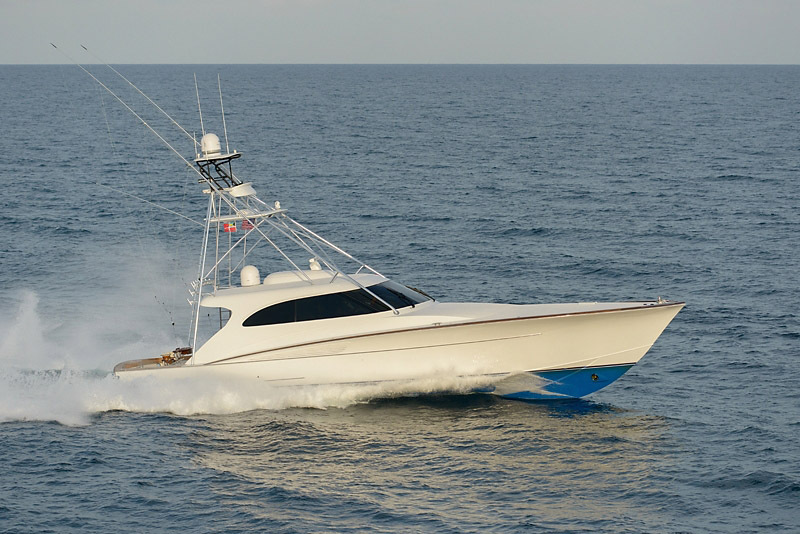 Princess / 64' - 0"
This 64' Princess received our custom CS Hardtop which included side hardtop wings, carbon fiber laminant, (2) Sat dome mounts and an aluminum truss sytle frame. 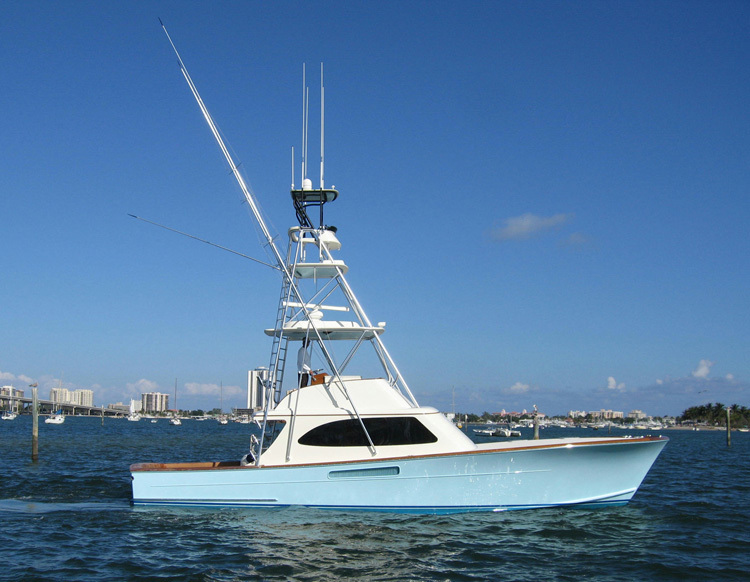 68'c Bayliss Boat Works "SEVEN"
Bayliss Boat Works / 68' - 0"
This 9' Gap tower came with multiple custom options including Bayliss supplied radar pod to support slider teaser reel door and drop down radio box. Other tower options were aft legs returned into the side of the house and hardtop recessed speakers. 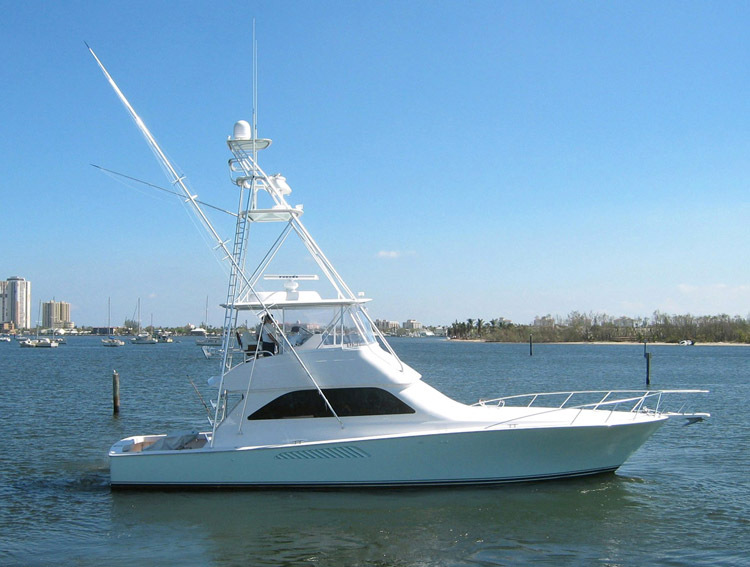 Hatteras Yachts / 70' - 0"
This 7' gap tower was designed with traditional style ladder step, 43'-3 speader Rupp outriggers, nav lights in the corner of platform fiberglass, bridge ladder safety rail and several fin style rod holders. 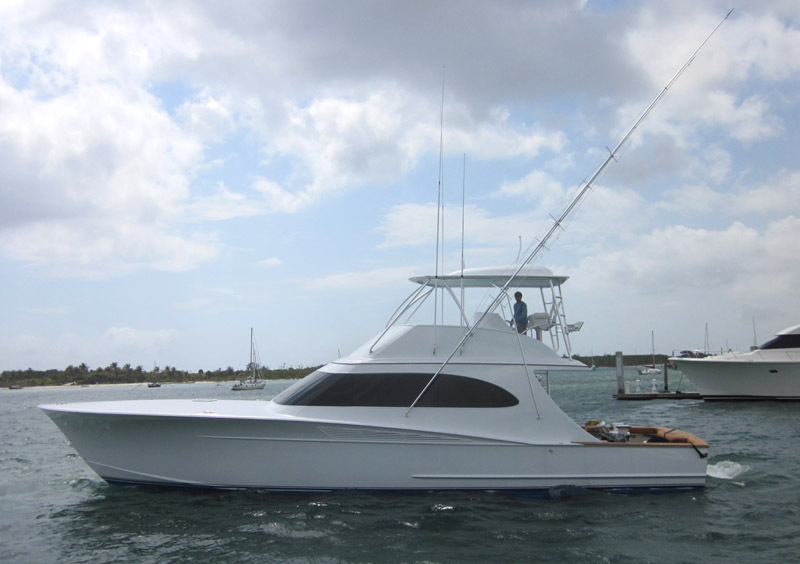 Jim Smith / 68' - 0"
PBT removed the original hardtop & frame off of the boat and replaced it with a 9' gap tower. We installed tri-colored LED lights, nav lights, LED spreader lights, sliding teaser reel door and many other standard item we would normally mount on a 68'c. As for the outriggers, we re-used the current ones on the boat and just remounted them to follow the front leg of tower. 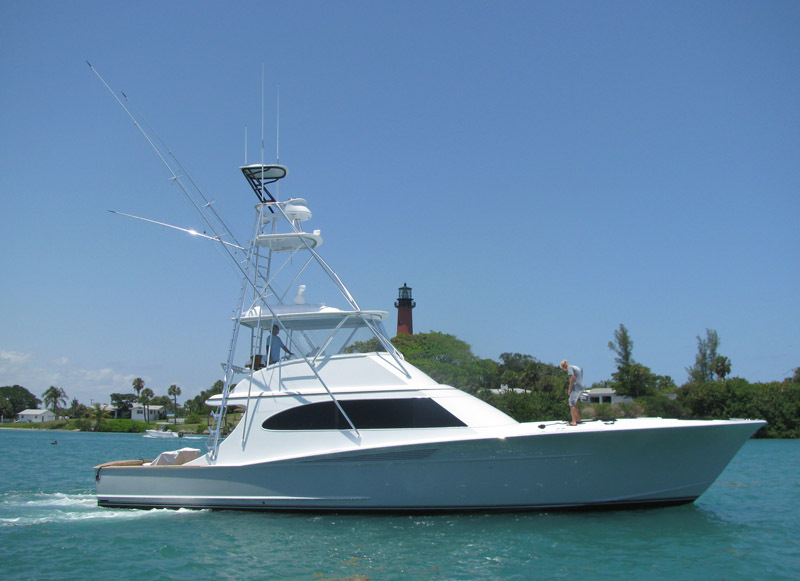 68'c Bayliss Boat Works "Uno Mas"
68'c Bayliss Boat Works "BudMan"
This 9' gap tower has come with several custom options including Bayliss supplied radar pod, hardtop speakers, tower aft legs returned into the side of the house and 43'-3 spreader outriggers. 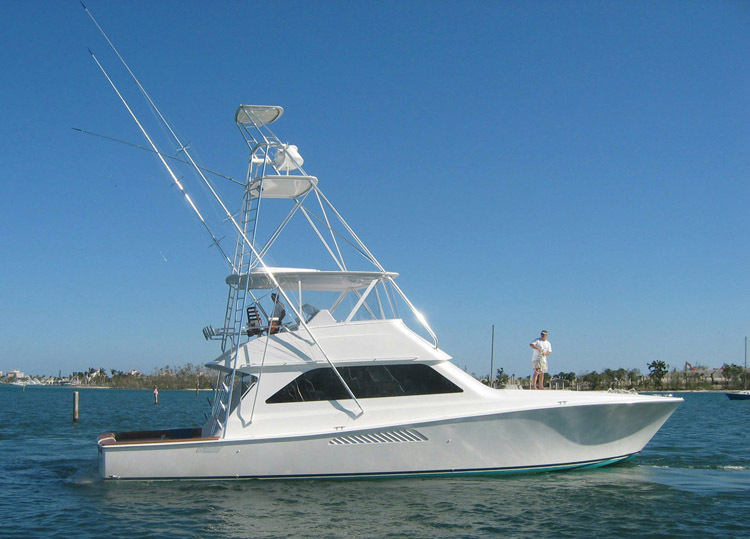 Viking Yachts / 74' - 0"
This is an 11' gap tower with 47'- 4 spreader outriggers, 3" forward pipe for the legs and a large radar pod for slider teaser reel and drop down radio box. This custom molded single perimeter rail with truss style aft legs hardtop frame comes complete with our dual radar pod, side mount fiberglass pods, 47'- 4 spread hydraulic outriggers and quartz light pods on underside of hardtop. This 7' gap tower came with our large belly ring, 2 1/2" front legs to to of the hardtop, acrylic ladder steps, 43'- 3 spreader outriggers and our dual radar pod. The platform was outfitted with 3 single quartz light pod aft and 1 fwd. 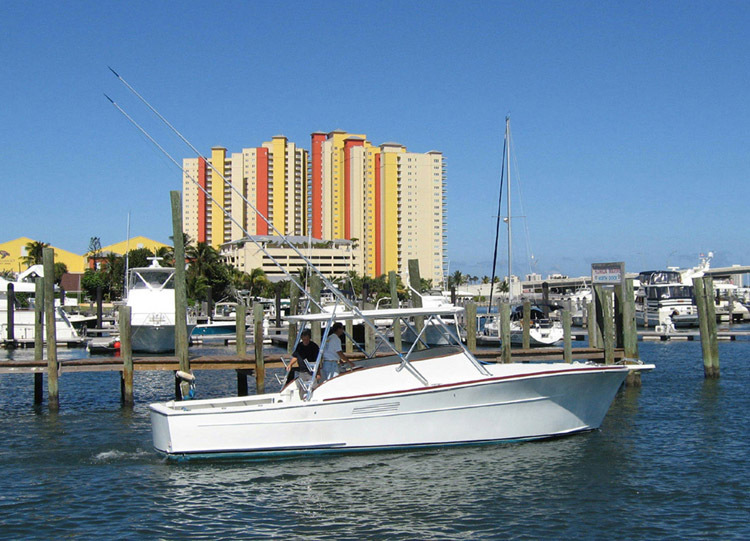 68'c Weaver Boat Works "Happi Daze"
Weaver Boat Works / 68' - 0"
This is a 9' gap tower with 43'- 3 spreader outriggers and several of our standard options. 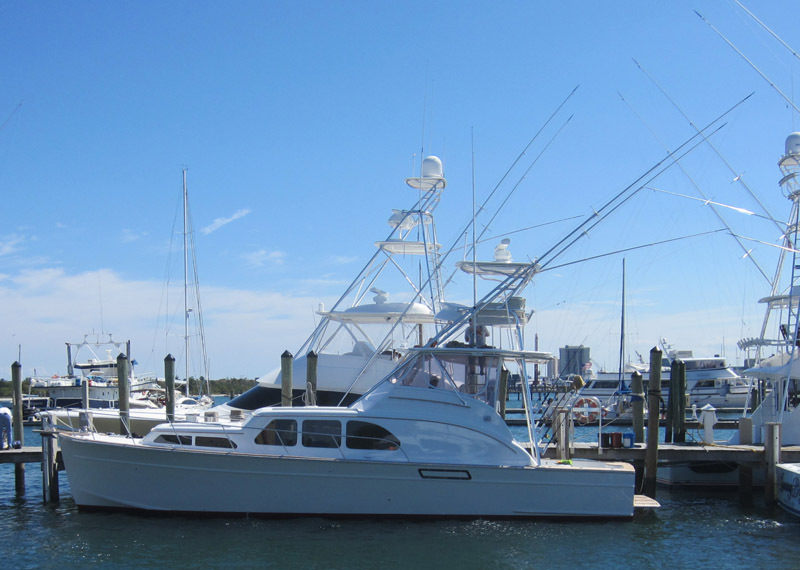 Buddy Davis / 68' - 0"
This 10' gap tower received a set of 43' Rupp "Bigg Riggs" outriggers, custom bridge ladder and many more of our standard options. 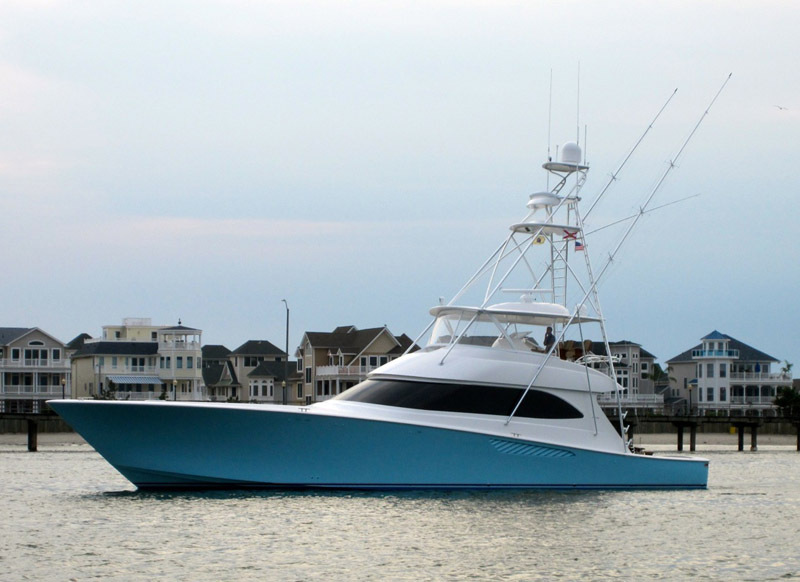 Spencer Yachts / 69' - 0"
PBT was back in North Carolina in April to install a custom 9' gap tower package on the first 69' Spencer "Da Bait" for avid Billfish angle Jeff Cohen and Capt. Curt Lind. The boat spends most of the year at Los Suenos and the remaining time in St. Thomas, So Curt spends much of his day in the tower. To accommodate all of his needs up top, we installed a dedicated pair of electric teaser reels under the buggy top, offset the wheel & controls to the STBD side. This allowed us to provide him with a large recessed electronics box to hold various units including 12" display, plus CAT engine displays. To eliminate glare from the sun, PBT painted the entire buggy top frame and fiberglass underside Satin Black. The final custom piece was a wrapped belly band cushion for extra padded comfort. 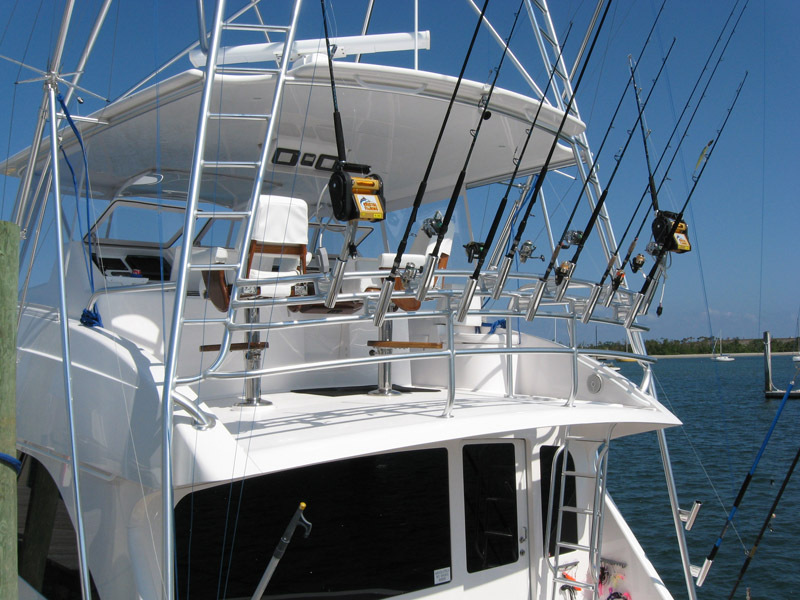 With the various size tackle this customer needs for fishing throughout the world, they required an additional rod storage, which PBT molded into the hardtop to hold (10) rods & reels plus gaffs. Also designed into the hardtop was a recessed electronics box, recess opening to hold (4) electric teaser reels and a Satin painted underside. 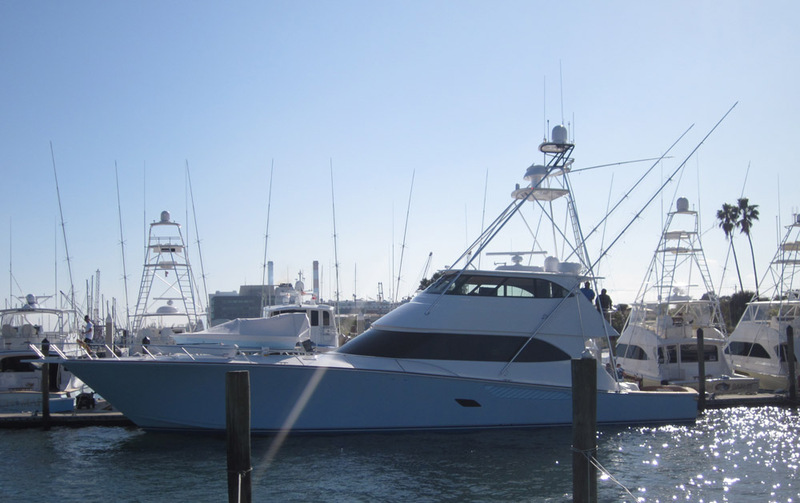 Rupp's 48'- 4 spreader hydraulic outriggers were installed to provide the ultimate spread, along with (6) rod holders on the tower aft legs. LED spreader lights and tri colored accent lights provided bright lighting throughout the tower. 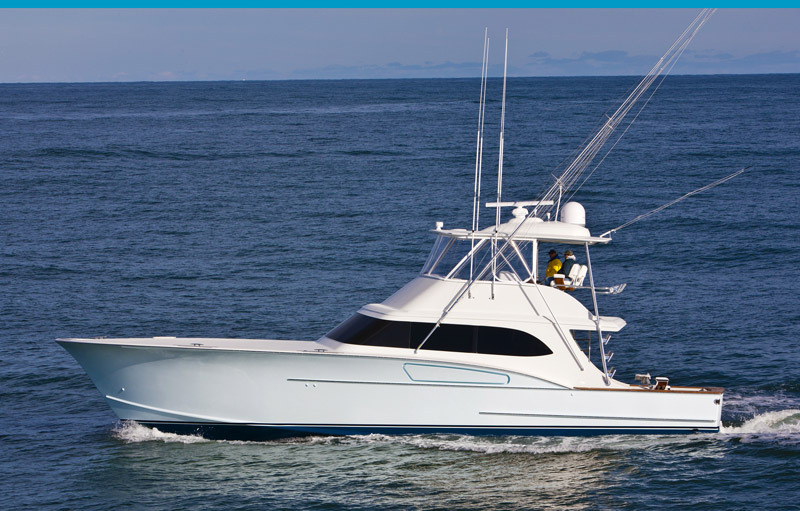 When you see "Da Bait" in Costa Rica and St. Thomas, take a close look at PBT's curved pipes and contoured fiberglass parts that provide a perfect fit to the Spencer styling. F&S Boat Works / 70' - 0"
This 7' gap polished pipe enclosed bridge tower received 3" front legs and traditional ladder style aft legs. 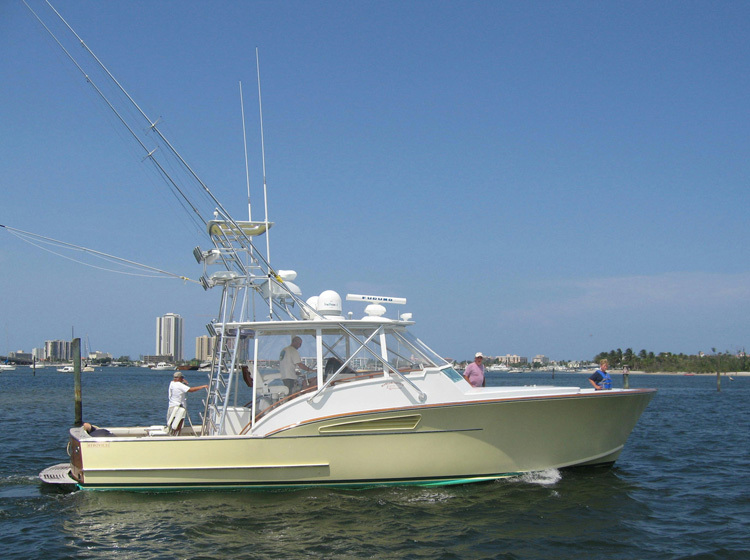 The tower also has 3 in1 quartz light aft, nav lights, 60" control box and 50'- 4 spreader Rupp "Bigg Riggs" outriggers. Wanchese / 70' - 0"
This 9' Gap tower received a 60" control box, 43-3 spreader hydro outriggers, tri-colored lights and the pipe to be polished. We also built a custom hardtop radio box to support electronics and an air flow box per the customers request. 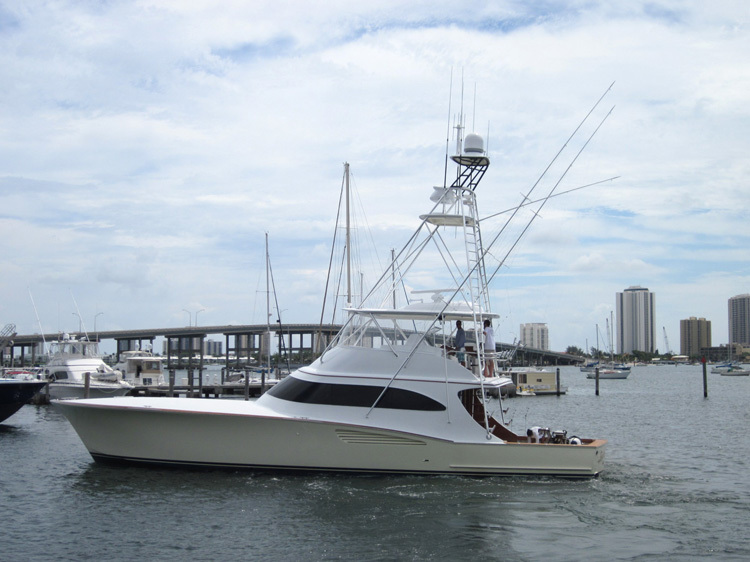 None Selected / ' - "
Princess / 67' - 0"
Viking Yachts / 76' - 0"
This 9'-6" gap tower was built with 2 1/2" front and aft legs, our new fiberglass platform aft section cut out and 48'-4 Spreader Rupp Hydro Riggers. We also installed our new 63" control box in the tower. 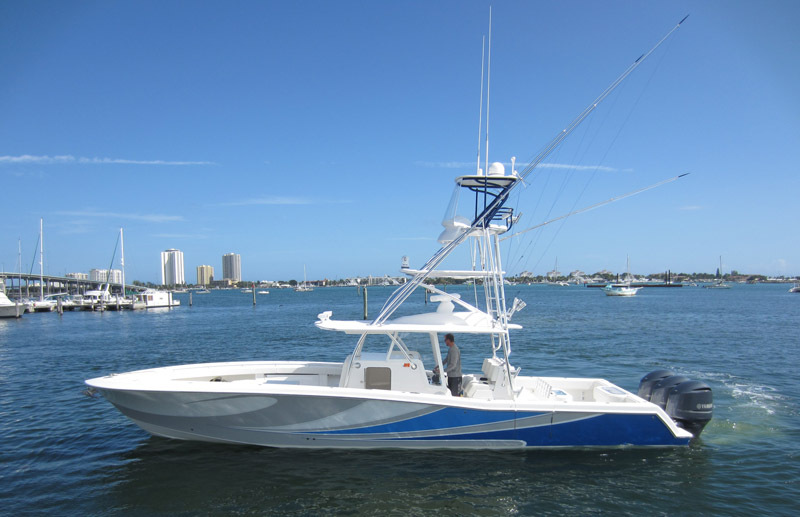 Jim Smith / 71' - 0"
PBT brought their talents up to Stuart, FL this spring to install a state-of-the-art custom designed tower on the latest Jim Smith Tournament boat "FISH ON". 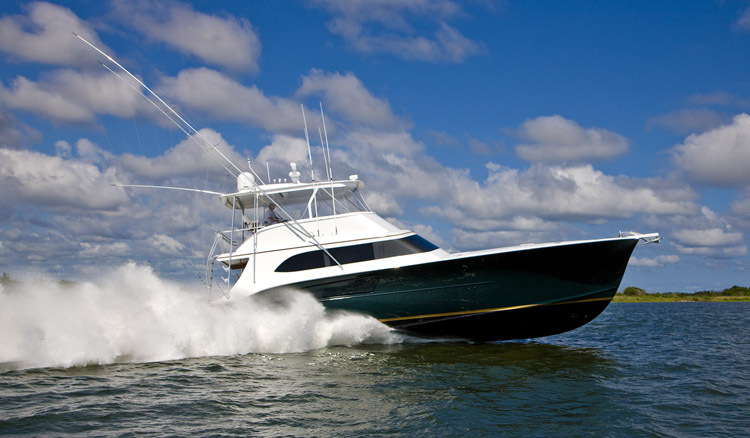 While working closely with owner Rob Kathary, President of Jim Smith Boats, John Vance and Capt. Elliot Cline, the PBT team spent months discussing every one of the owners needs in their tower package for fishing throughout the world. Detailed 2D & 3D CAD drawings where supplied to design the perfect 10' gap tower and electronic equipment for the overhead recessed box and control box. The large Night Vision/Search lightwas custom molded on the underside of the platform along with five molded LED spreader lights. Other features include a custom SATIN finished anodized pipe, ALL fiberglass parts were fabricated using Carbon Fiber material, black buggy top to reduce glare and the underside of the custom hardtop was finished with a low maintenance SATIN non-skid paint. 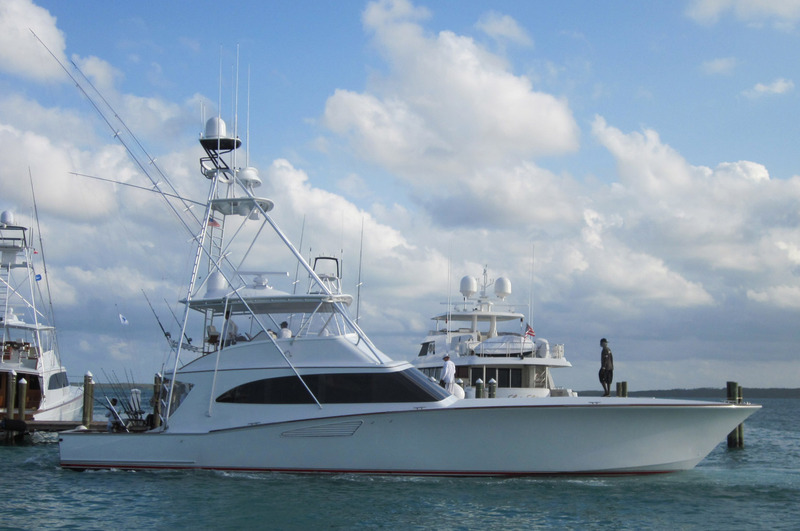 Congratulations to Rob and the crew of "FISH ON" for winning the Bermuda Triple Crown Tournament Series. This 7' gap tower came complete with 84" belly band, 43- 3 spreader Hydro Outriggers, new led spreader lights and our stationary electronics box on the underside of the sunshade. We also installed a hailer horn inside of light recess per the customer. 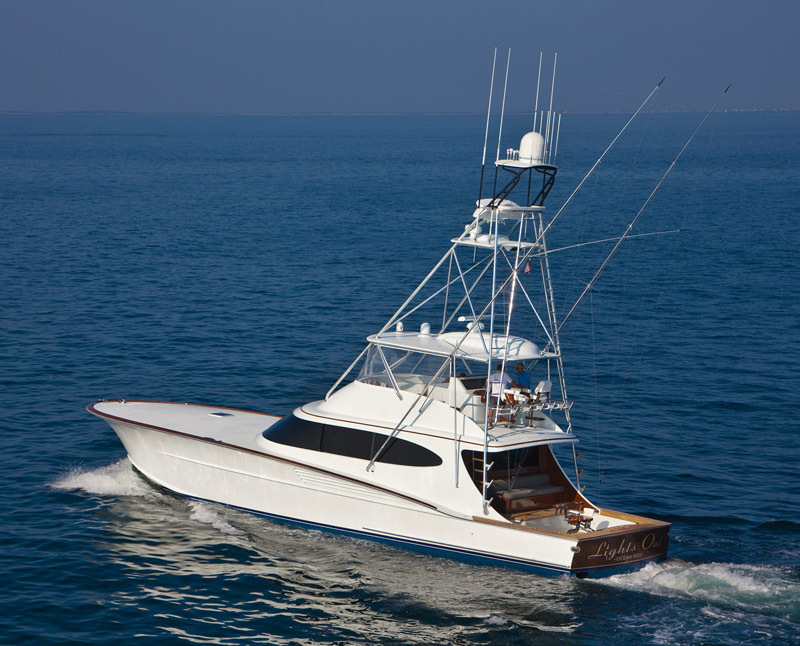 F&S Boat Works / 72' - 0"
Bayliss Boat Works / 77' - 0"
Bayliss Boat Works / 80' - 0"
This 80' Bayliss received an 11'-6" gap tower made with polished pipe and 3" front legs. As you will notice we have curved and contoured all the tower bracing and supports to match the style of the Bayliss boat. 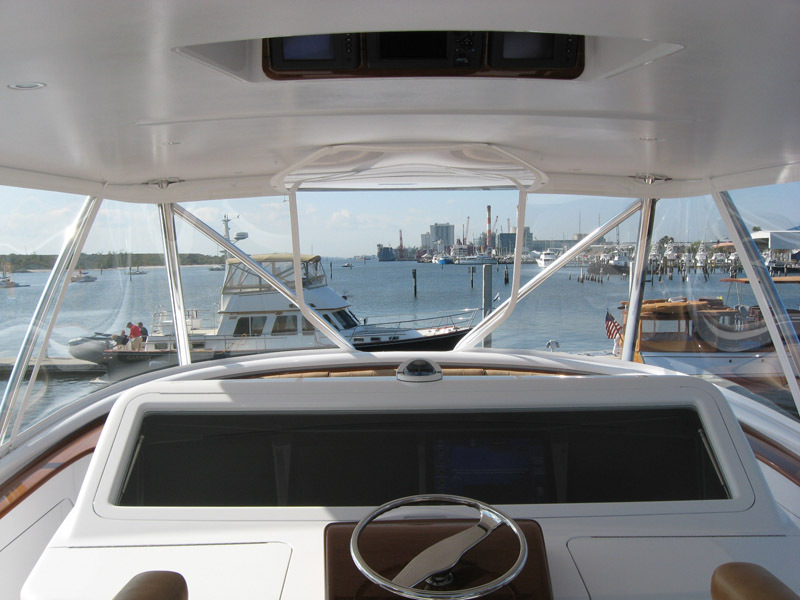 On the hardtop we installed LED navigation lights, LED tri-colored ligths, Bayliss's custom radar pod with a PBT SAT dome extension molded in, (4) teaser reels, drop down box and S/S grommets on underside for teaser lines. As for the platform, it received our newest coupler box on top, 3 in 1 and single light pod on the underside with our easy entry cut out in the platfrom when coming up the ladder. 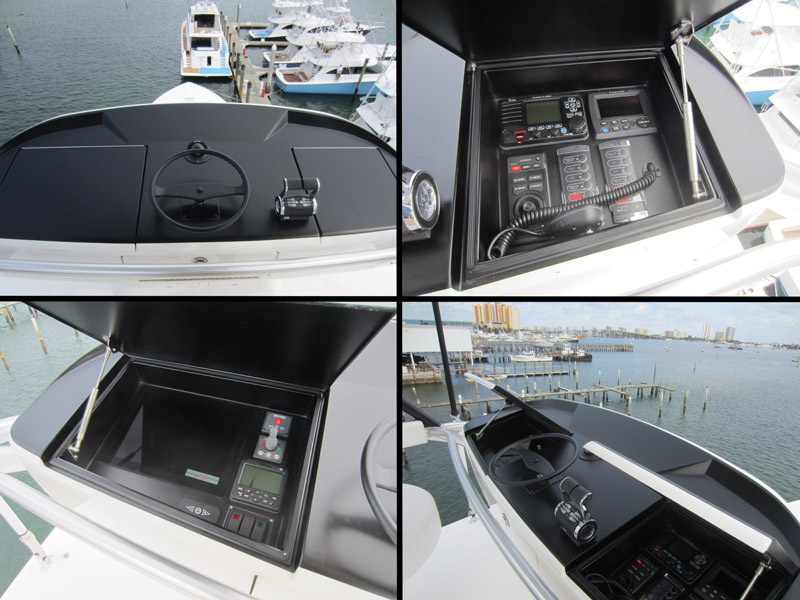 For fishability, we painted the upper section of the tower and control box top Satin Black as well as installing hydraulic outriggers on the boat. 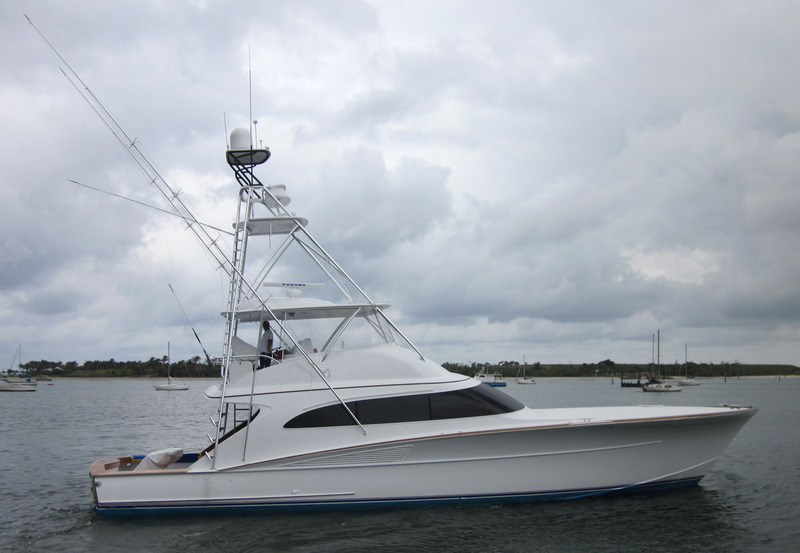 Bayliss Boat Works / 73' - 0"
PBT installed several new custom options on this 11' gap tower that we tailored for the owner and captain on Shark Byte. 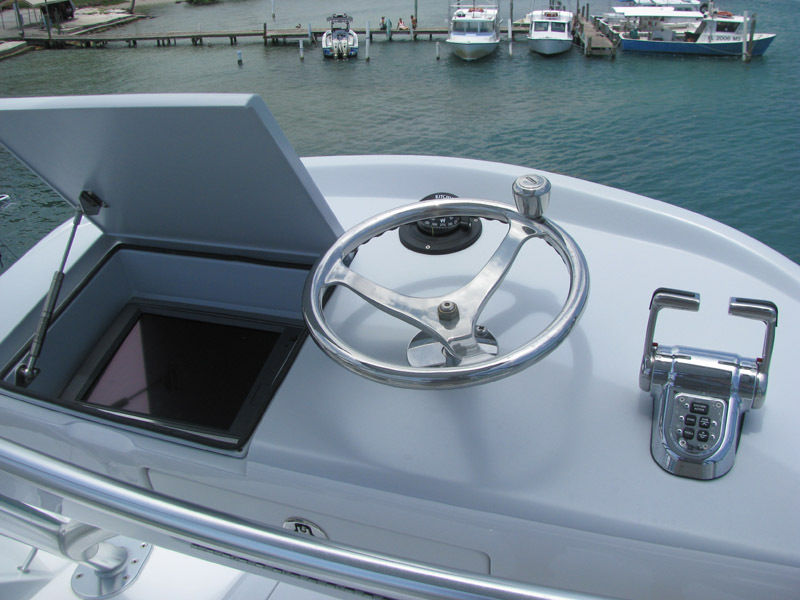 The first item we created was a single larger recessed box for our 63" control box with the steering wheel off to the starboard side. The next item we created for them, was a cuved aft side door for the teaser reel and drop down box lids. Finally we installed Bayliss's custom radar pod that was specifically altered to fit our hardtop componenents. Other standard items that we installed on this tower include easy access openings on the platform, nav lights, tri-colored LED nav lights, LED spreader lights and bridge ladder. 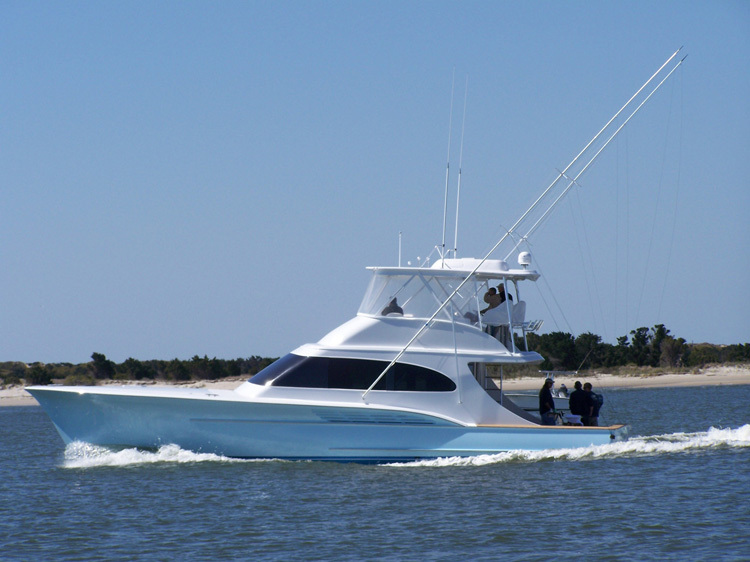 80' Weaver Boat Works "Islamar"
Weaver Boat Works / 80' - 0"
Weaver Boat Works just splashed there new 80'c sportfish with a new PBT SATIN finished anodized pipe tower. As with all of our towers, we spent countless hours working with the customer to make sure he received everything on his wish list for his new tower. We hooked him up with (4) teaser reels and a drop down box in the hardtop, double rail perimeter rails around the hardtop and aft leg mounting into the side of the house. We also installed our black out kit up in the tower to reduce glare by spraying SATIN black paint on the sunshade and control box. On the riggers, we installed a set of 50'- 4 spreader Rupp Hydraulic outriggers with hydro locking arms and layout arms. 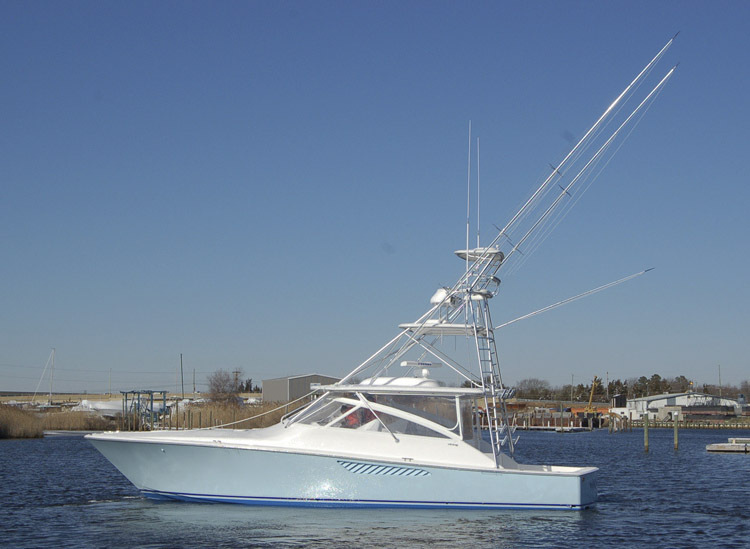 80'c Weaver Boat Works " Miss Pat"
This 12' gap tower received 49'- 4 spreader hydraulic outriggers, a custom bridge ladder, handrails around the house windows, tri colored lights and our large drop down box in the hardtop. 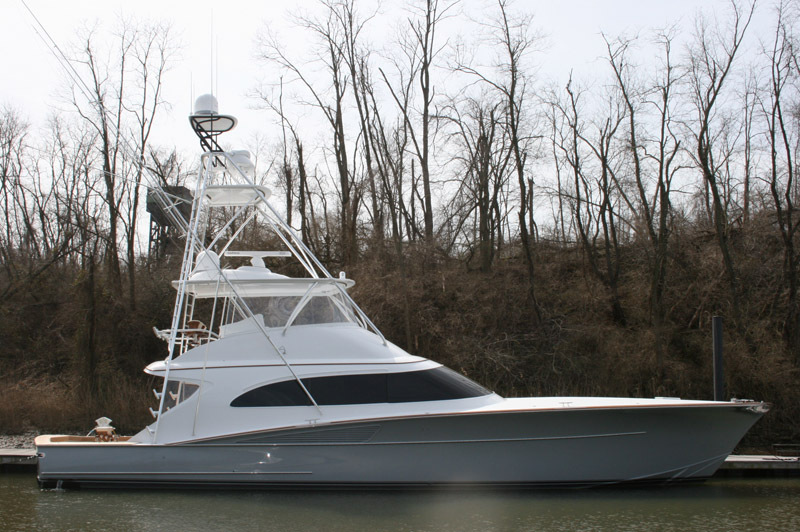 Bayliss Boat Works / 84' - 0"
PBT traveled to Wanchese, NC to Install an ultra custom 13” gap tower on the largest build to date at Bayliss Boat Works, the 84’ “Orion”. We worked closely with the owner Mr. Healey, Capt Justin and Bayliss in the development of the tower not only for aesthetics but functionality as well. Every angle, radius, and curve of the tower and fiberglass parts, were custom designed to follow every inch of this beautiful work of art. The aft tower legs were custom angled at 12 degrees to make climbing this massive tower super comfortable. We also created a dual flip up seat system with foot rests for the owner who likes to spend a lot of time in the tower. Another new custom item that we worked with Capt Justin was the aft electronic display inside the radar pod just aft of the teaser reel lid cavity. This would allow the captain to be able to see his sounder and charts while looking aft into the cockpit and not having to turn around. 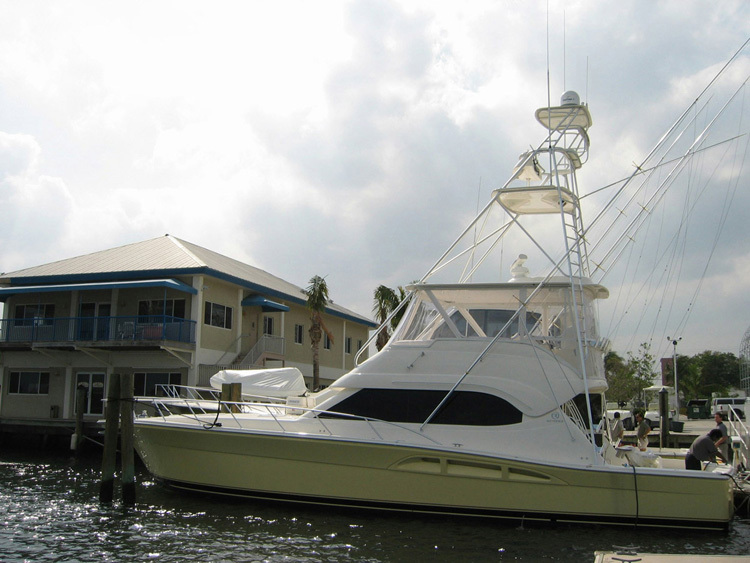 Some of the other items we installed on this tower were (4) teaser reels, a larger drop down box, hydraulic outriggers, custom release marine grommets in the hardtop, our 63” control box with large electronics box and offset controls , tri-colored LED lights and (5) LED spreader lights on the underside of the platform. Weaver Boat Works / 85' - 0"
This 85'c Weaver received a 10ft gap tower with a few custom items other than our standard setup. We installed a set of dual radar pods that we molded together on top of the hardtop to support there 2 radar electronic package. As well as a custom radar mast to be mounted on top of our radar pod to have better visibility for the Simrad 4G Broadband that was installed. Some other items that we installed on the tower were our 63" control box, LED spreader light, LED overhead lights, nav lights, a custom swim ladder with sockets and a set of 50' - 4 spreader Rupp Hydrauilic Outriggers. 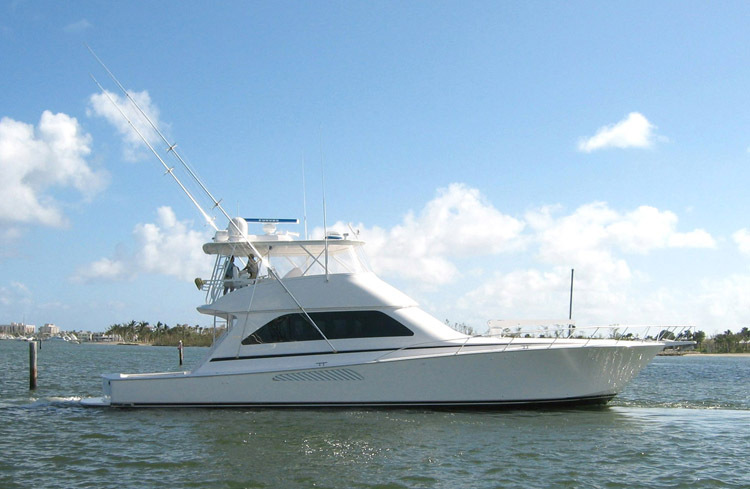 Viking Yachts / 82' - 0"
With this 12' gap tower you will tower above the rest at the dock. The tower comes complete with our new PBT stepped style radar pod, new Xeon 24V spreader lights and 49'- 4 hydraulic spreader Super Outriggers. This tower also has our new hardtop crown. 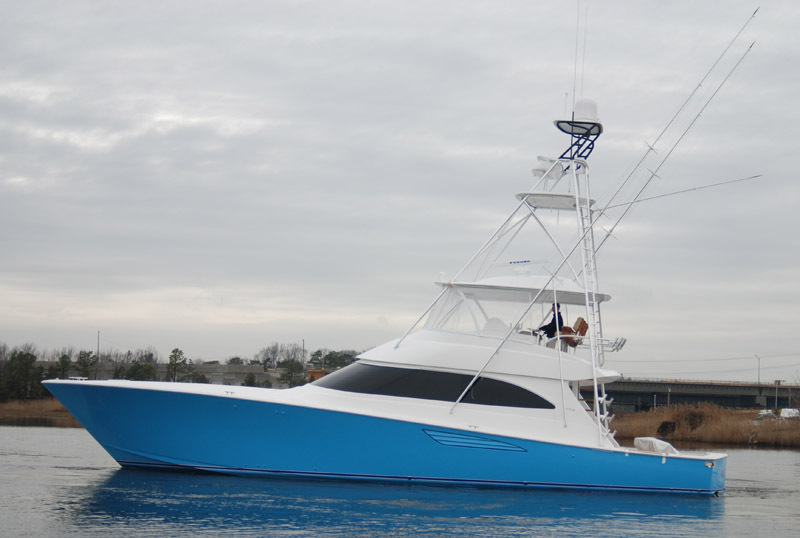 This 7' Gap tower on the 82' EB came complete with acrylic steps, nav lights in the platform, benchseat & backrest and our 65" Pod style control box w/ pedestal. The outriggers were 47'- 4 spreaders with hydraulic locking & layout arms as well. 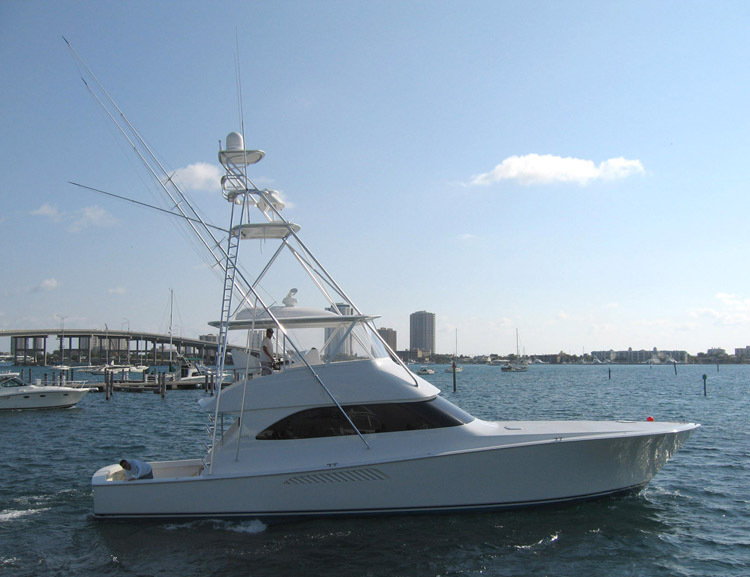 This 11' gap tower on the 82' EB came complete with acrylic steps, nav lights in platform, benchseat with backrest, our 65" control box with pedestal mount and recessed teaser reels in tower sunshade underside. We also installed a hailer horn on the underside of the platform inside the light pod. 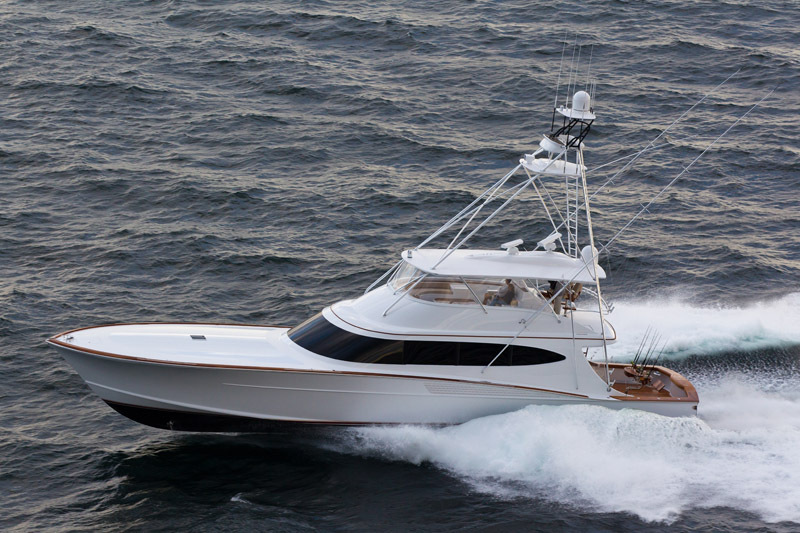 Maiora Yachts / 102' - 0"
This yacht received a custom fly bridge polished aluminum pipe frame with banded edge canvas to cover. The frame came complete with a manual retractable 9' x 9' wide "Moon Roof" per the customers specs. We also installed (6) tri-colored lights as well. 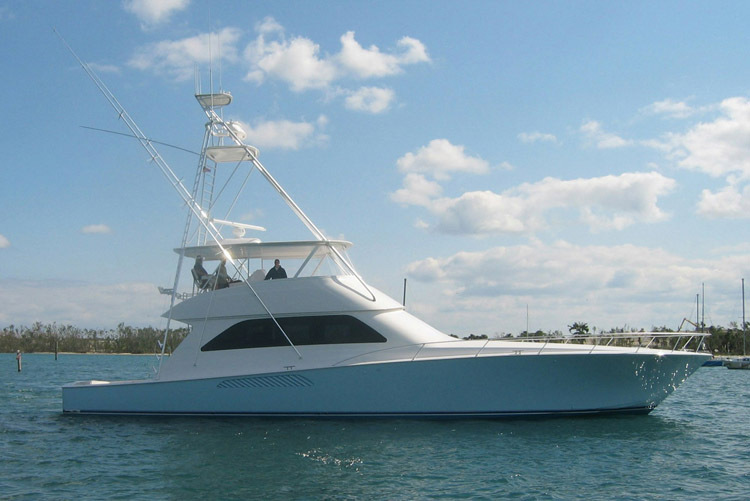 Jim Smith / 86' - 0"
Viking Yachts / 92' - 0"
Affinity Yachts / 90' - 0"
This custom Affinity Yacht received a 6' gap tower with all (4) legs mounted on top of the hardtop. 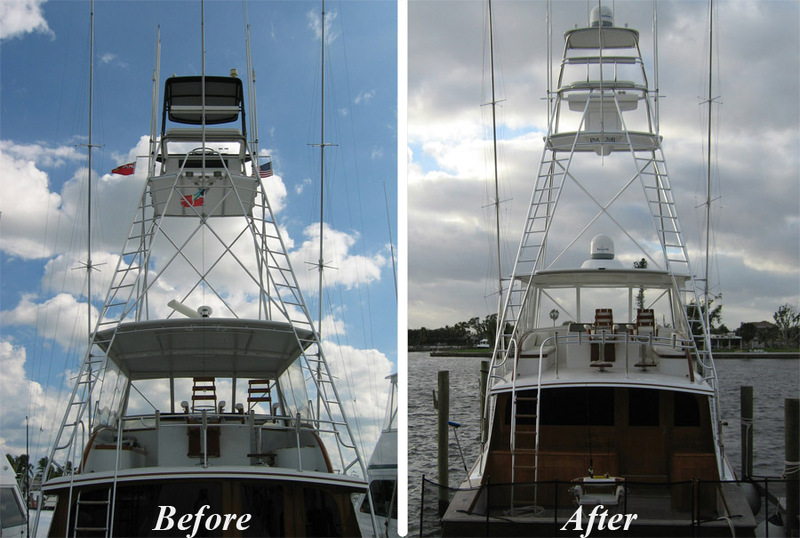 We built custom parts specifically for this boat including a wider sunshade, belly band and bridge ladder to the tower w/ teak steps. 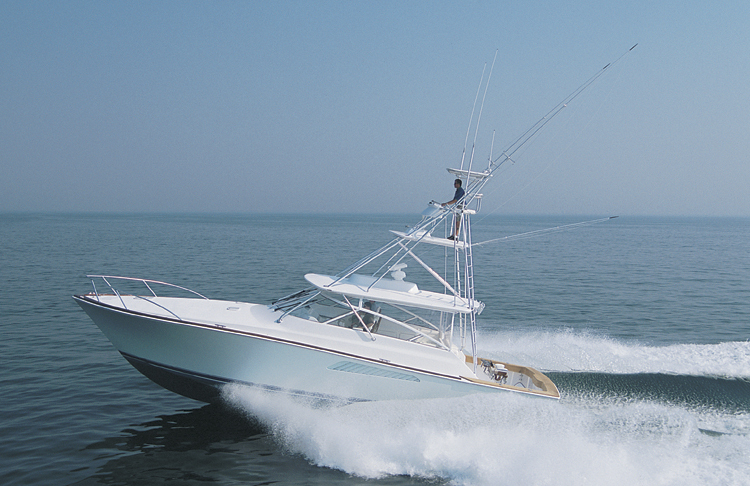 Sea Force / 91' - 0"
On this particular hull, we built the metal hardtop arch for the seaforce hardtop, the radar mast on top of the hardtop and installed the hydraulic outriggers. 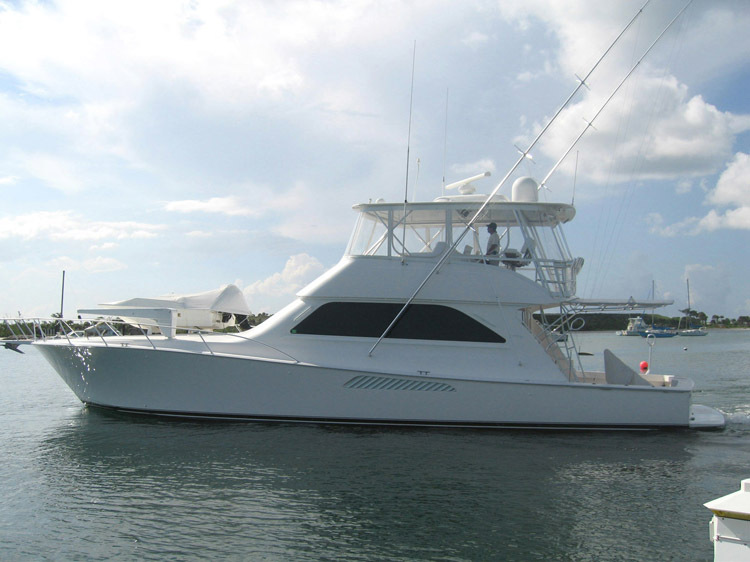 Jim Smith / 105' - 0"
PBT has completed alot of work for all different sizes of yachts, but this 105 jim smith was no small feat. 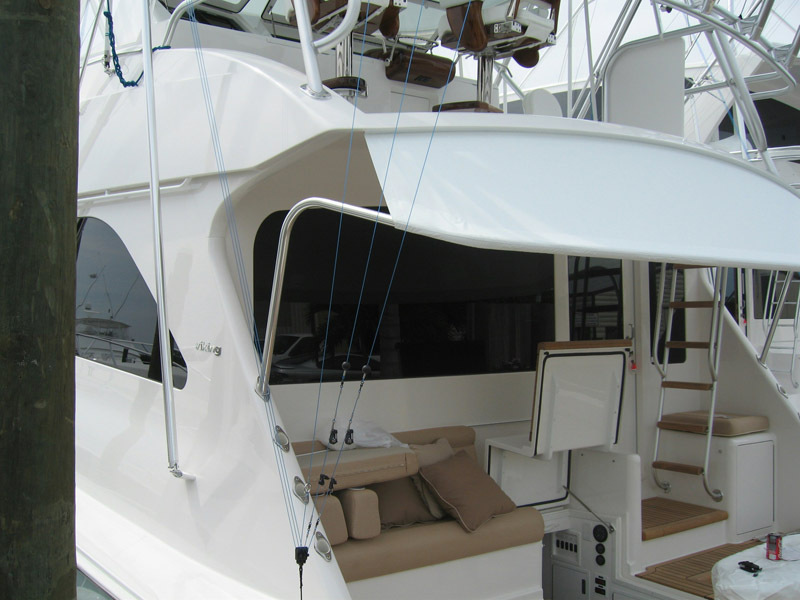 We started off with very detailed CAD designs for the hardtop and arch frame as well as the custom bow rail. Once these items were approved by the owner, captain and electronics company we started to move forward. But in the mean time, our welders/fabricators started building on site all of the custom railings, window railings and each custom ladder. We even built railings down in the engine room per jim smiths request. 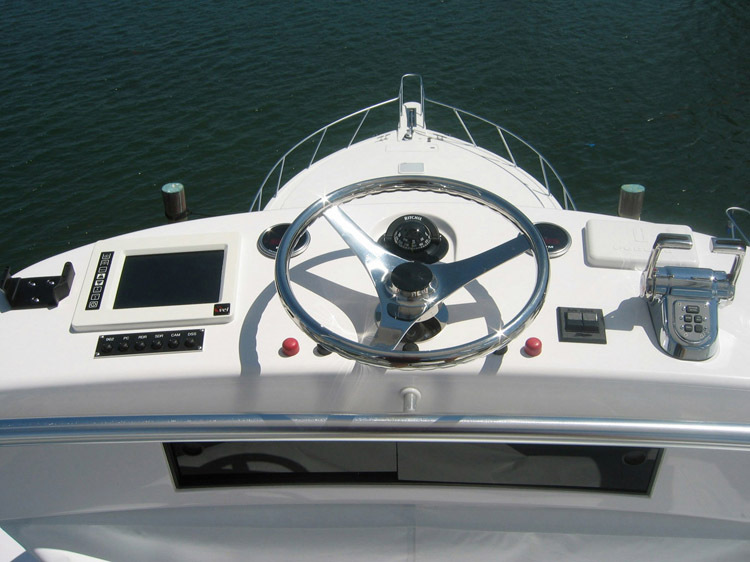 After everything was fitted to the boat and installed, it revealed some very detailed work by the PBT crew that would make any owner/captain happy to have us work with them. 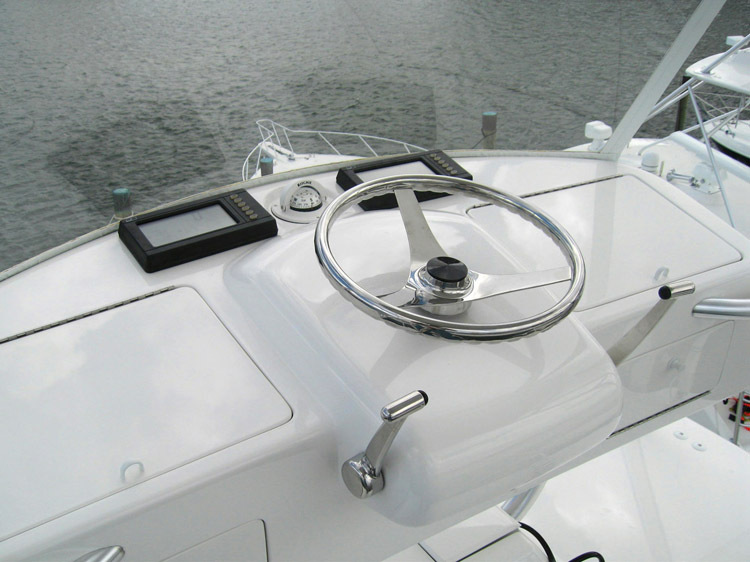 This wind screen attaches from the front of the control box to the top of the sunshade fiberglass.